Port D'Aviation, Grande Quinzaine d'Aviation Meeting Paris, used scarce sepia PPC showing Dirigble 'Ville de Paris', brown/white Meeting Vignette (Silombra type V6) folded over edge of card with 5c stamp attached in space provided, canc hexagonal 17-10-09 ds, Muller 38a 1500ff. 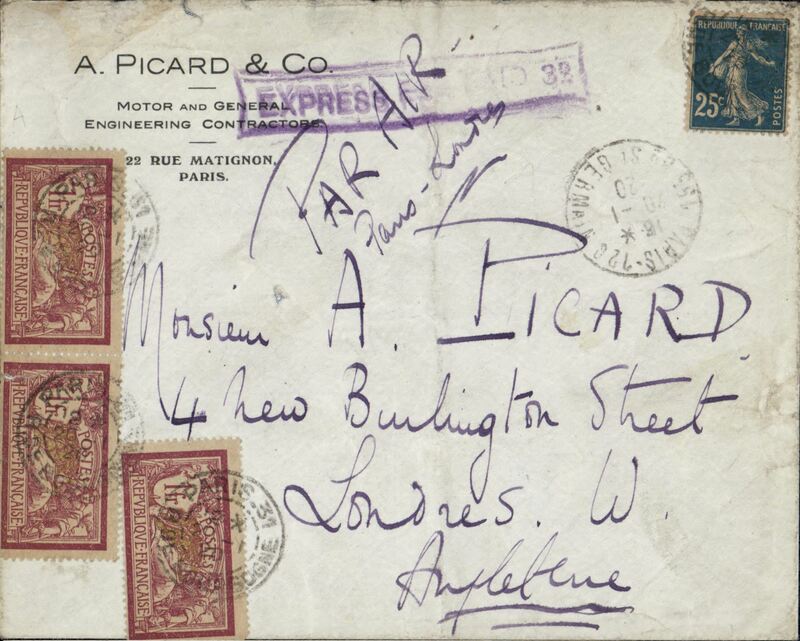 1920 Paris to London, ms 'Recu' 21-1-20 'on flap, franked Sower 25c and Merson 1f x3, posted at Rue de Burgoyne and handstamped at St. Germain on the same day, violet framed 'Express Fee Paid 3d', ms 'Par Air/Paris-Londres. 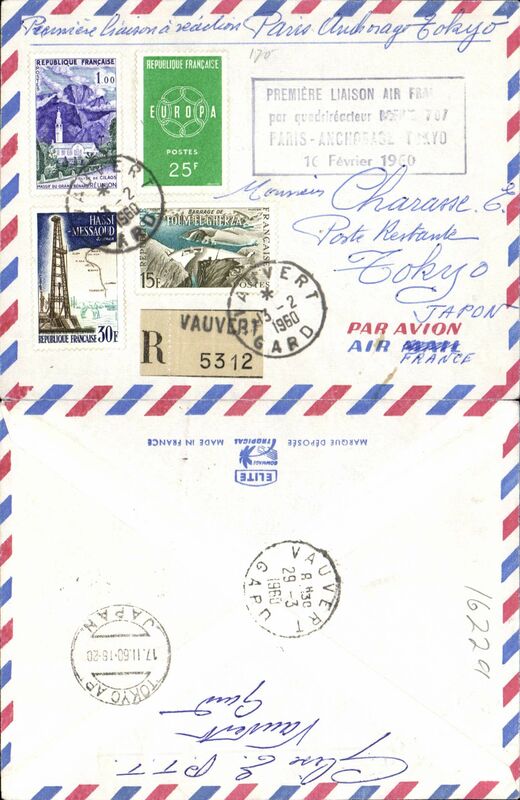 Postage of 25c was eqivalent to 2 1/2d, and an air fee of 3f was equivalent to 2/6d. 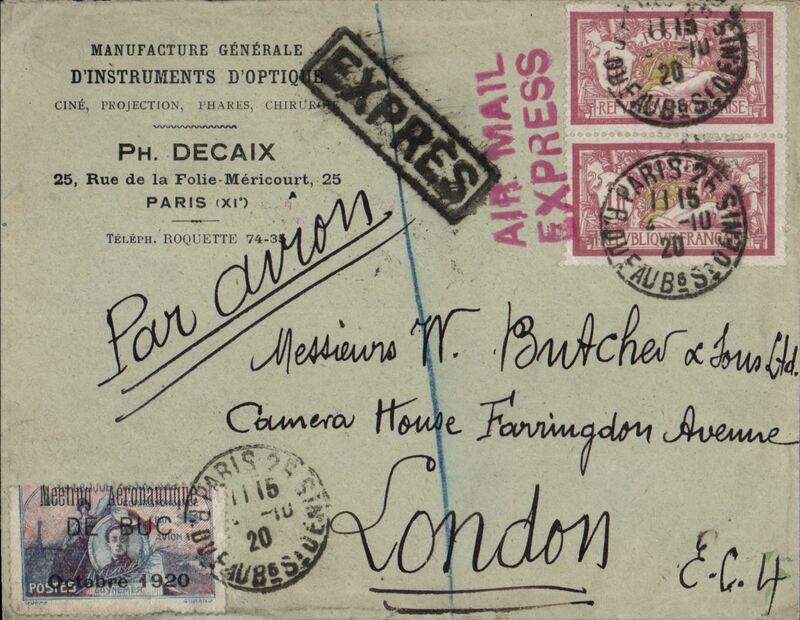 1920 Paris to London flight, bs 'London EC/ 18 (pm)/4 Oct 20' and 'London WC/4 Oct 20' ds's, commercial corner cover franked Merson 1f x2, canc Paris 11.45/4-10-20 tied by red two line "Air Mail/Express" hs, black framed 'Expres' hs. ms 'Par Avion', also special 'Meeting Aeronautique/De Buc/Octobre 1929' Guynemer label also tied by Paris 11.45/4-10-20 cds. This label had no face value but it had to be affixed to any item of mail posted at the meeting. 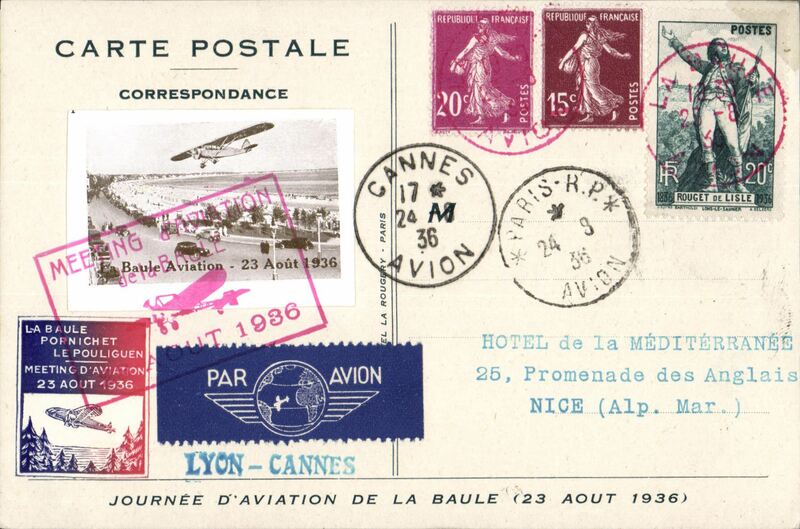 The first French use of the "Air Mail Express" cachet was on May 14, 1920. 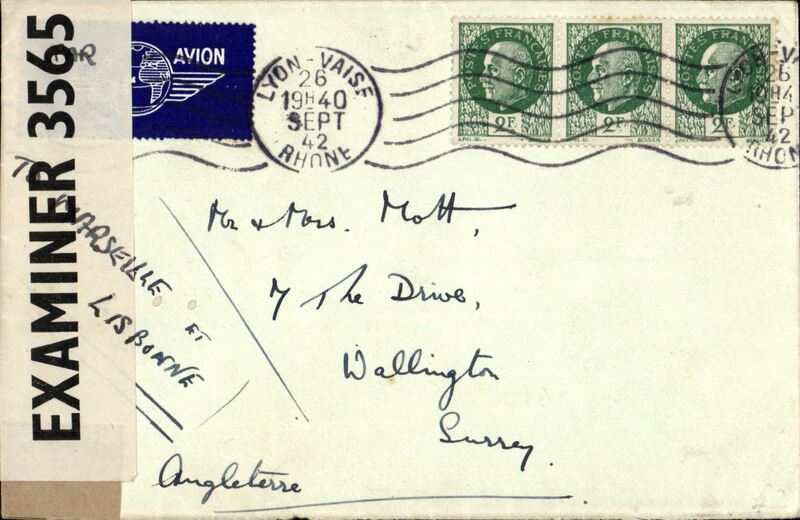 Early airmail, Paris to London, plain cover franked 50c Merson x2 canc hexagonal Paris/*R*gluck/12.5.21,official Guynemer vignette, ms 'Par Avion'. Image. Original PPC showing Le Bourget Aerodrome with Paris-London Airco flight ready to depart with flight crew, passengers and plane G-E .?P. 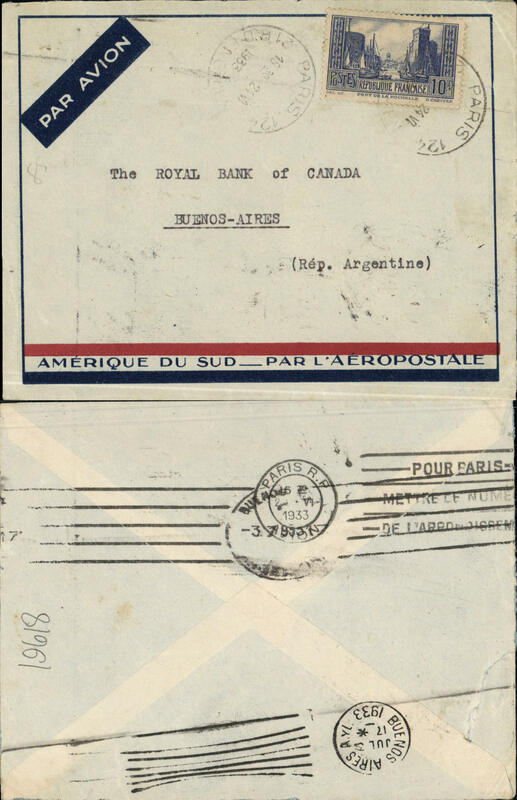 Scarce card addressed to Buenos Aires, franked 25c sower, ms 'recu le 5 Decembre de 1921'. Not flown. 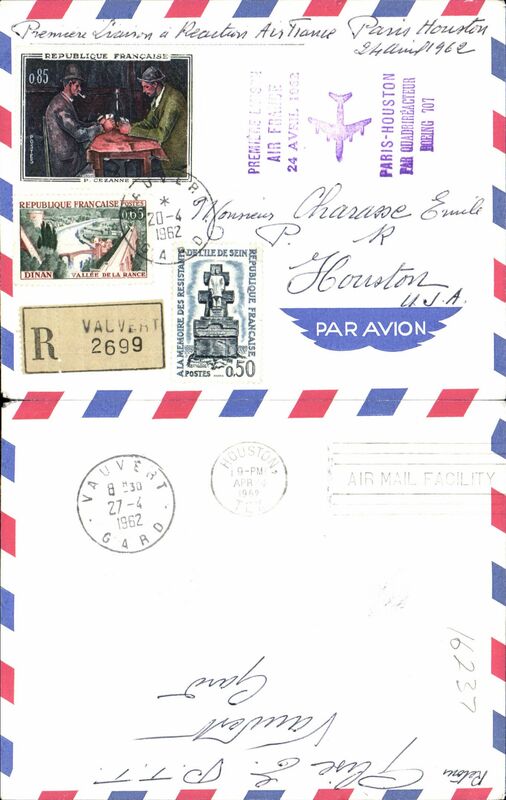 Paris to Dublin, no arrival ds, plain cover franked 25c and 50c Sower, canc Paris cds, also 1920 blue/red/white "Guynemer" pictorial etiquette (rated very scarce by Mair). 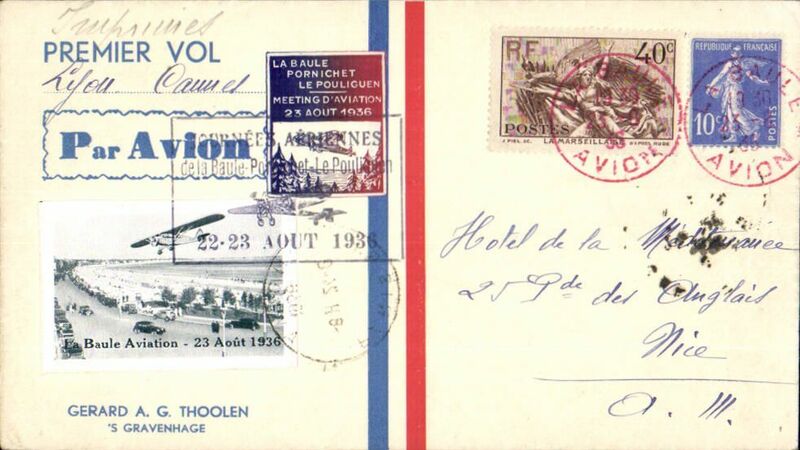 Rouen Aviation Meeting, plain cover flown to Paris 24/9, franked six 'Meeting' semi official stamps to 5F + 25c ordinary, canc Rouen Aviation cds, dark red/black etiquette. Amiens Air Meeting, cover franked Meeting set of five, also 25c ordinary, all canc Amiens Aviation cds, bs Oise 7/10, black/salmon airmail etiquette on front, and scarce Linges Aeriennes Latecoere red/yellow/dark blue vignette verso. Non invasive ironed vertical crease, does not detract. See image. 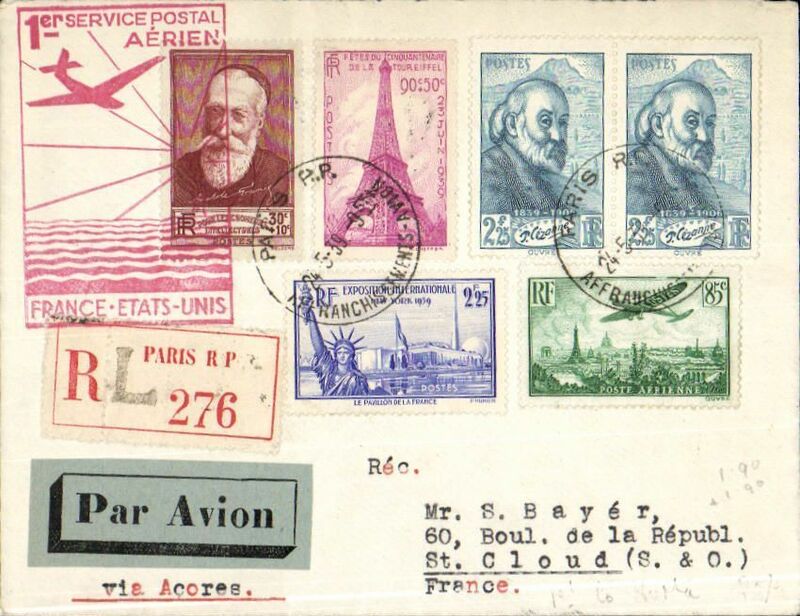 France to USA, early cover flown to London, no arrival ds, then by sea to New York, plain buff cover addressed to Chicago, franked 10c, 30c and 50c, canc hexagonal'Paris/18 11 23/Depart' postmark, fine strike "Par Londres/Par Avion" directional hs, black/dark red etiquette rated scarce by Mair. Likely carried from Paris-London by Air Union. Small defect front bottom rh corner, does not detract. Vincennes Aviation Meeting, plain cover franked semi-official souvenir set of 6, also 10c+15c Sowers, special cancellation, red/black etiquette, verso atractive red/white private vignette advertising fountain pens. 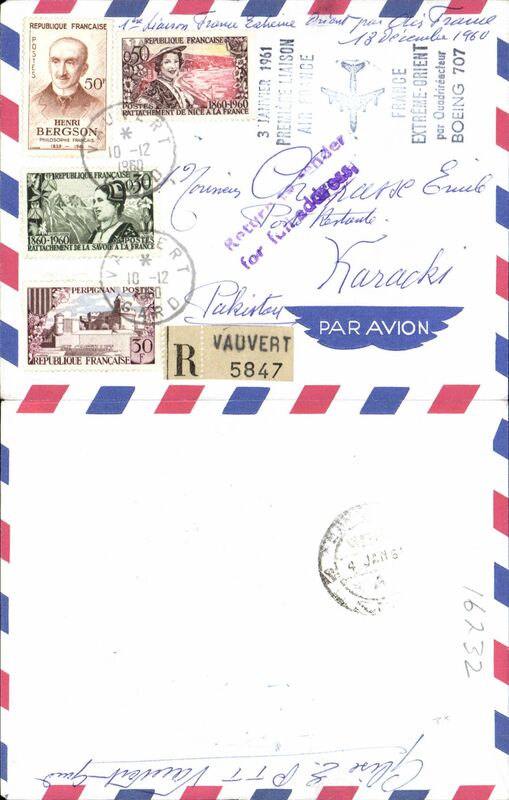 Lemaitre and Arrachard survey flight, Paris to Dakar, b/s 5/2, franked 25c canc Etampes de Banlieu cds, attractive flight vignette tied with blue oval flight cachet, black/red airmail etiquette, six line cachet verso giving details of flight. 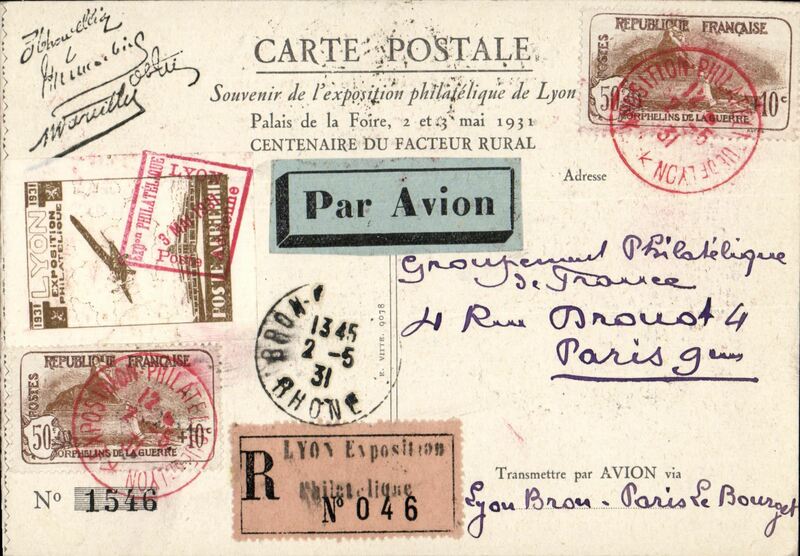 Lignes Aeriennes Farman, likely F/F Paris to Brussels, black postman's '285' in circle receiver on front, plain cover franked 1876 40c and 65c sower, canc Paris Aviation/Seine cds, black/terracotta airmail etiquette, ms 'Par Aion a Bruxelles'. The sender was John Davies, Liverpool, which increases the likelihood of this being a first flight. Bernard & Guilband pioneer flight, France to Madagascar, one of only 14 cards caried on the Las Palmas to Mauritania stage, attractive PPC franked 25c, canc 'Las Palmas/16 Oct 26/Canarias', 'Port Etienne/17 Oct 26/Mauritania' arrival ds on front, fine strike violet framed 'Voyage Aerien/France-Madagascar' flight cachet verso. 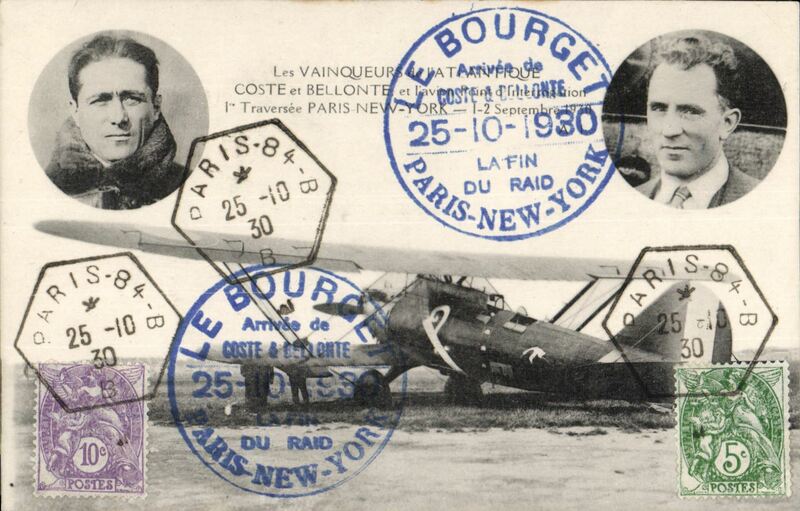 Costes and Le Brix non stop flight, Paris to Buenos Aires, plain cover franked 4F50 (Stanley Gibbons numbers 400d and 430), canc 'Bourget Aviation/10-10-27/Seine', special four line arrival cachet "Costes y Le Brix/Cubreiron 12400kilometress/en 72 Horas, Rfaid Aereo/Paris-Buenos Aires". 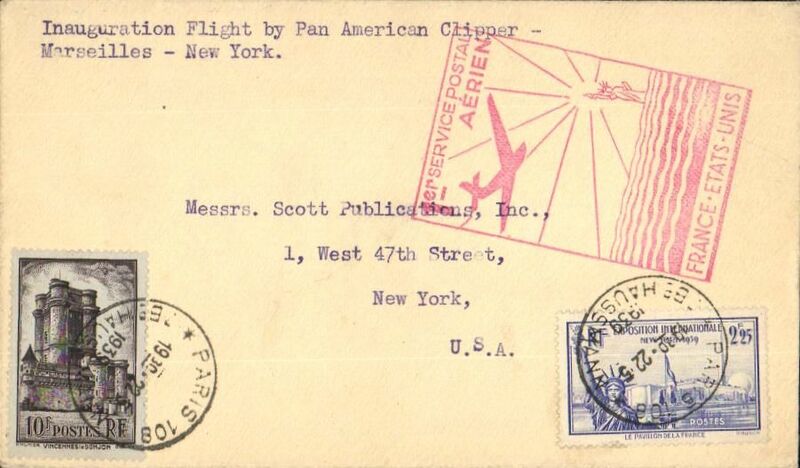 SeeAmericann Air Mail Catalogue, Transoceanic Flights #1063. Only 17 covers carried. A rare item in superb condition. Early Compagnie Generale Aeropostale pre Aviso South Atlantic airmail service using merchant ships (21 day transit France-S. America), Paris to Buenos Aires, black '1538' in circle mail reception mark of Buenos Aires Main Post Office, plain cover franked 12 copies of Sc.146: one strip of 4, one strip of 3 and two pairs, canc Paris/Seine cds, ms "par bateau Mosella via Dakar", dark red/black France airmail etiquette tied by postmark. 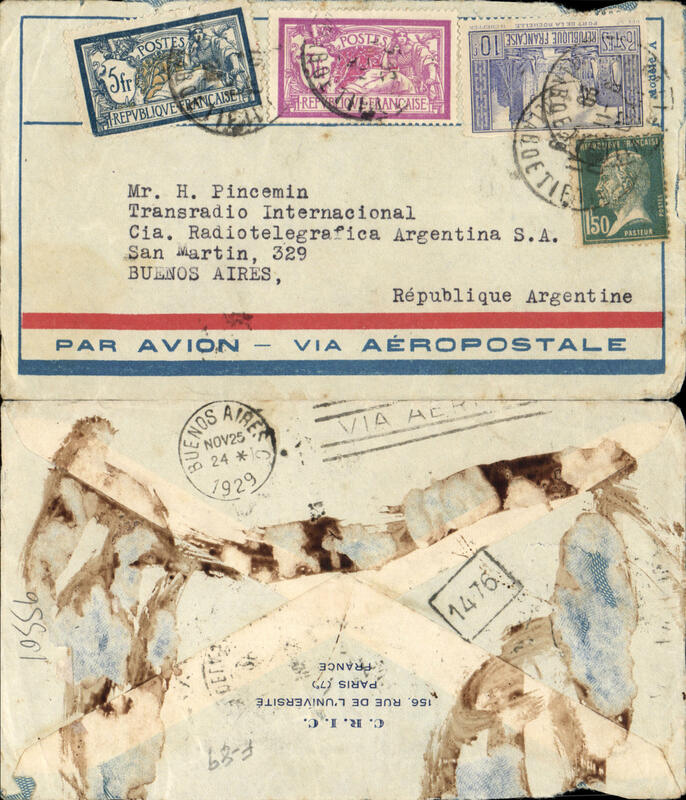 From Toulouse to Dakar (Senegal) by Aיropostale (this service started in 1925), then carried by merchant ship from Dakar to Bahia or Rio de Janeiro then flown to Buenos Aires by Aeropostale Aeroposta Argentina S.A.. Gum staining verso from mounting on album leaf, otherwise in good condition for early well travelled commercial cover. 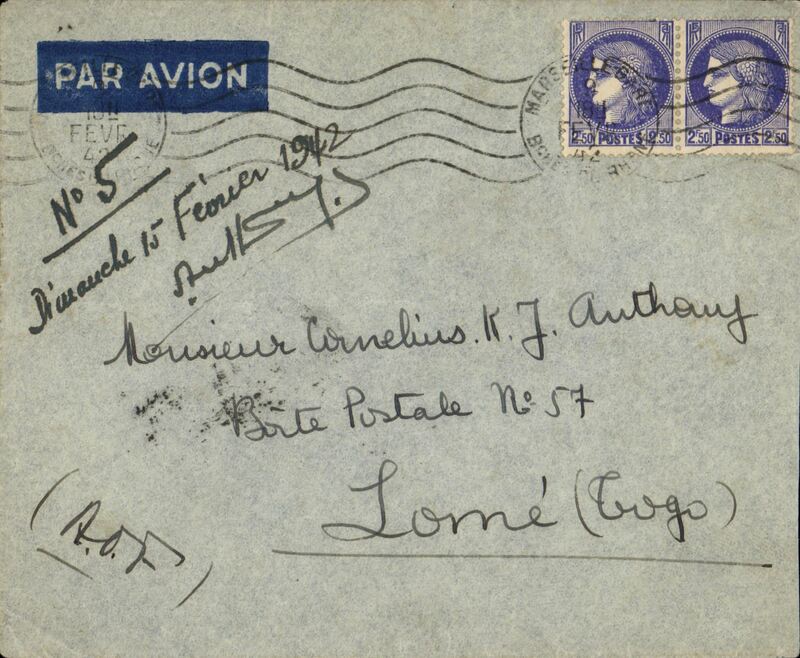 Aeropostale cover postmarked Toulouse (France) April 12, 1928 to Buenos Aires (Argentina) with arrival b/s April 24th. 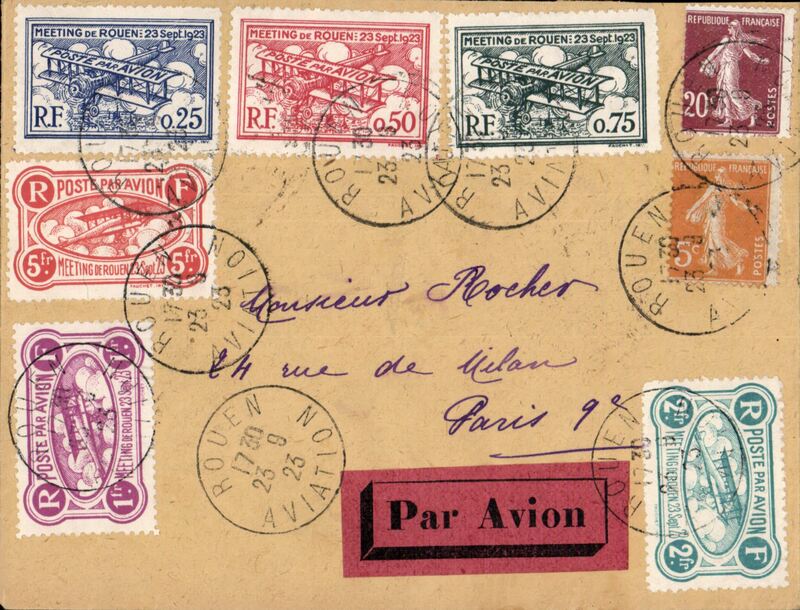 Red boxed rectangular hand stamp “Par Avion”. Very high franking of 47,40 francs including Sc.127, 130 and 4 copies of Sc.131 (Scott used value $7.50 in 1998). Very attractive cover with a light crease not affecting stamps. 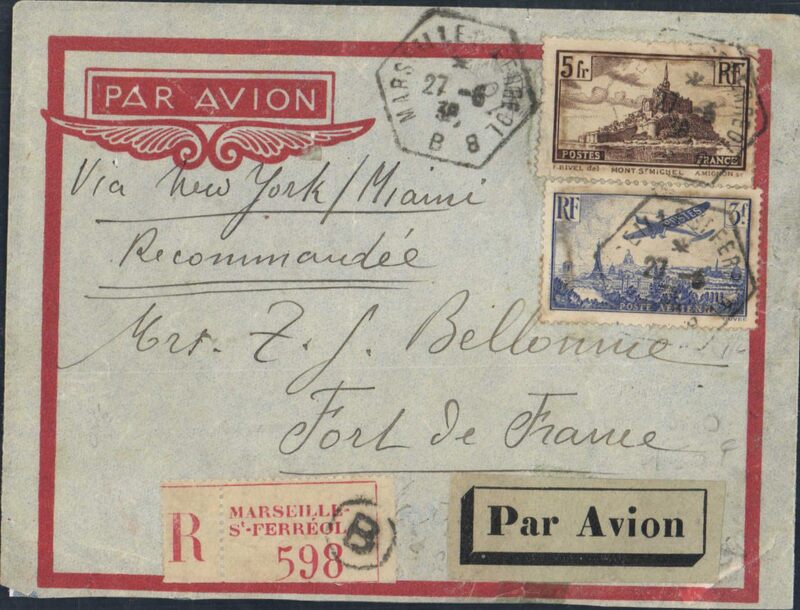 Early airmail, Paris to San Francisco, no arrival ds, plain cover correctly franked 1F50 overseas postage and 2F airmail surcharge. By sea across the Atlantic to New York, then US internal air service to San Francisco. 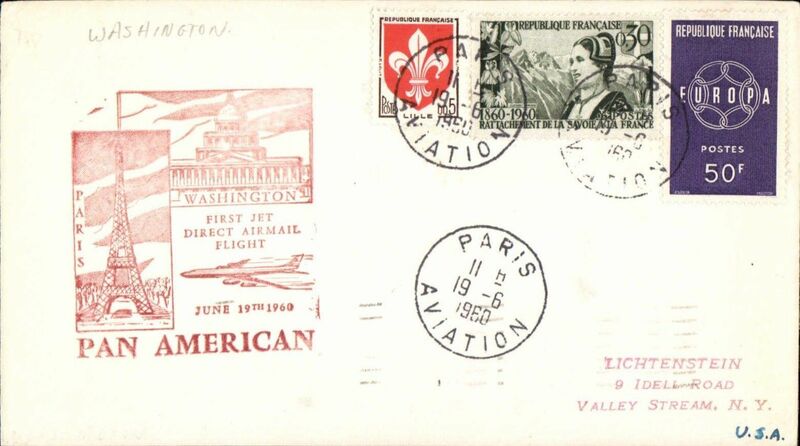 Air Union, first night flight Paris to London, bs 9/4, plain cover franked 2F10, canc Paris 8/4 cds, dark red/black par Avion etiquette rared scarce by Mair. 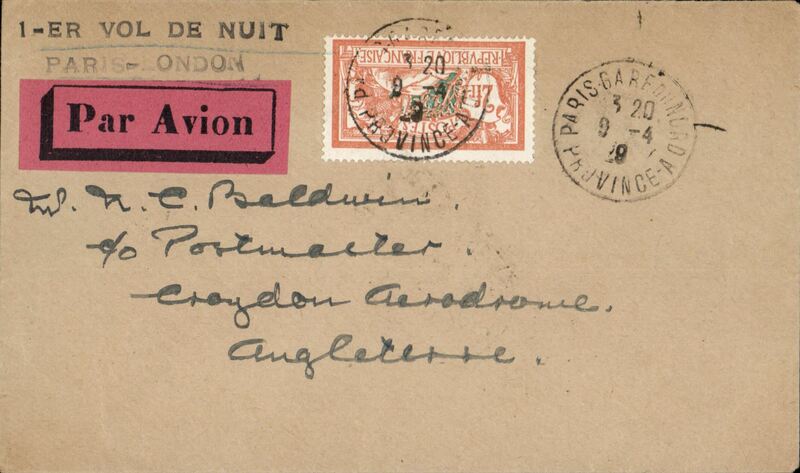 Air Union, first night flight Paris to London, plain cover franked 2F, canc Paris Gare 9-4-29, dark red/black par Avion etiquette rated scarce by Mair, blck two line '1-er Vol de Nuit/Paris-London'. Francis Field authentication hs verso. 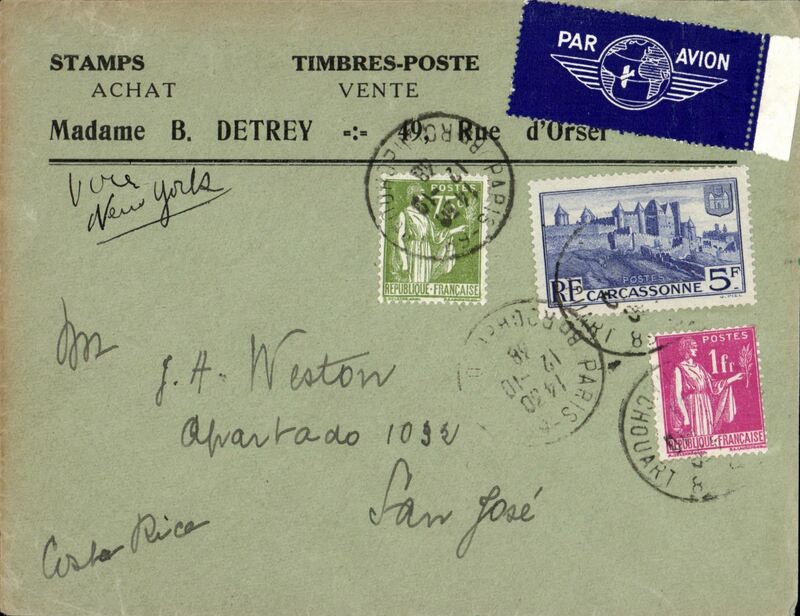 Aeropostale registered cover postmarked Paris June 8, 1929 to Rio de Janeiro (Brazil) with arrival b/s June 23. 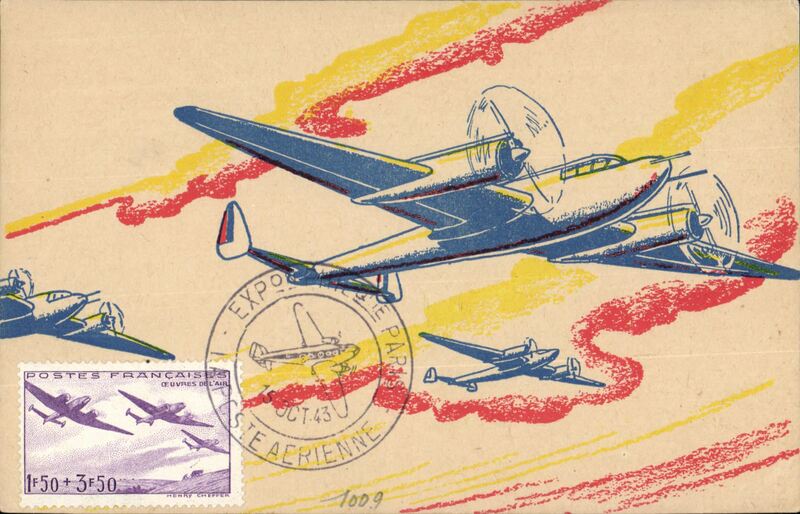 Red airmail label. 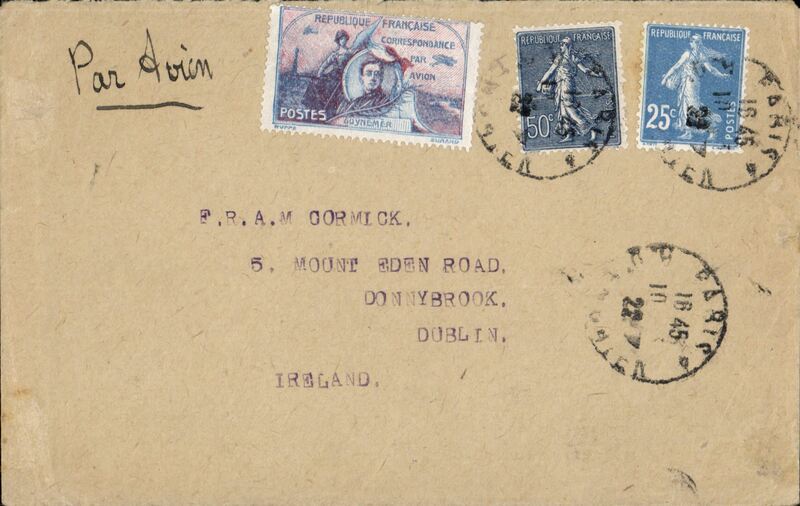 Commercial envelope with map on reverse and Paris Institute stamp. Small window cutting out return address. 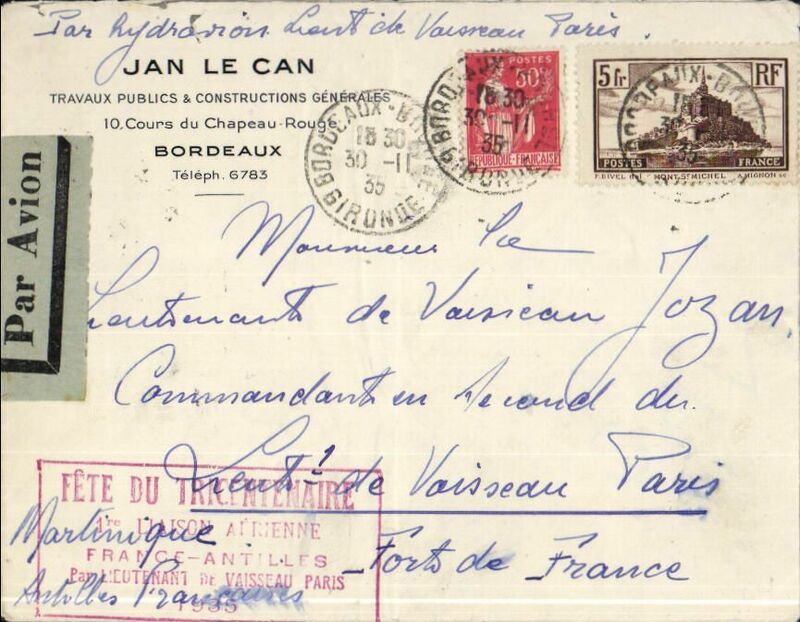 Franking includes a good copy of Sc.253 (Pont du Gard 20 Fr. stamp) valued at $32.50 (used) in 1998. 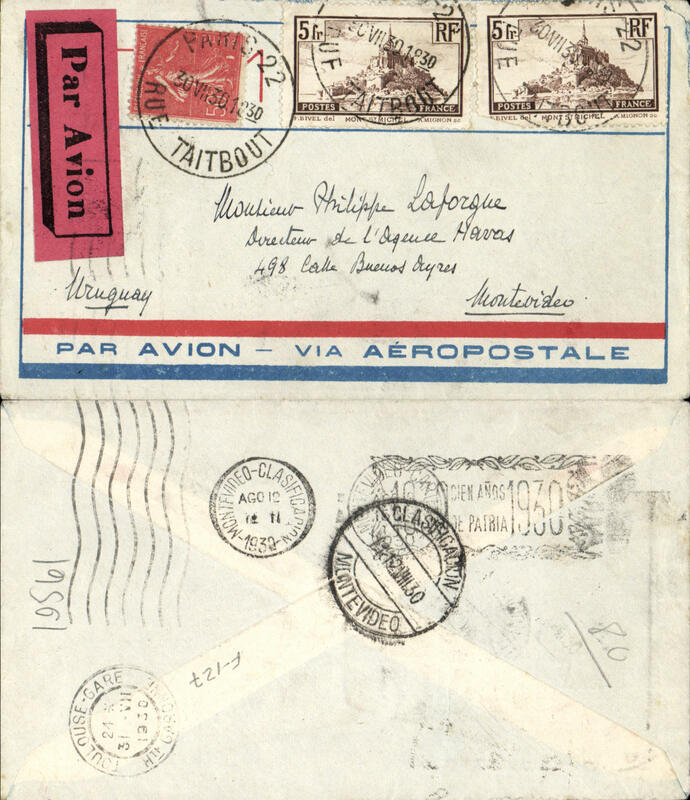 Pre-printed Aeropostale cover postmarked Paris November 9, 1929 to Buenos Aires (Argentina) with arrival b/s November 25. A very late arrival for this flight. The next Frame took off on November 17 and would not have carried the mail fast enough to make it for the 25th. Delays were frequent and not always registered. Franking includes Sc. 129, 130 and 251. Glue stains on back. 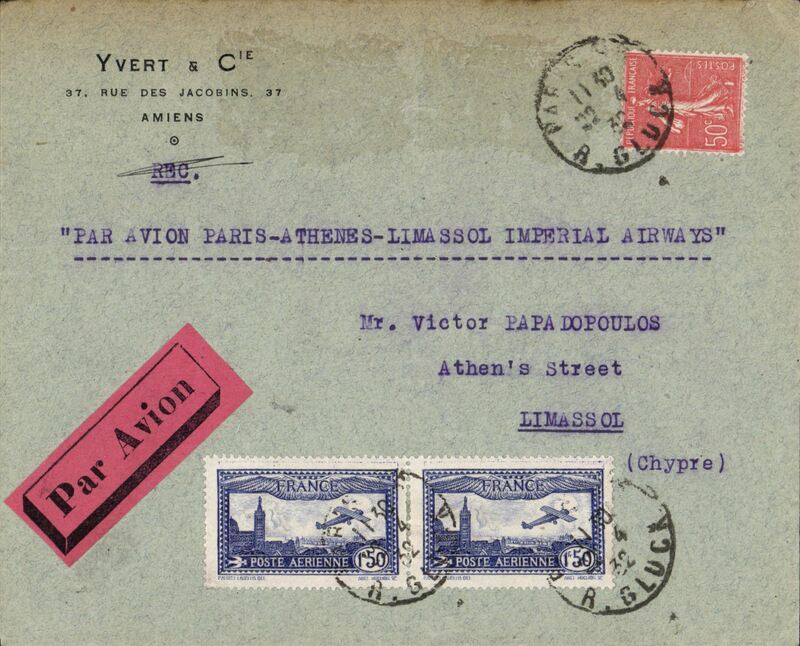 Pre-printed Aeropostale cover postmarked Paris December 21, 1929 to Victoria (Brazil) with arrival b/s December 29. Franked with Sc.130 and 131. Early Compagnie Generale Aeropostale aviso service(1/3/28-31/12/35) using fast ex navy destroyers (9 day transit France-S. America, of which 5 days were at sea), Arcachon (France) to Achiras (350 miles NW Buenos Aires), 1/4 arrival cds, via Dakar, fine strike Dakar Avion/Senegal transit cds, mourning cover franked Sc. 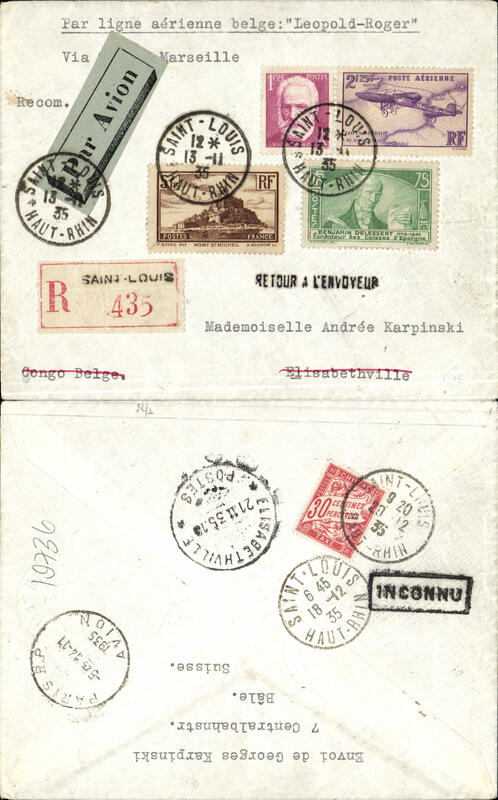 130 (3), 146 and 154 (4), canc Arcachon cds, dark red/black France airmail etiquette tied by postmark. 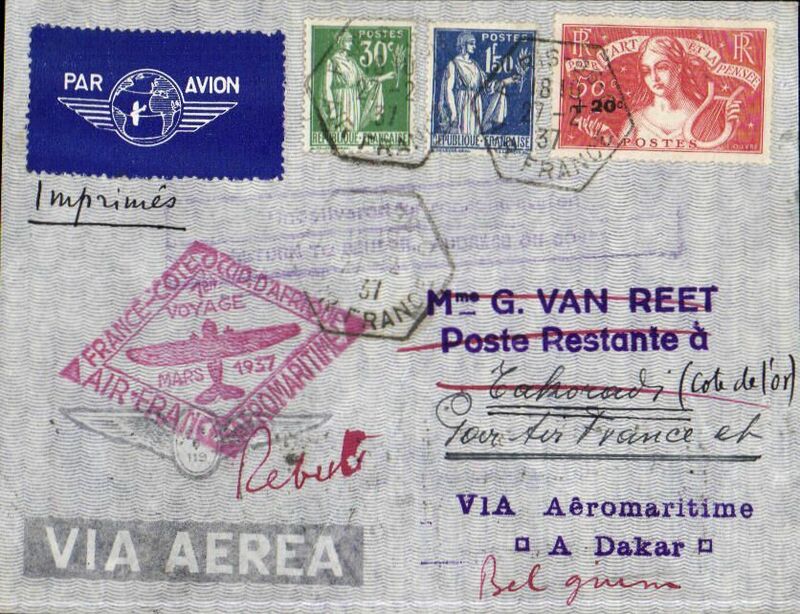 Flown from Toulouse to Dakar (Senegal) by Aיropostale (this service started in 1925), then carried by fast aviso from Dakar to Natal, then flown to Buenos Aires by Aeropostale Aeroposta Argentina S.A. Flap missing and heavy stains on back, but interesting none the less. 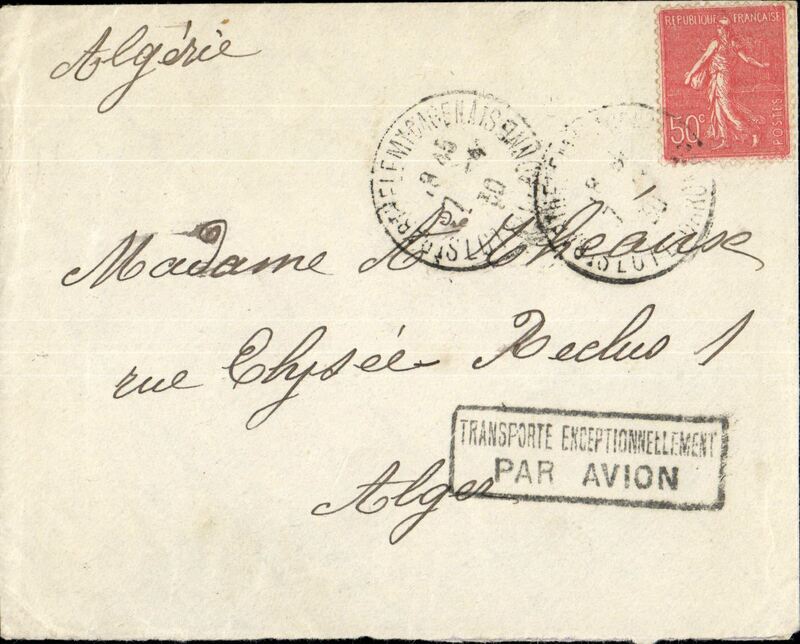 Air Union, Marseille to Tunis, bs 13/3, via Corsica, plain cover franked 50c for surface mail, but carried by air with fine strike "Transporte Exceptionellement Par Avion". 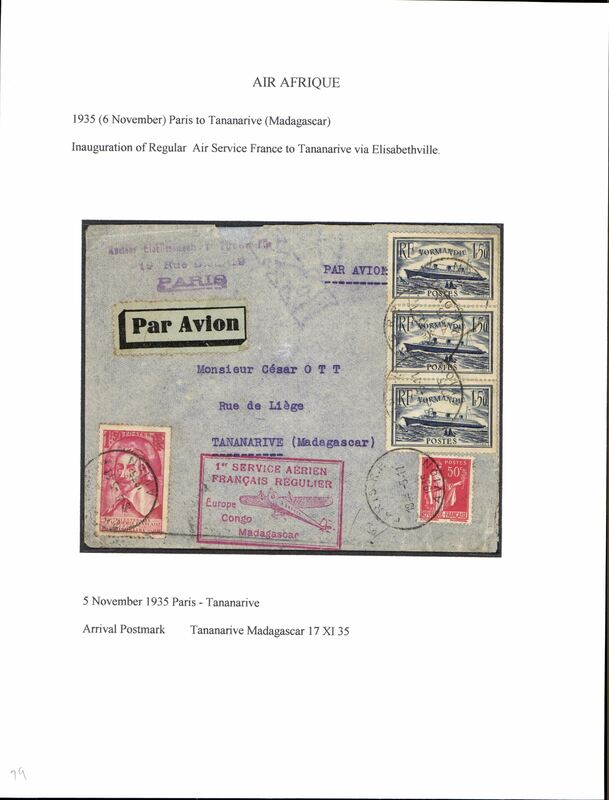 Early airmail, Paris to Madagascar, plain cover franked 50c at surface rate, nice strike black framed "Transporte Exceptionellement/Par Avion". 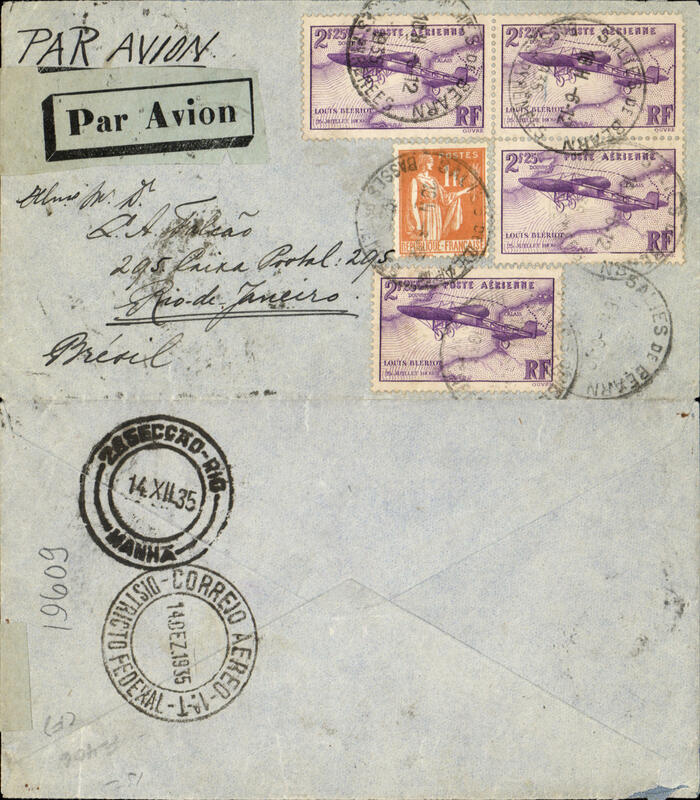 Post Office sent mail franked at surface rate by air when the weight paid for on the aircraft had not been fully utilised. A nice one for the exhibit. 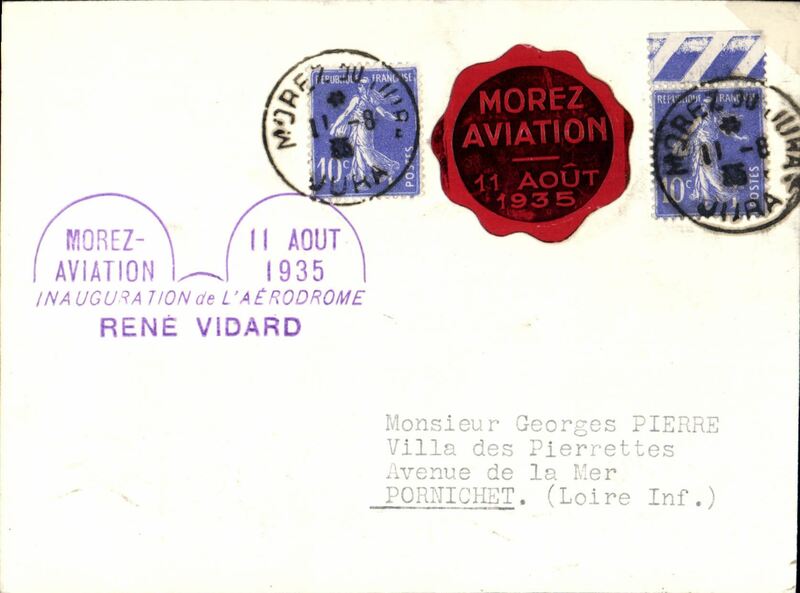 Vincennes Air Meeting, special card flown Vincennes to Casablanca, and return, franked FDI France red 1F 50c air, and 2x 75c Morroco airs verso, both canc cds. Image. 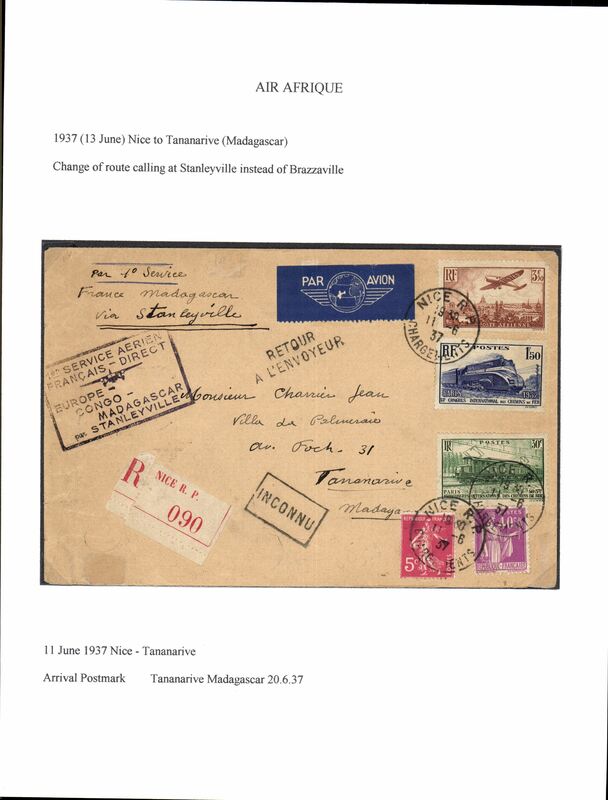 Pre-printed Aeropostale cover postmarked Paris July 30 with transit Toulouse b/s July 31st and Montevideo (Uruguay) arrival b/s August 12. 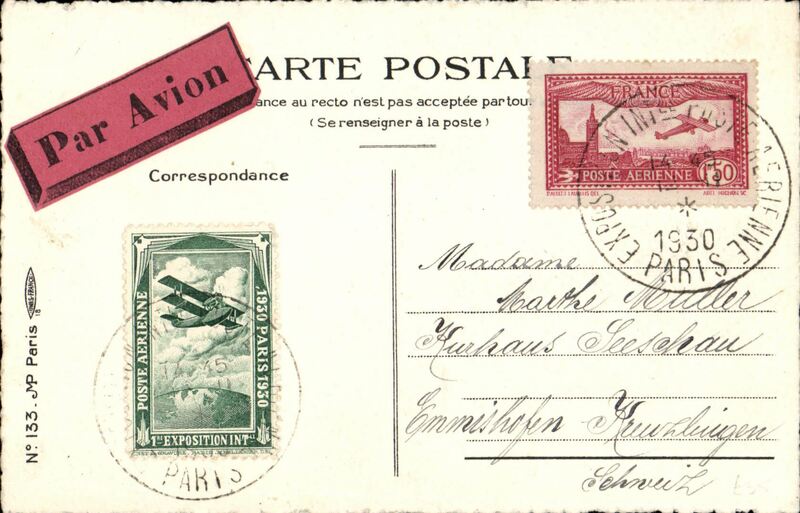 Red airmail label. Franked with two copies of Sc. 249. 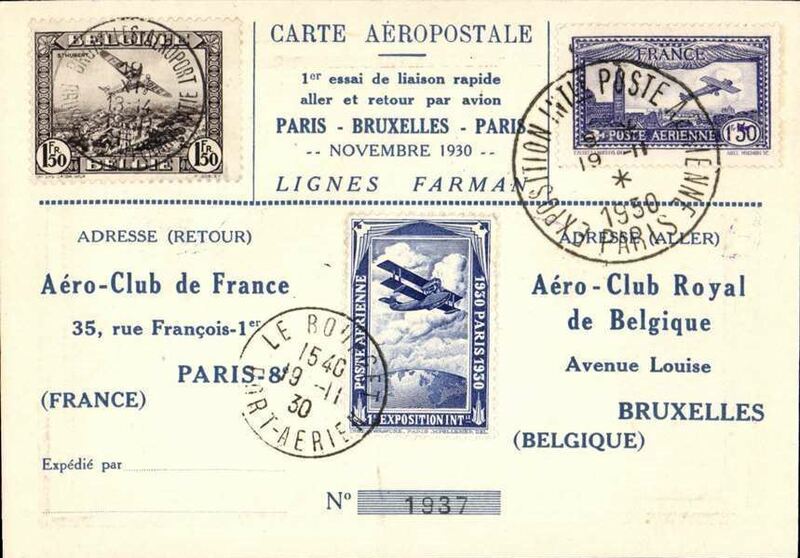 Paris-Brussels-Paris, special card with French and Belgian stamps, Expo Paris and Brussels cds's, and special Expo stamp canc Le Bourget cds, boxed rectangular Aero Club de France cachet verso. 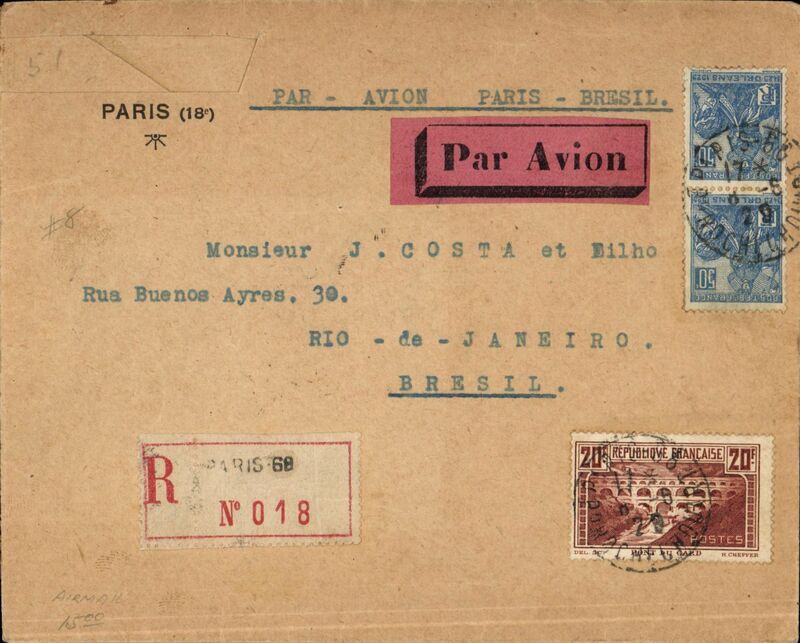 Pre-printed Aeropostale cover postmarked Paris January 31, 1931 to Bahia (Brazil) with arrival b/s February 7th. 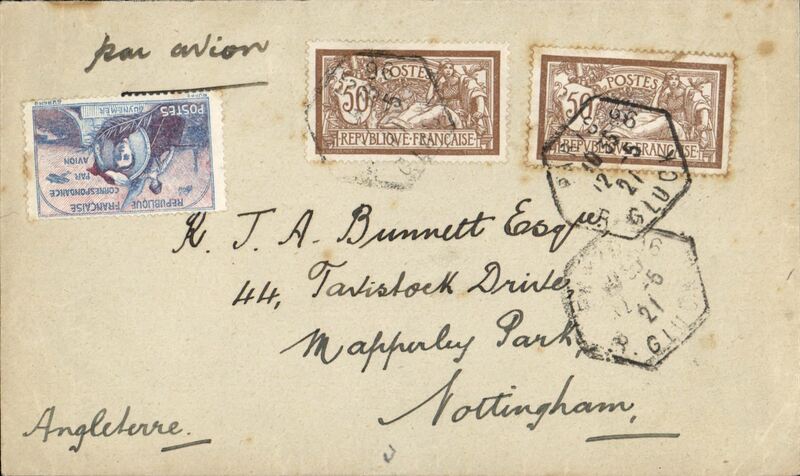 Franking is made up of Sc.261 (1F 50 Colonial Exhibition issue) including a pair and a strip of 4. 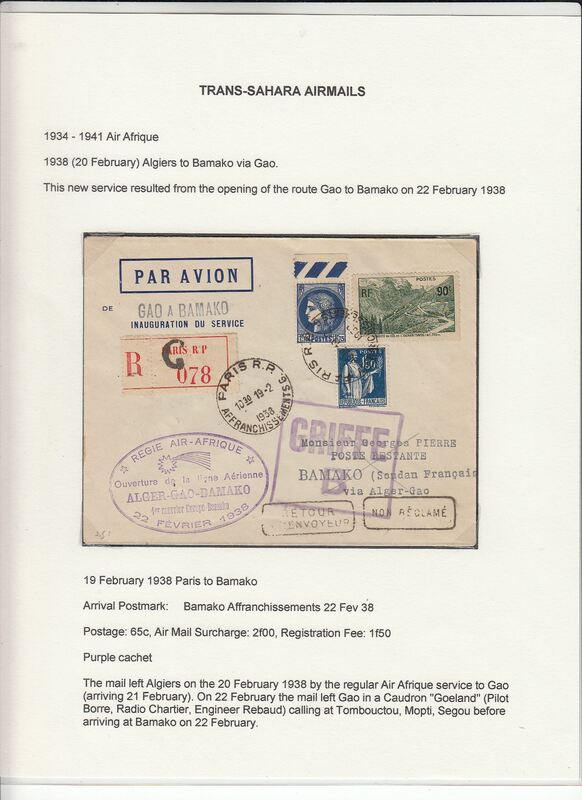 Air Afrique, Trans-Sahara airmail, France acceptance for F/F Algiers to Bamako, French Sudan, via Gao, bs 22/2, registered (label), imprint etiquette cover franked 65c postage, 2F airmail surcharge and 1F50 registration, flight cachet. 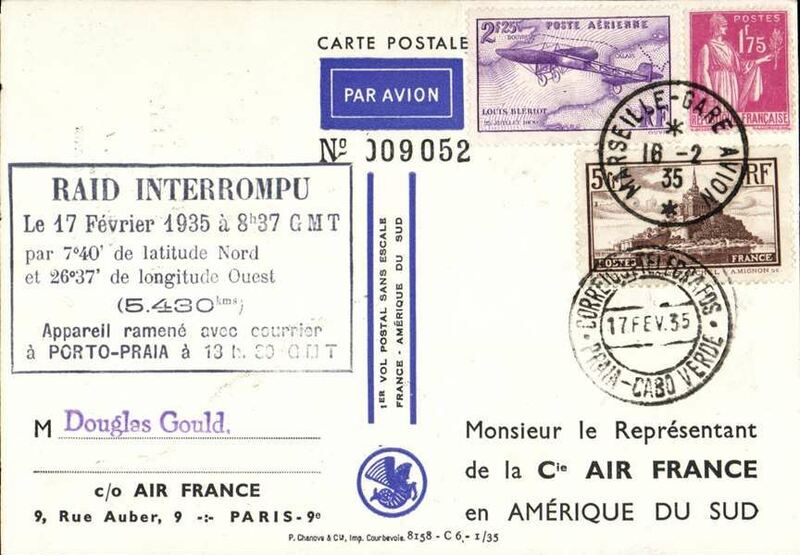 Displayed on exhibition page with text documenting the carrier airline(s), the route, and the postage rates applied to this particular item - important supplementary data which would otherwise be difficult to gather. 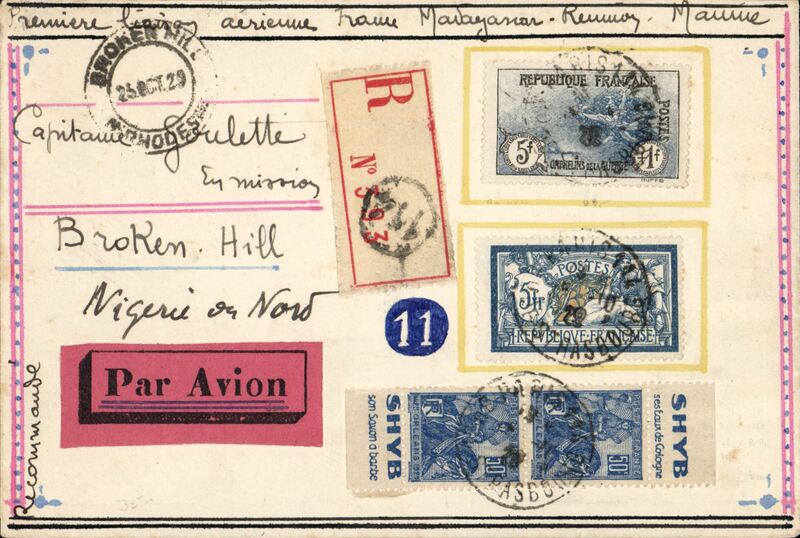 Scarce mixed franking acceptance of French mail for carriage on the Imperial Airways Second Experimental Flight to Australia, bs Darwin 11/5, Smye cover franked France 80c canc Le Bourget 21-4-31 tying blue/white airmail etiquette in turn tying IAW pale blue/yellow/black 'Give Your/Letter Wings' vignette, and GB 2d, 4d, 10d each canc London FS Air/21 AP/31. No cachets used with the exception of Singapore. Super item. Image..
Lyon Philatelic Expo, registered (label) souvenir card franked 2 x 50c +10c 1926/7 War Orphans' Fund, Brown/white Expo vignette tied by red framed Expo hs, pale blue etiquette. 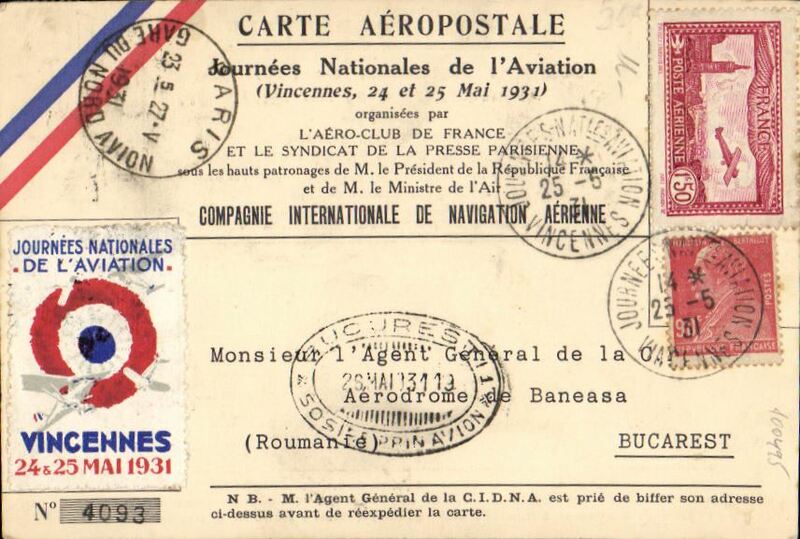 Vincennes Meeting, special flight Vincennes to Bucharest, and return Bucharest to Paris, French and Roumanian stamps, attractive special souvenir card and vignette, all relevant hs's and cancellations. 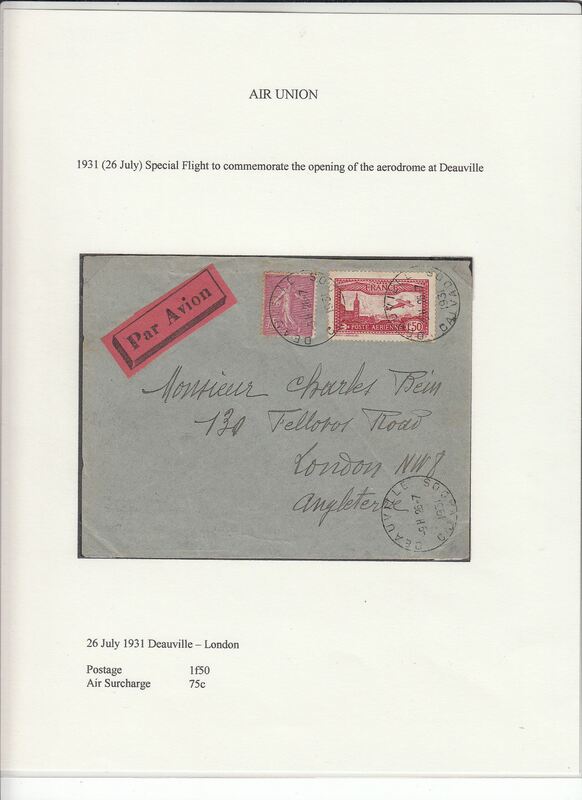 Air Union special flight to commemorate opening of aerodrome at Deauville, Duaville to London, plain etiquette cover franked 1f50 postage and 75 air Surcharge. Only 35 flown. 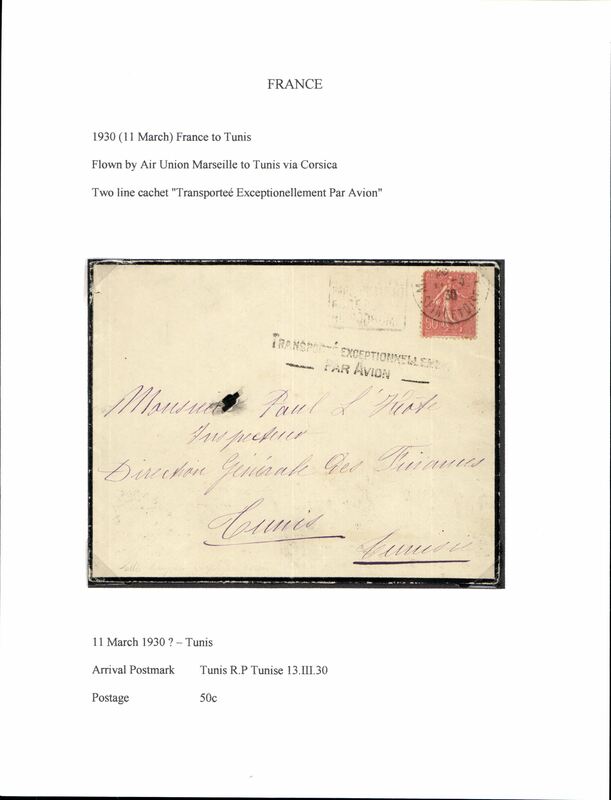 Displayed on exhibition page with text documenting the postage rates applied to this particular item - important supplementary data which would otherwise be difficult to gather. Limoges Aviation Meeting, registered (label) souvenir PPC franked 45c Sower canc special red cds, and special blue oval Exhibition cachet tying special blue/white vignette. 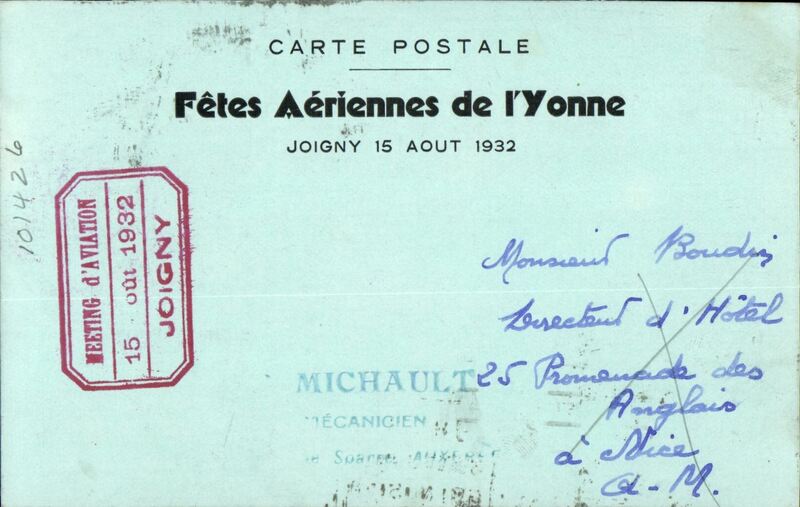 Joigny Aviation Meting, illustrated card franked 20c and Expo vignette tied by Joigny cds and red framed Expo cachet. 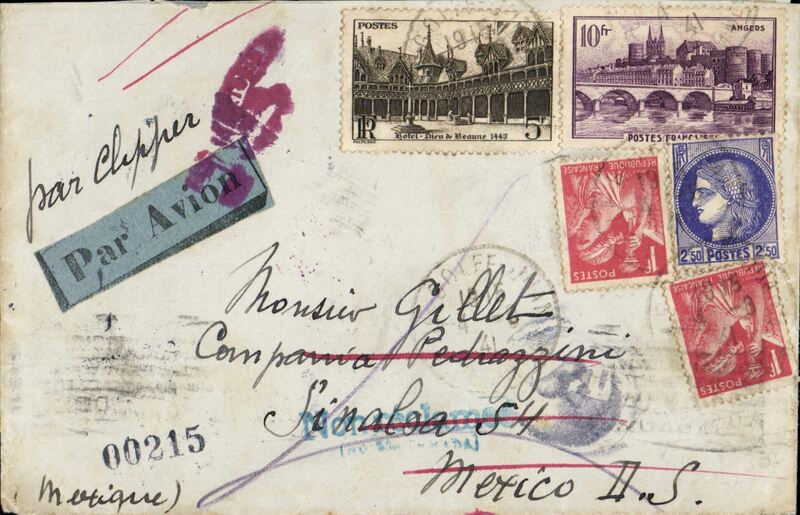 Cover from Paris postmarked June 24, 1933 to Buenos Aires with arrival b/s July 3, 1933. Single 10F stamp (Sc. 252). 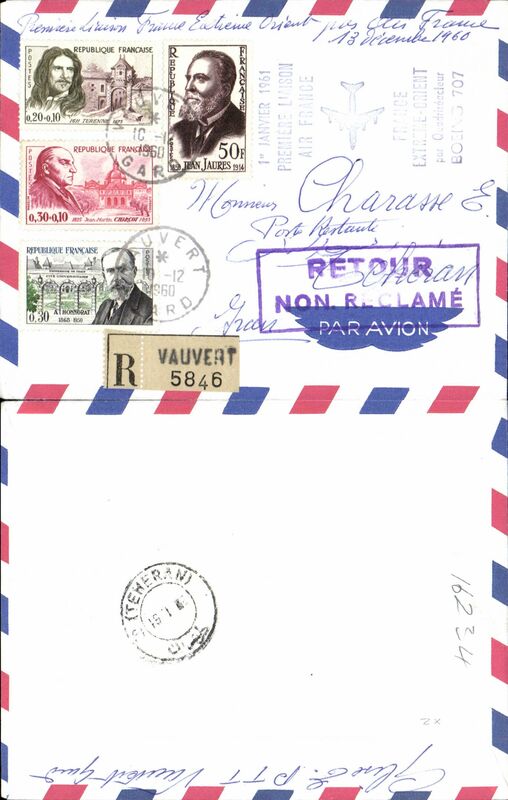 “Amיrique du Sud par l’Aיropostale” special envelope. In 1927 November CGA opened the Argentina-Natal air service (there was an air service from Bahia and Rio to BA before then). On March 1, 1928 the ex navy ships Aviso service began. 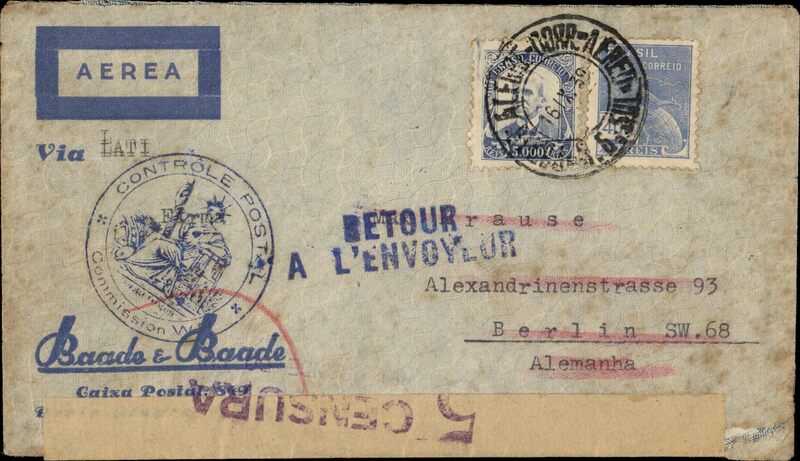 Societe Centrale pour l'Exploitation de Lignes Aeriennes (SCELA), Paris to Budapest, bs 4/7, via Paris RP Avion 3/7 and Strasbourg Gare Avion 4/7, commercial corner cover correctly franked 1F50 overseas postage and 75c airmail surcharge. On 17/5/33 Air Orient, Air Union, CIDNA and SGTA (Farman) combined to form SCELA in order to negotiate with the French Government about the formation of a national airline. 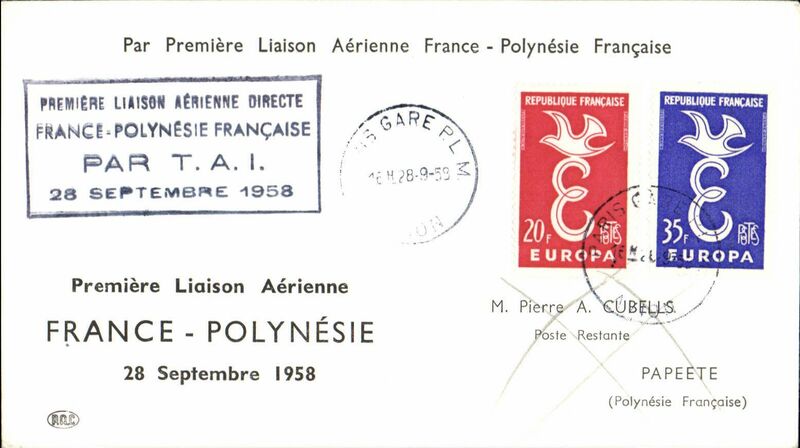 On 30/8/33 it was agreed that SCELA and Aeropostale would combine to form Air France. A nice exhibit item - SCELA only existed for 3 1/2 months. 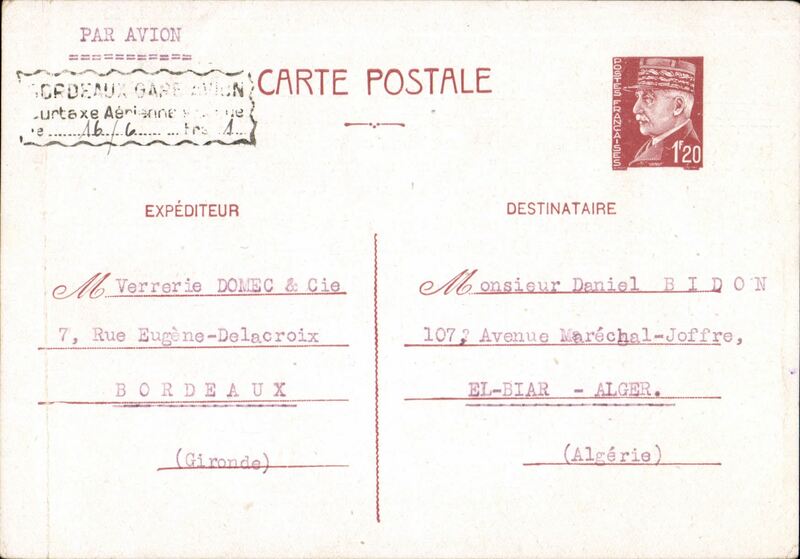 Compagnie Gיnיrale Aיropostale (CGA) service from Toulouse and Marseille to Casablanca (Morocco) and Dakar (Senיgal), Arcachon to Dakar, bs 21/8, via Toulouse, 19/8 transit cds, plain cover franked 3F50 Scott 283 (pair), grey blue/black airmail etiquette. 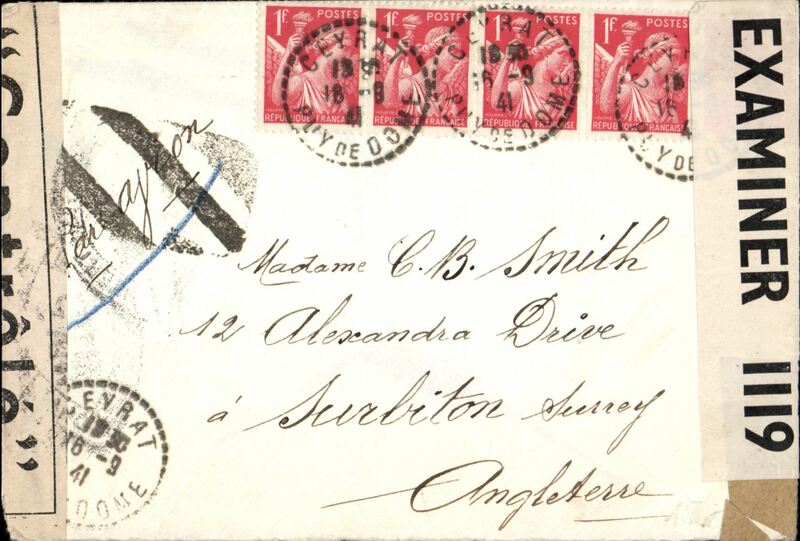 Scarce with all the postmarks. 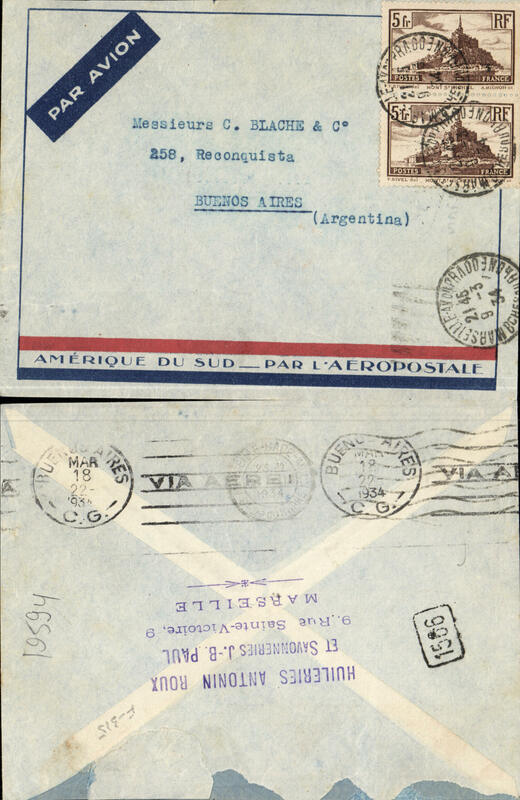 Pre-printed Aeropostale cover postmarked Marseille March 9, 1934 to Buenos Aires with arrival b/s of March 18. Franked with Sc. 250 (pair). 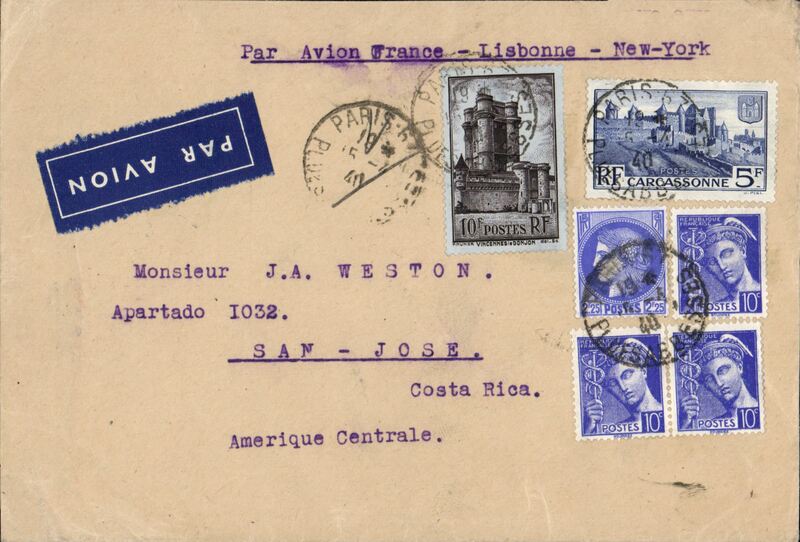 Special “South America by Aeropostale” envelope used here although Air France had taken over Aeropostale in 1933. Roughly opened verso. 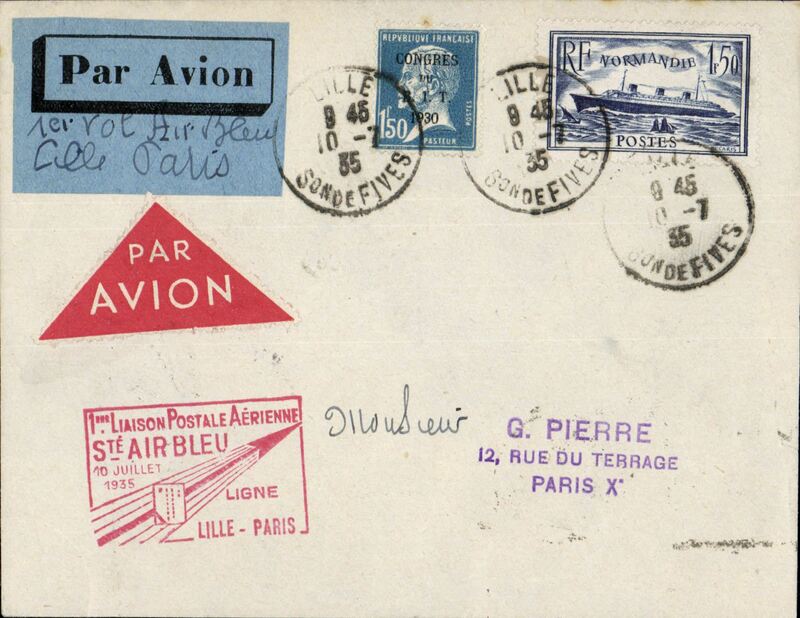 Paris to Chicago, via Paris Avion cds, Hotel Lotti, Paris cover franked 4F, to Chicago, grtey/black airmail etiquette. 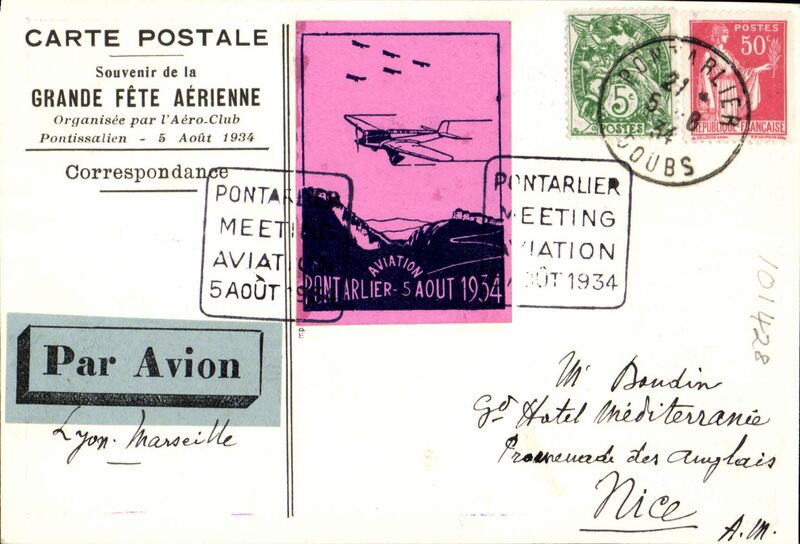 Pontarlier Aviation Meeting, souvenir illustrated card to Nice, via Lyon and Marseille, special vignette and cachet. Arbois, Jura, Aviation Meeting, souvenir illustrated card to Pontarlier, special vignettes and cachets. 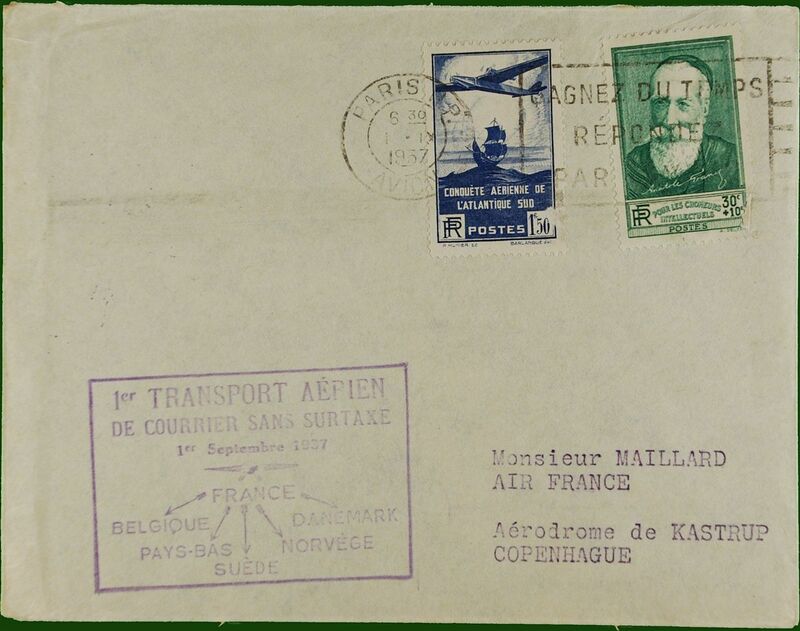 Early Express Airmail cover, Paris to London, bs 9/11/34, Agence Rol (Photography) corner correctly rated 30c printed paper rate, air surcharge (25g) 1F50 (2x 75c per 20g), and 3F Express Fee, pale blue/black airmail etiquette, red/black 'Express' label, violet 'Par Express' and framed 'Express Fee Paid 6d' hs's. Express airmails are uncommon, also a nicely documented rate study. 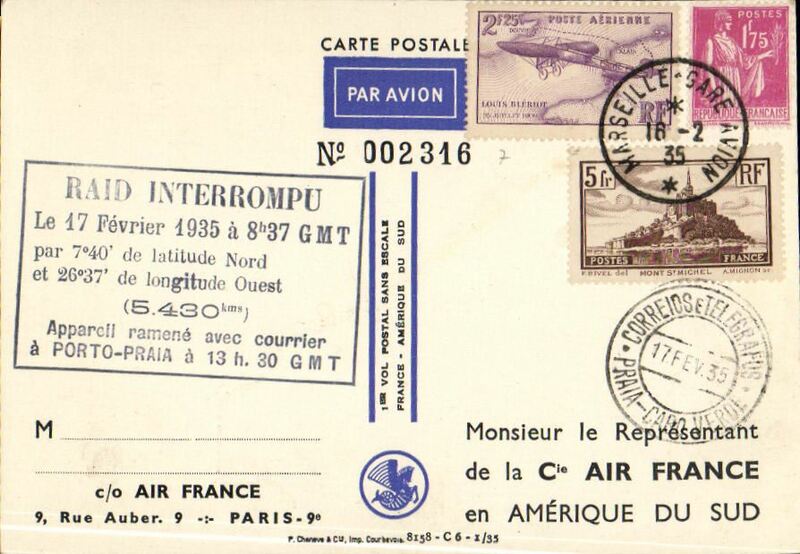 Paris to Ruopio, Finland, bs 13/2, via Paris RP Avion 8/2, airmail etiquette cover correctly franked 1F50 overseas postage and 75c air surcharge, uncommon destination. Attempted direct non-stop flight by Codos and Rossi, Istres to Argentina, forced down at Porto Praya, Cape Verde Is, arrival ds 17/2 on front, black seven line cachet, Air France special souvenir PPC. South Atlantic route. 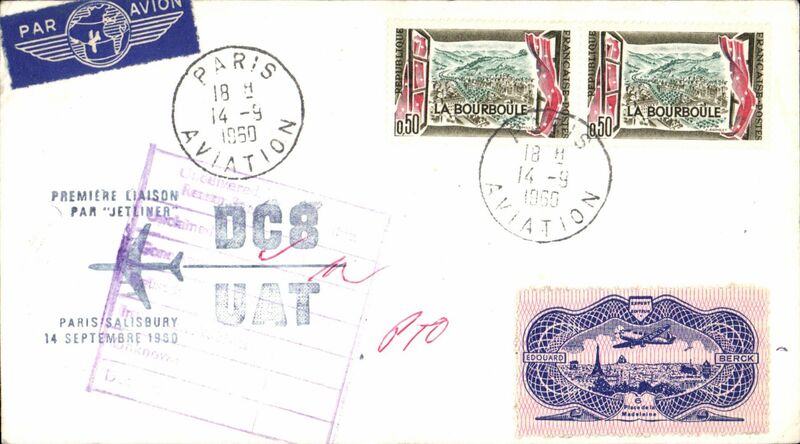 Early airmail, France to Costa Rica, bs San Jose 9/3, via Paris 20/2, New York 2/3, Miami 3/3 and Cristobal 7/3, registered (label) cover franked 8F50 canc Paris 20.2.35 cds, black/pale blue airmail etiquette. 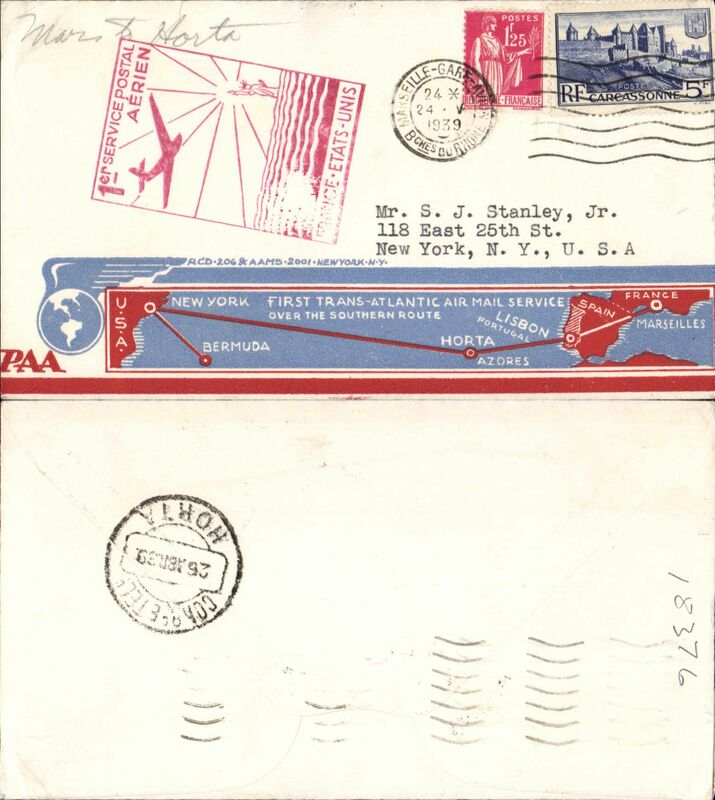 Surface to New York, then US airmail service too destination. A fine cover with superb routing, and one for the display. 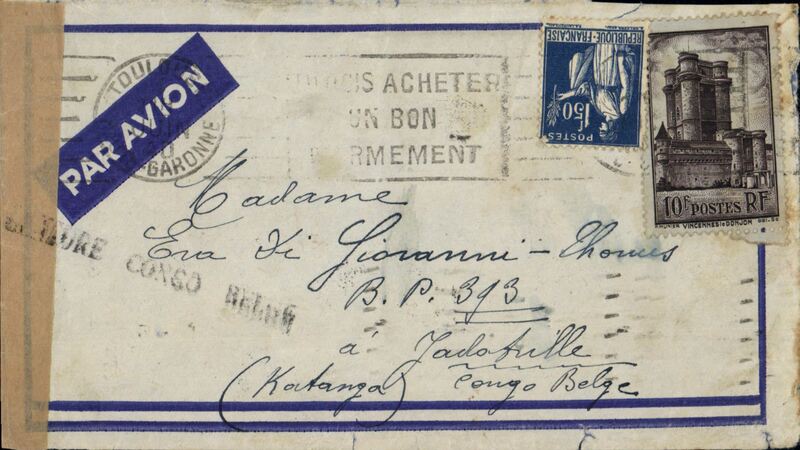 Scarce France acceptance for the Belgian Congo, for carriage on the first regular Sabena Brussels-Leopoldville service, Marseilles to Leopoldville, bs 28/2, Victor Nawratil etiquette cover, signed V. Nawratil verso, franked 1929 Exp 20F brown, SG475, cat £34 used (scarce on cover), canc Marseilles cds, green boxed "Inauguration de la/Ligne Postale Reguliere/Belgique-Congo" flight cachet applied at Marseilles, ms "Par Avion Belge de la Sabena/Marseilles (Marignane)-Leopoldville". Marignane is the mail airport for Marseilles. Large red/black 'Express' label to ensure rapid conveyance to Marignane. Ex Clowes. 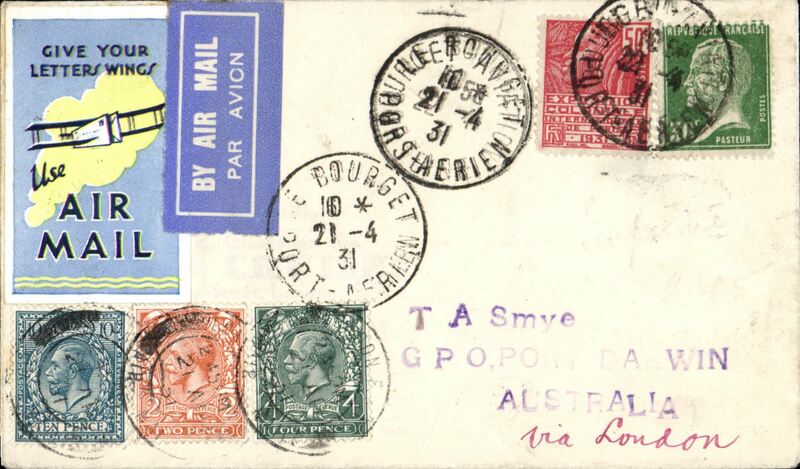 If not first, a very early acceptance of mail from France for carriage by KLM to Batavia, Dutch East Indies and OAT by Quantas to Australia, Marseille to Sydney, bs 10/3, registered (label) airmail etiquette cover franked 1F75 overseas postage, 13F50 air surcharge and 2f registratiion. 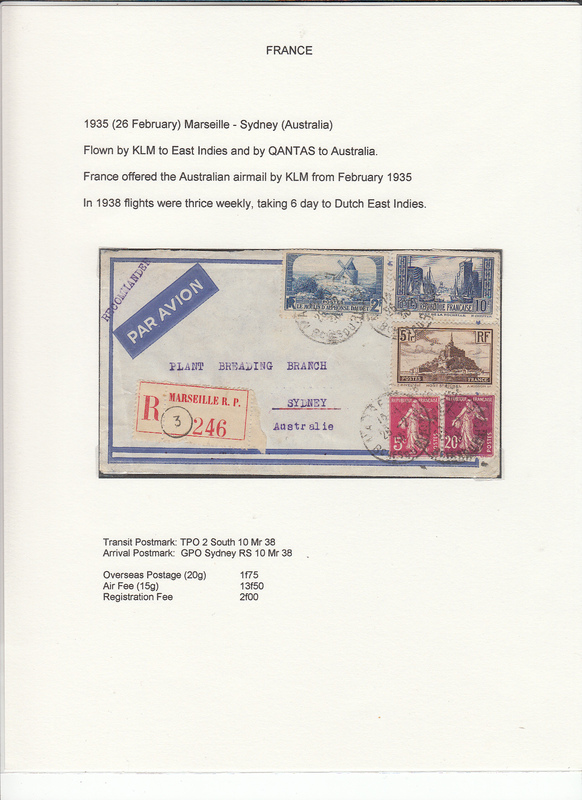 France was offered Australian airmail by KLM in February 1935. 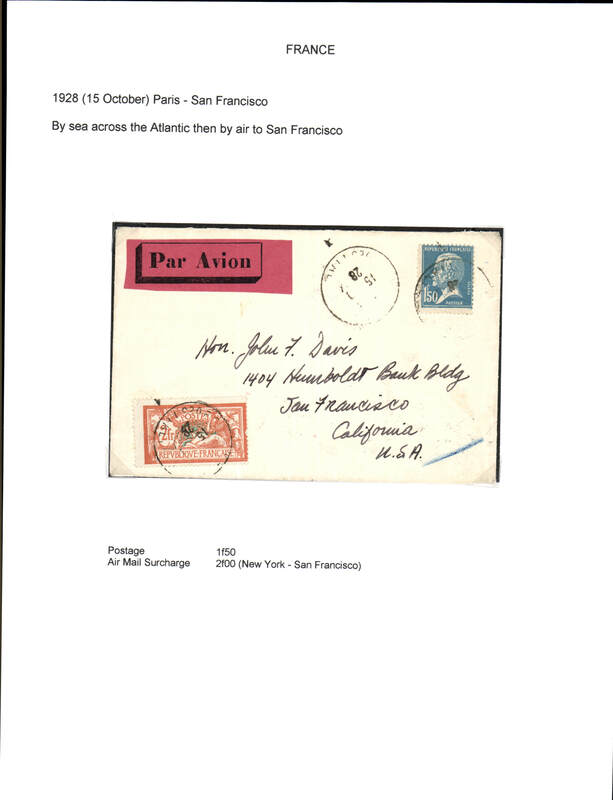 Displayed on exhibition page with text documenting the carrier airline(s), the route, and the postage rates applied to this particular item - important supplementary data which would otherwise be difficult to gather. 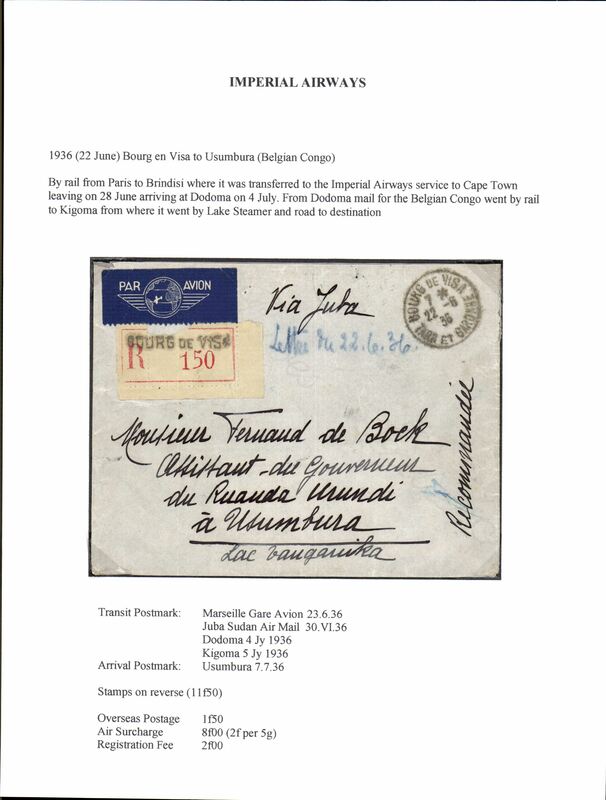 Diversion of Imperial Airways flight AS 219 via MALTA and Tobruk due to Greek rebellion, Marseilles to Kampala, bs 10/3, Union Castle line cover with company 'flag' logo on flap franked 7F50, grey green/black etiqutte. Carried by rail to Brindisi, then IAW flight ASW219 to East Africa via MALTA and Tobruk . Great item. Has a small closed flap tear which does not detract - see scan. 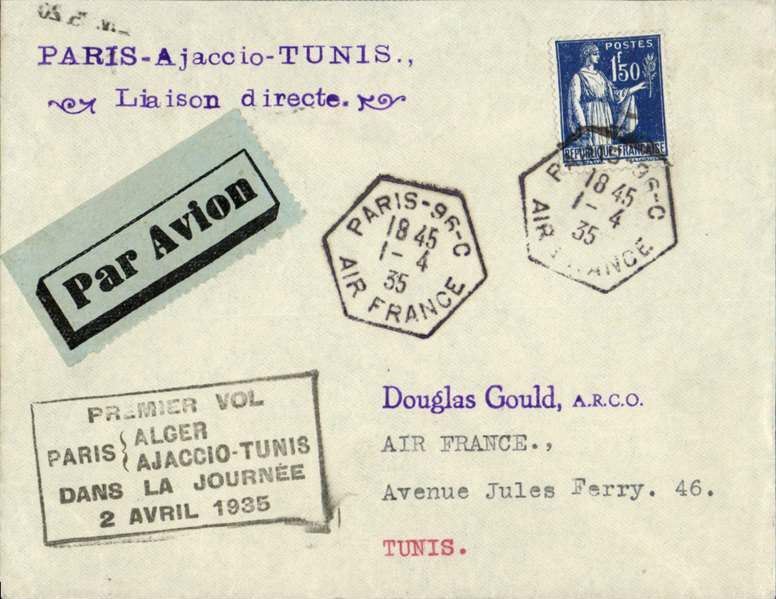 First direct flight Paris to Tunis, bs, via Ajaccio, franked 1F50 canc Paris Air France pmk, blue/black airmail etiquette, violet two line and black four line flight cachets. 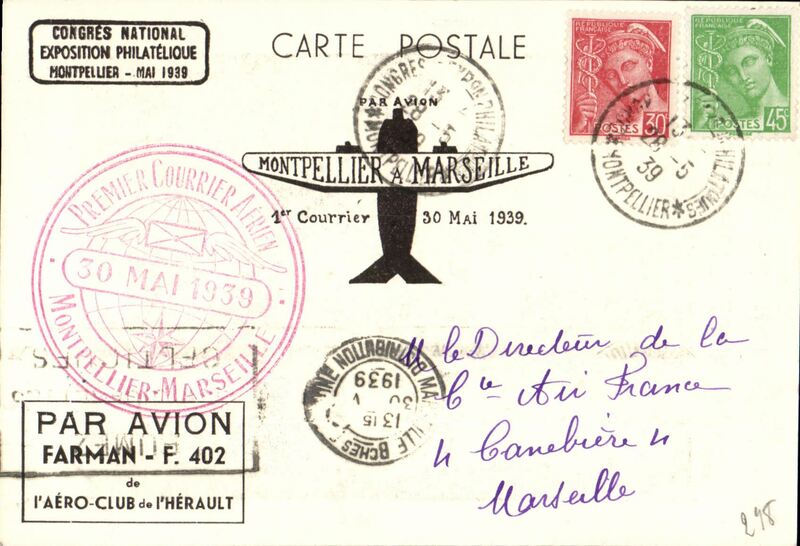 F/F Marseilles to Prague, 16/5 arrival ds on front, Air France company corner cover franked 2f 25, canc Marseille-Gare-Avion cds, black diamond flight cachet. Air Bleu, F/F Lille-Arras-Paris, special red framed cachet, red/white and blue/black airmail etiquettes. Air Bleu, F/F Bordeaux-Poitiers-Paris, bs 10/7, special red framed cachet, blue/black airmail etiquette. 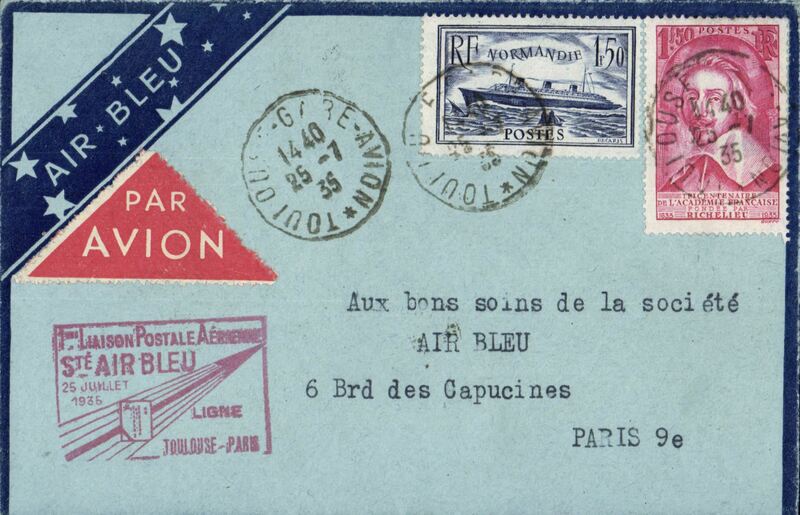 Air Bleu, F/F Toulouse-Paris, bs 25/7, special red framed cachet, uncommon blue/pale blue 'Air Blue' envelope with imprint airmail etiquette, red/white triangular airmail etiquette. Morez, Jura, Inauguration of Aerodrome, plain card, bs Pornichet 12/8', special vignette and cachet. 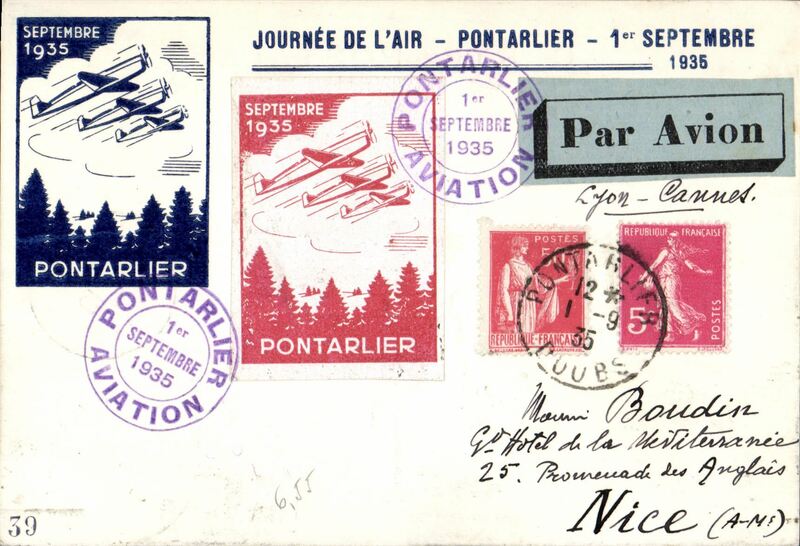 Pontarlier Aviation Meeting, souvenir illustrated card to Nice, via Lyon 'Avion', semi official stamp, special vignettes and cachets. Le Treport, rare first French rocket flight, B&W photocard showing rockets addressed to the inventor Karl Roberti, in his own hand, franked 15c canc Treport cds, blue/white 'Par Fusee' rocket etiquette tied by red six line Treport hs, also blsck 'Marie' cachet. 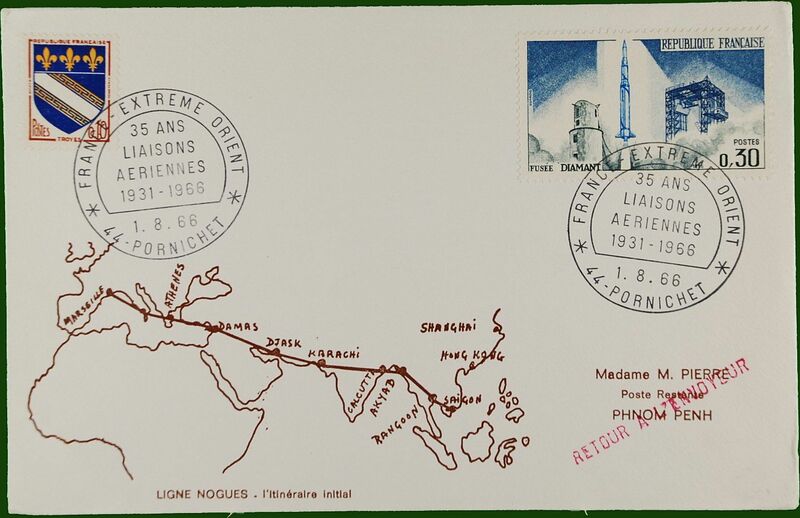 Calais, French rocket flight, bears 15c stamps which are not postmarked, but cancelled"Experience Interrompue/par ordre du Ministere/de l'Interieur"plain cover, also blue flight cachet and red three line 'Cachet de Controle' cachet. Unflown because they were officially forbidden to do so. Signed by Karl Roberti. 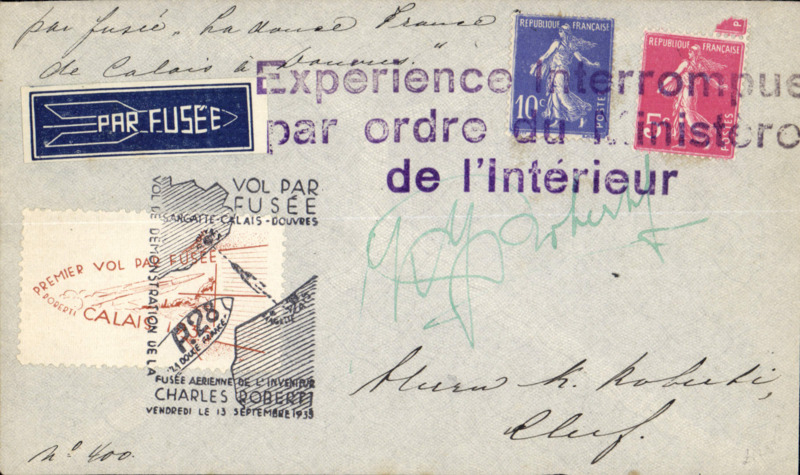 Karl Roberti, Calais rocket flight, cover franked 15c tied violet three line cachet 'Experience Interrompue/par ordre du mistero/de L'interieur', white/orange rocket stamp tied by black/white flight cachet, blue/white 'Par Fusee' etiquette. 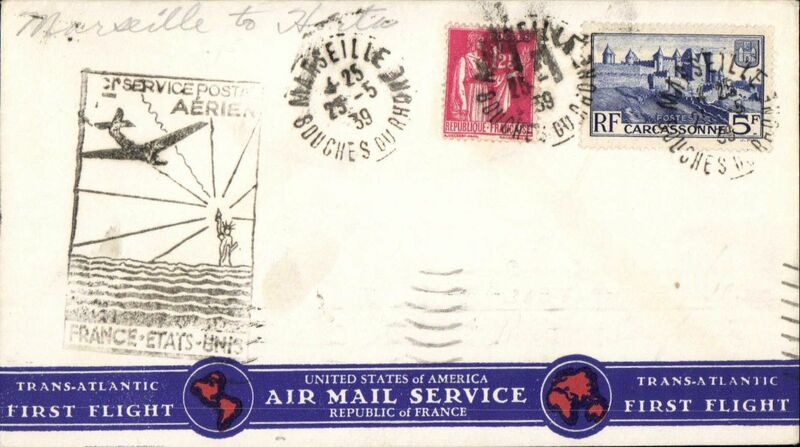 Air France, Air Afrique and Regie Malgache, F/F Paris to Tananarive, Madagascar, bs 17/11, via Zinder, Elisabethville and Quelimane, airmail etiquette cover franked 6F50, red framed official flight cachet. French acceptance for Sabena F/F extension of the regular Congo service to Elisabethville, Brussels to Elizabethville, bs 21/11, and return by surface, registered (label) cover franked France 9.25F, canc Saint Louis 13/11 cds, via Paris 14/11 transit cds, verso France 30c postage due canc Saint Louis 20/12 for postage underpaid on the return journey, typed "Par Ligne Aerienne Belge 'Leopold Roger' via Marseille" (Leopold Roger was the name of the aircraft). The original Certificate of Postage also accompanies this item. 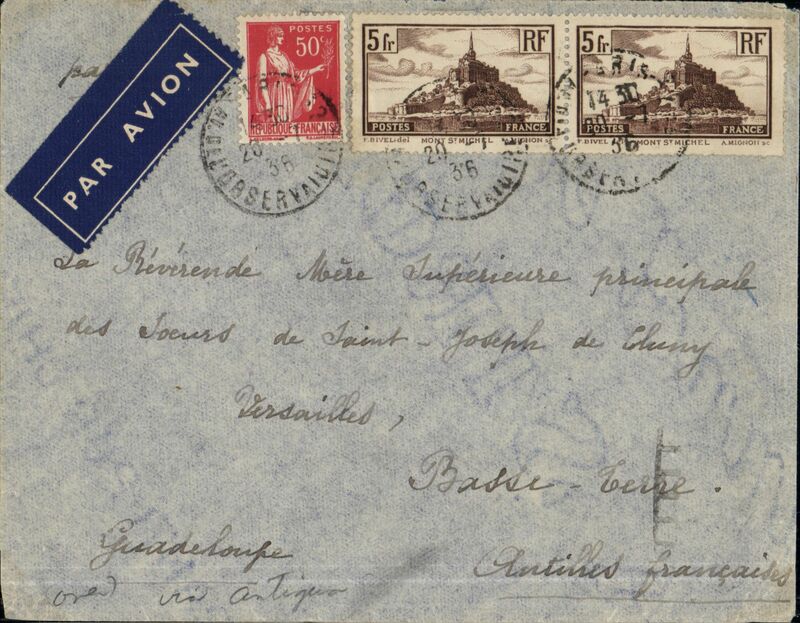 Cover postmarked Salies de Bיarn (France) December 6, 1935 to Rio de Janeiro with arrival b/s December 14. Rare franking with 4 copies of Scott C7 the Blיriot commemorative flight stamp (catalogued used for $4 each in 1998). 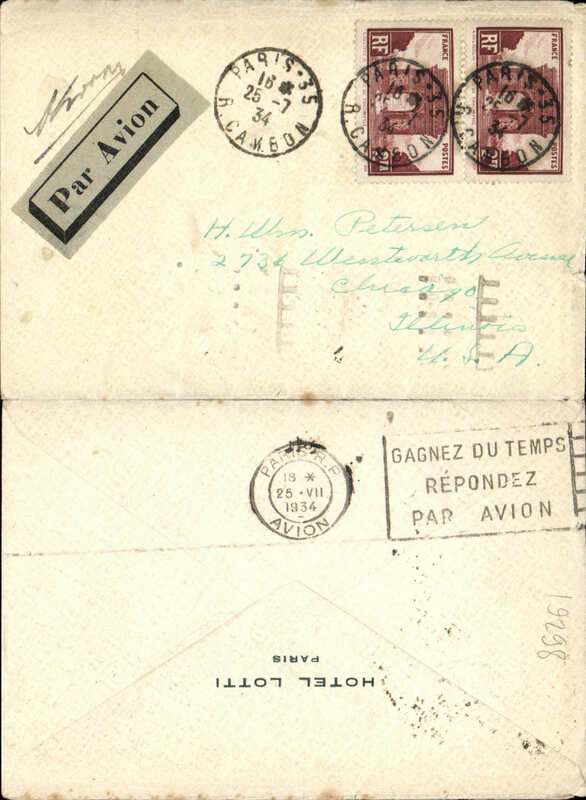 Demonstration flight of the Latיcoטre 521, "Lieutenant de Vaisseau Paris",a French six-engined flying boat, from Paris on 9/12/25 to Martinique, bs 22/12 Jan Le Can commercial corner cover franked 5F50, canc Bordeaux Avion 30/11/35 cds,red framed "FeteDuTricentenaire/ 1reLaisonAerienne/France-Antilles/Par Lietenant de Vaisseaux Paris/1935", ms 'Par hydravion Lieut de Vaiseaux Paris', black/grey airmail etiquette. Ironed vertical crease, hardly visible from front. 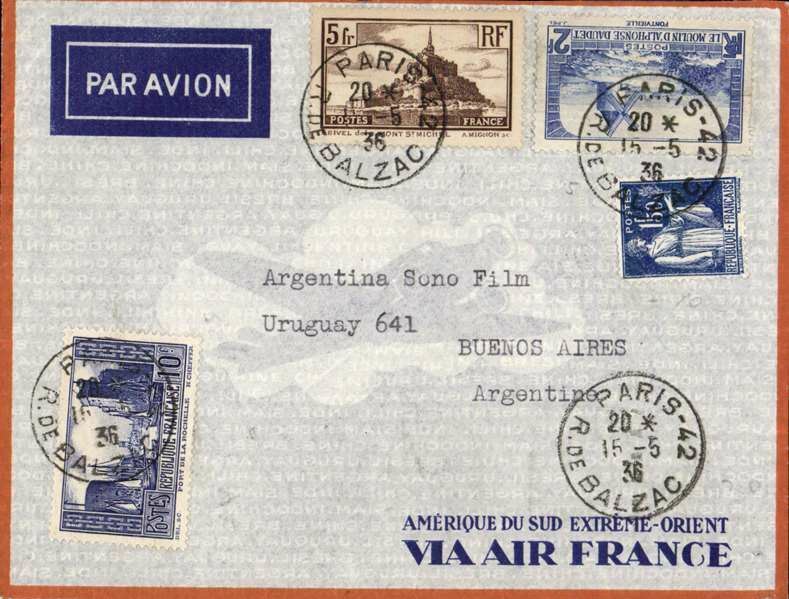 Air France South Atlantic service, France to Argentina, Paris to Buenos Aires, bs 21/5, orange/grey Air France envelope franked 8F50. 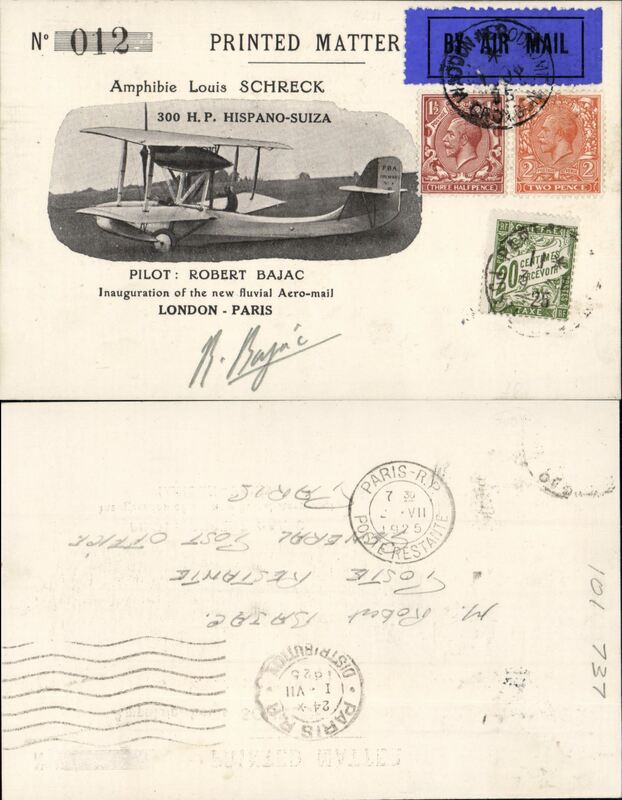 Imperial Airways, France to Begian Congo, bs Usumburua 7/7/, via Marseille Gare Avion 23/6, Juba Sudan Air Mail 30/6, Dodoma 4/7 and KIgoma 5/7, registered (label) cover ms 'Via Juba', correcty franked (verso) 1F50 overseas postage, 8F (2F per 5g) airmail surcharge and 2F registration canc Bourg en Visa cds. Written up on exhibition page with account of the route taken, and the ordinary and airmail surcharge rates which were applied to that item. The cover is very fine with particularly clear cancellations. 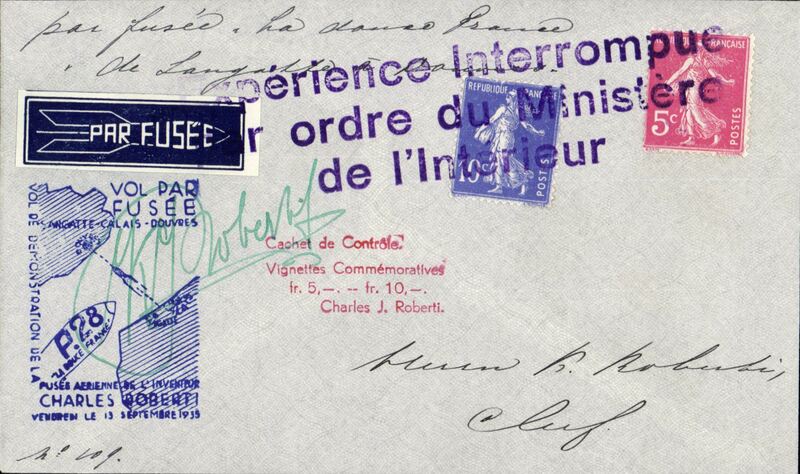 Cover postmarked Paris July 20, 1936 to Basse-Terre (Guadeloupe) with arrival b/s of August 4 and partial undated transit b/s of St-John’s (Antigua). It crossed the South Atlantic on the night of July 27-28, 1936 in the Latיcoטre 301 seaplane “Ville de Rio” with pilot Henri Guillaumet and 4 crew members. 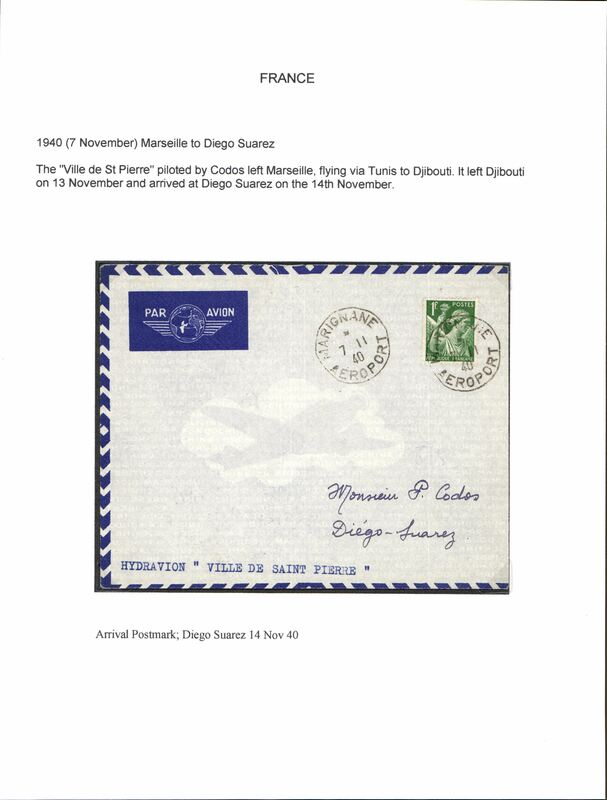 From Brazil, the cover was probably flown to Antigua by Pan American and then went to Guadeloupe by ship. Henri Guillaumet, the hero of the Andes, was killed in 1940 when his military plane was shot down over the Mediterranean. The regular full-air service between Dakar (Senegal) and Natal (Brazil) began on 6/1/36 after 32 experimental return flights between 1930 and 1936. Unusual destination. La Baule Aviation Meeting, red/cream/blue 'Premier Vol' cover, flown to Cannes, bs Cannes Avion 24/8, franked 50c, canc red 'La Baule/Avion/23-8-36' cds, green/white, and red/blue/white 'La Baule Aviation' vignettes, both tied by black framed "Journee Aeriennes/de la Baule-Pornichet-Le Pouliguen" cachet. Nice item. 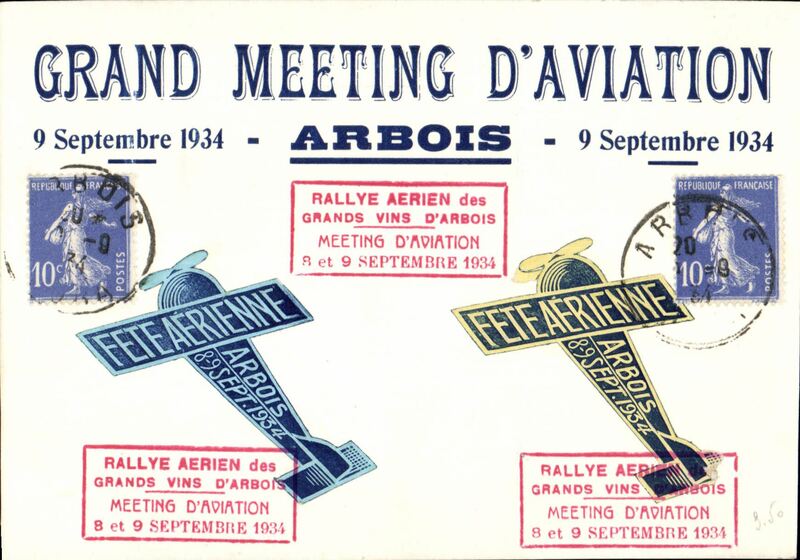 La Baule, aviation Meeting, Atlantic Aeroclub souvenir card to Nice 24/8 via Paris 24/8 and Cannes 24/8, franked 55c canc red La Baule cds, also two special vignettes, both tied by red framed Meeting cachet. 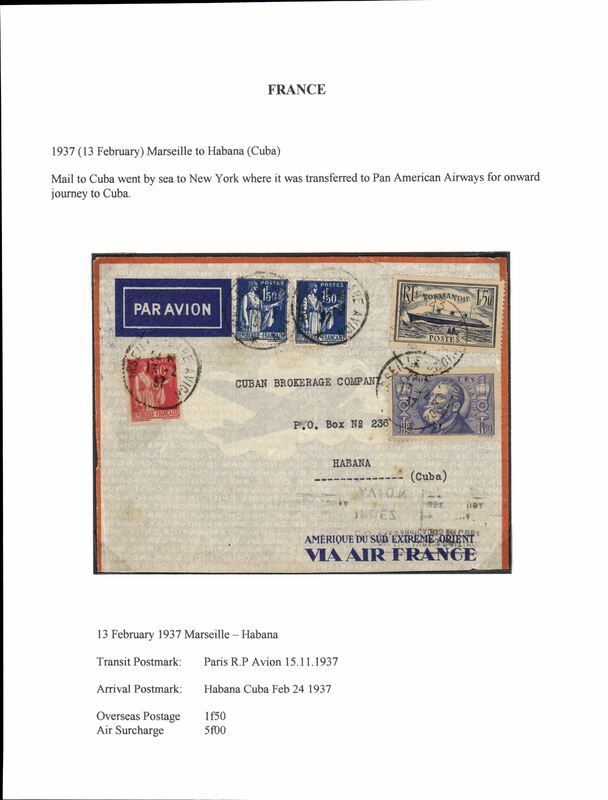 France to Costa Rica, bs 18/1, via New York 14/1 and Miami 15/1, high frank registered (label) cover with attractive red imprint airmail etiquette franked 17F for carriage by surface to New York then OAT by US air service, canc Paris cds, typed 'Par Avion - New York - San Jose', ms 'Via New York'. Rapid 11 day transit.. Uncommon origin-destination combination. Marseille to Habana, Cuba 24/2, orange border/grey Air France cover correctly rate 1F50 overseas postage and 5F air surcharge. 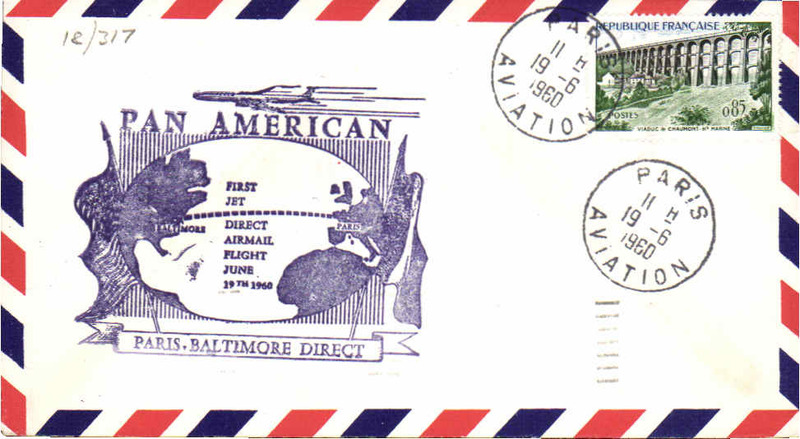 Carried by sea to New York, then OAT by Pan Am to Cuba.franked 1F50 overseas postage + 5F air surcharge. 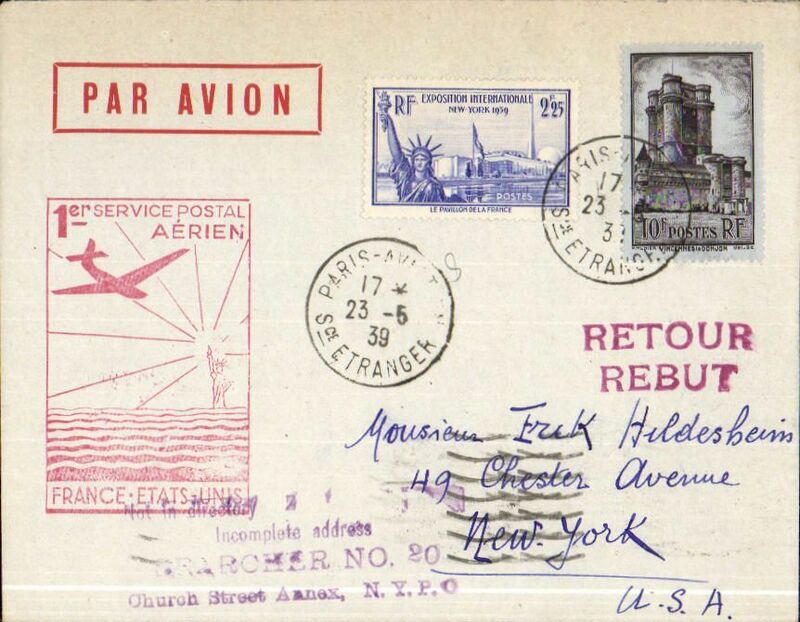 Air France/ Aeromaritime F/F France-Gold Coast, Paris to Takoradi, bs 3/3, Van Reet cover franked 2F30, canc hexagonal Paris/27-2 37/Air France ds, Red diamond "Air France/Aeromaritime" cachet , purple two line "Via Aeromaritime a Dakar" cachets. Flown by Aeromaritme from Dakar. 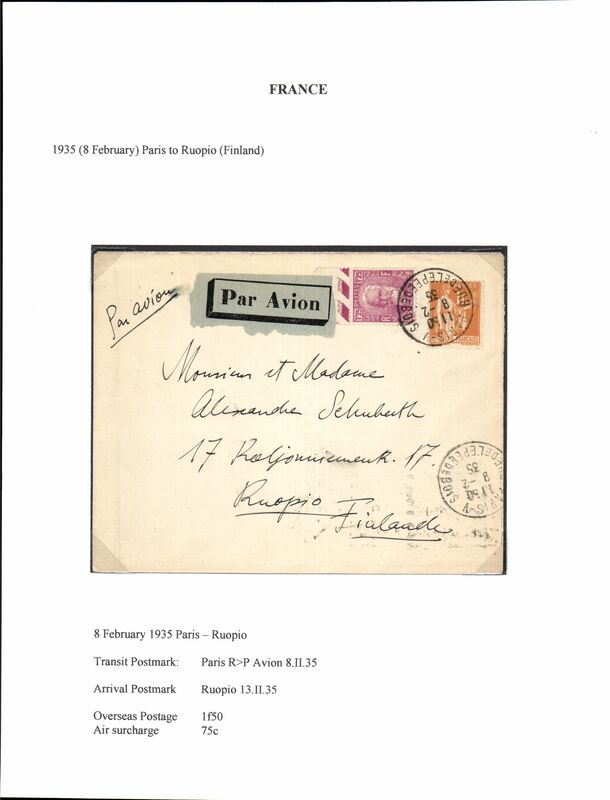 Rare first acceptance of mail from Sweden for the Gold Coast for carriage on the Air France/ Aeromaritime F/F France-Gold Coast, Paris to Takoradi, bs 3/3, registered (label) cover franked 130 ore canc Stockholm Luftpost cds, red diamond "Air France/Aeromaritime" cachet , typed "1 iere service le 28 Fevrier/France-Liberia-Cote d'Or". Nice item in fine condition. 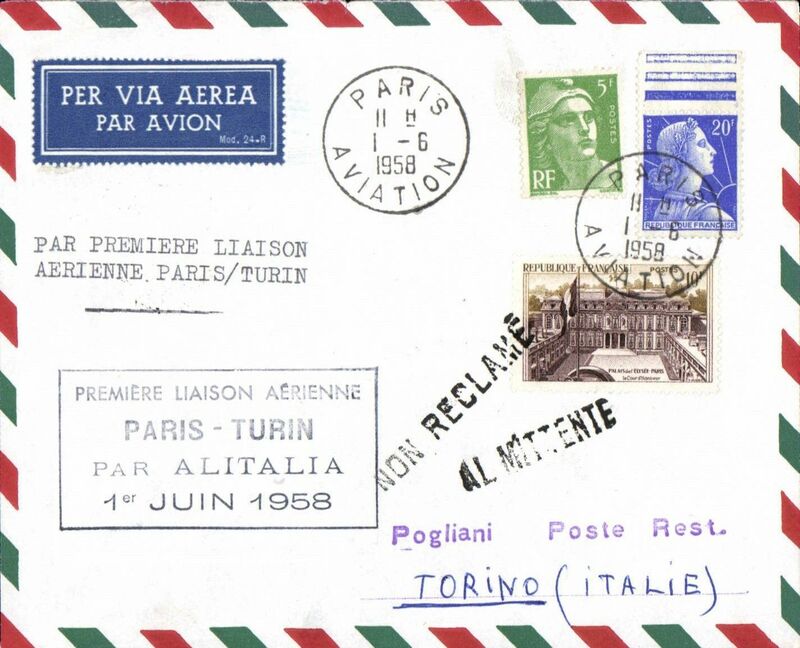 F/F Paris to Turin, b/s, imprint etiquette cover franked 2F25, red F/F cachet. Non invasive ironed vertical fold, see scan. 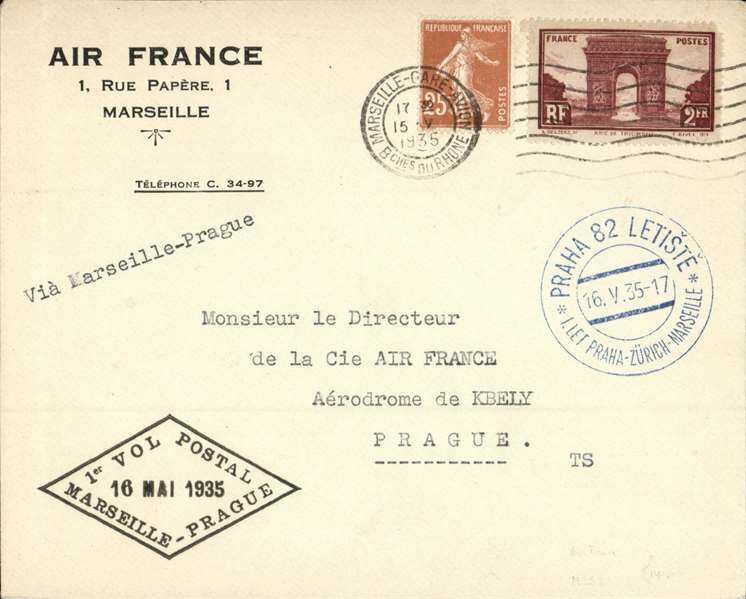 Air France, Paris to Prague, 28/4 arrival ds on font, grey/orange border Air France cover, franked 1F95c. 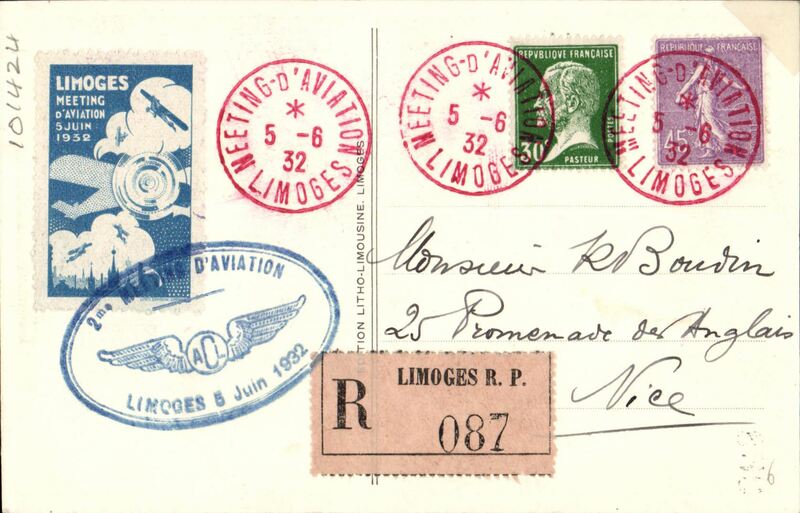 Aeromaritime F/F Paris to French Congo, bs Pointe Noire 20/5, airmail etiquette cover franked 3F, 50c over correct rate of 50c postage and 2F airmail surcharge (5g), Flown by Air France to Algiers then by Air Afrique to Madagascar. Written up on display page with nice route, airline carrier and postage rate documentation. 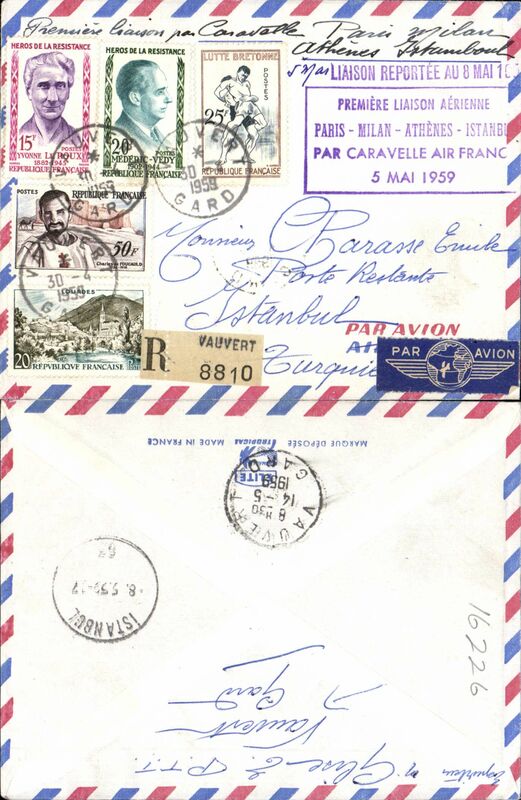 Air France, Air Afrique and Regie Malgache, F/F Nice to Tananarive, bs 20/6, calling at Stanleyville instead of Brazzaville, airmail etiquette cover franked 5F75, black framed flight cachet..
Paris to Cape Town, no arrival ds, Air France grey/orange border AF company cover franked 7F 50c. 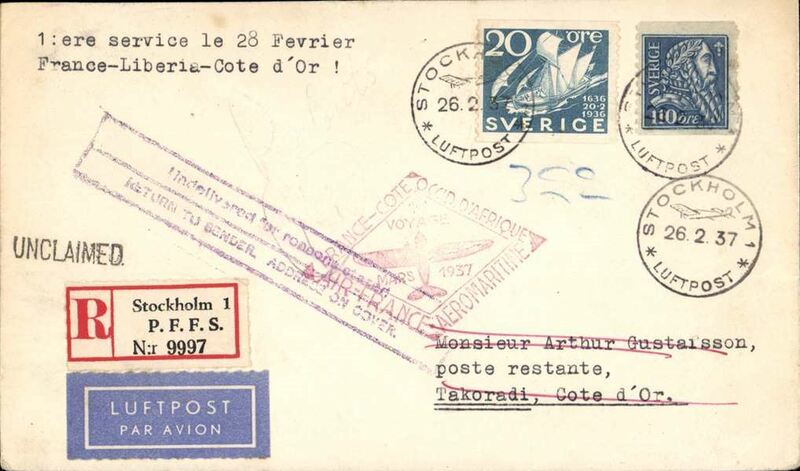 First airmail without air fee, Paris to Copenhagen, cachet, b/s. 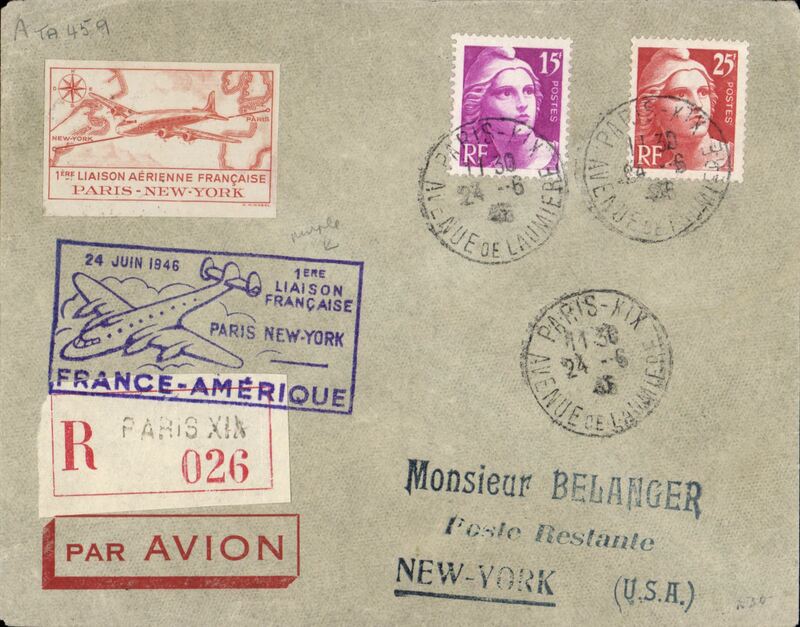 First Air France -Westerly Around the World Flight, Paris-Natal 21/10--Belem 22/10--Miami -New York 25/10-San Francisco -Hong Kong 9/11-Marseilles, special cover po0sted at the Paris Exposition, franked with French, Brazilian, Us and Hong Kong stamps, all with clear cancellations. Displayed on two album pages including detailed account of route. 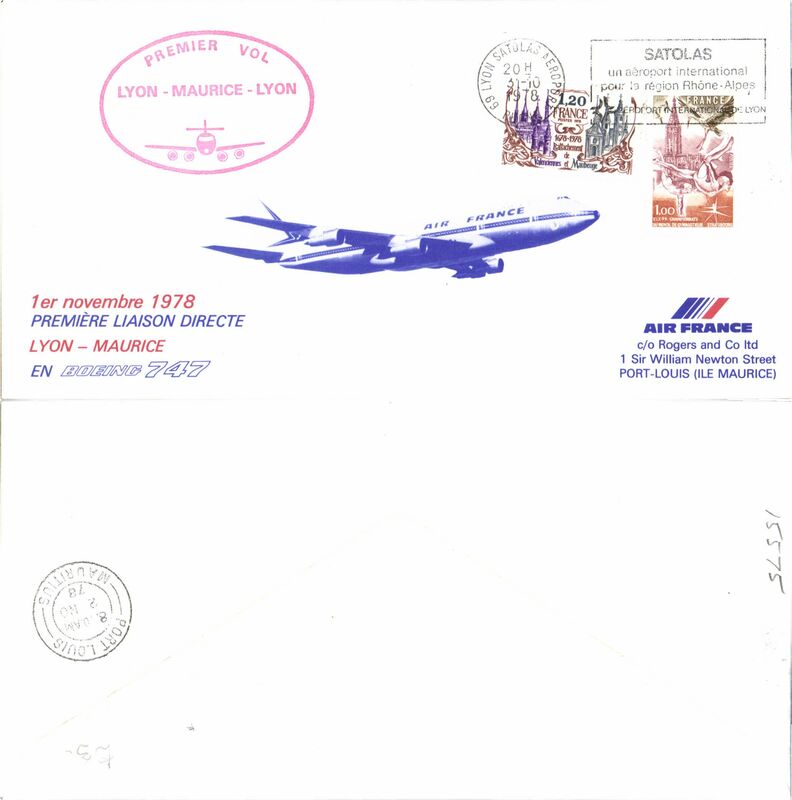 A fine exhibit item in pristine condition, se web site scans..
Air France acceleration Paris-Santiago, and return, via Istres-Dakar-Natal and Buenos Aires, souvenir PPC franked France 3F50 air x3 &35c,canc Le Bourget 20/11, Santiago 22/11 arrival ds on front, then refranked Chile 9P airs & 60c, canc Santiago/Correo Aereo cds, for return, bs Paris, black boxed "Laison Postal Acceleree/France-Amerique du Sud/Novembre 1937" cachet on front, and framed magenta "Paris Santiago du Chile/en 58 Heures/Avion Chef Pilote L. Guerrero/Codis, Reine,Gimie,Vautier" cachet verso. Illustrated p1.1.65 Dr Eduardo Madsen's 'Ochenta Anos de Historia Aeropostal en Chile', published in 2001. GB acceptance for F/F Paris-Marseille Sans Surtax, bs Nice, Air France/Air Blue. 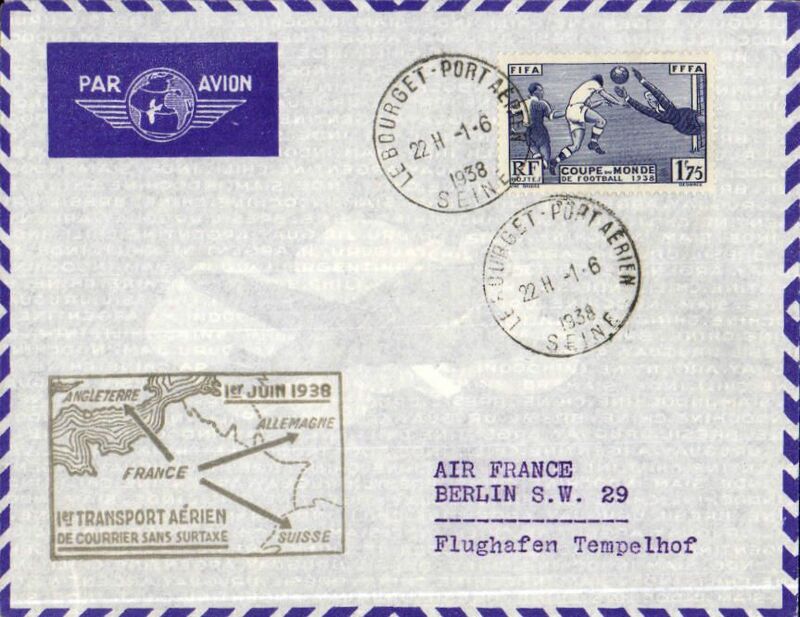 First airmail without air fee, Paris to Berlin, bs 2/6, imprint etiquette cover franked 1F75, official black framed cachet. 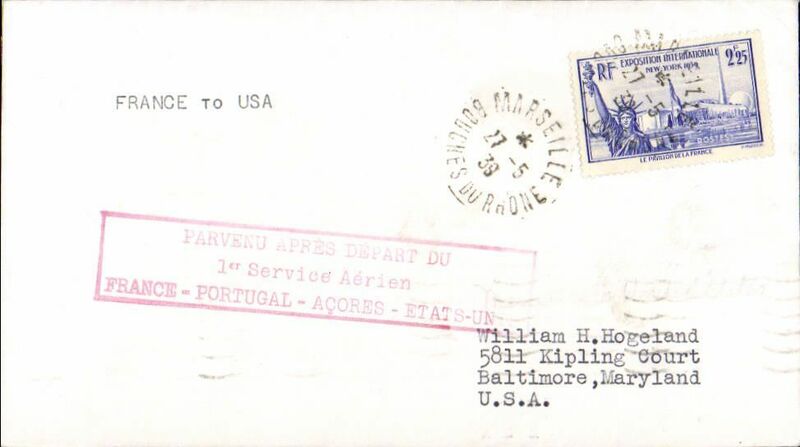 Acceptance of mail from France for Martinique, bs Fort de France 9/6, via New York 2/6, Miami 3/6, Charlotte Amalie, Virgin Islands 7/6 and San Juan 8/6. 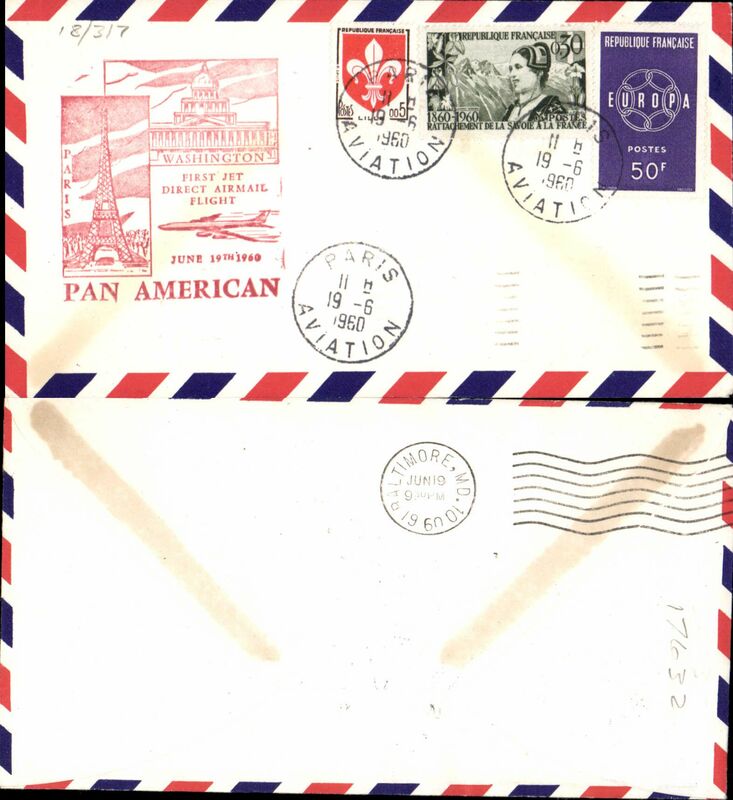 Red/grey imprint etiquette registered (label) airmail cover franked 5F &3F air, canc hexagonal Marseiile/27-6-38 ds. Carried by sea from Cherbourg to New York, then OTA by Pan Am from New York. Great routing. Ex Bergier, author "Relations Aeropostales Entre L'Europe et L'Amerique du Nord 1919-1945". 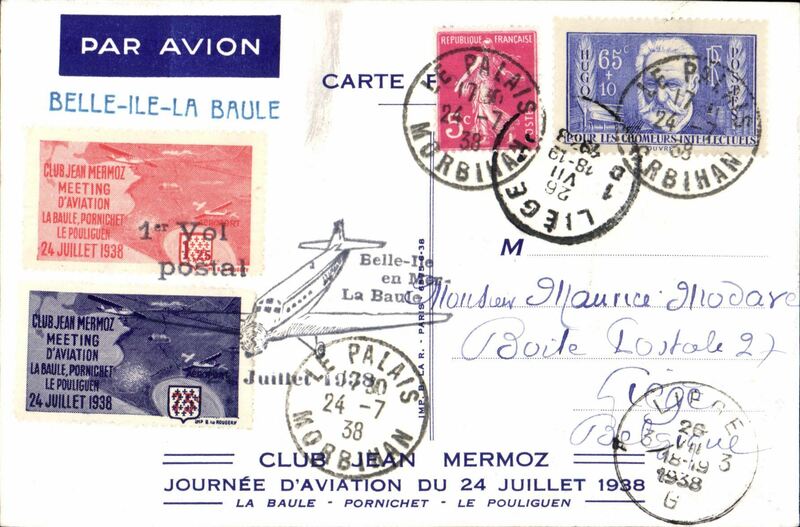 La Baule Aviation Day, also F/F Belli-Ile to La Baule, souvenir PPC franked70c, canc Le Palais/Morbihan cds, two 'Club Jean Mermoz' tied by special cachet. Attractive item. 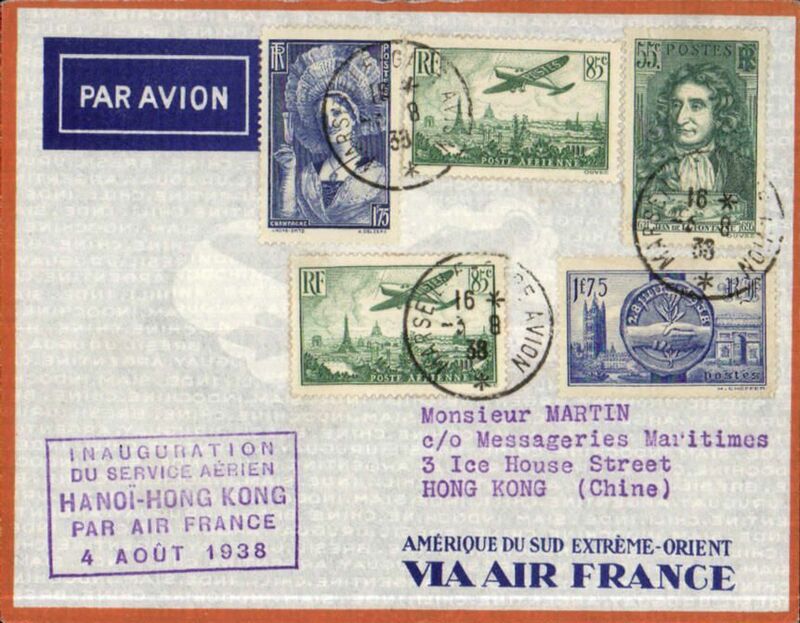 F/F Paris-(Hanoi) to Hong Kong, cachet, grey/orange border 'Amerique du Sud Extreme-Orient/Via Air France' cover, franked F5.75, Air France. 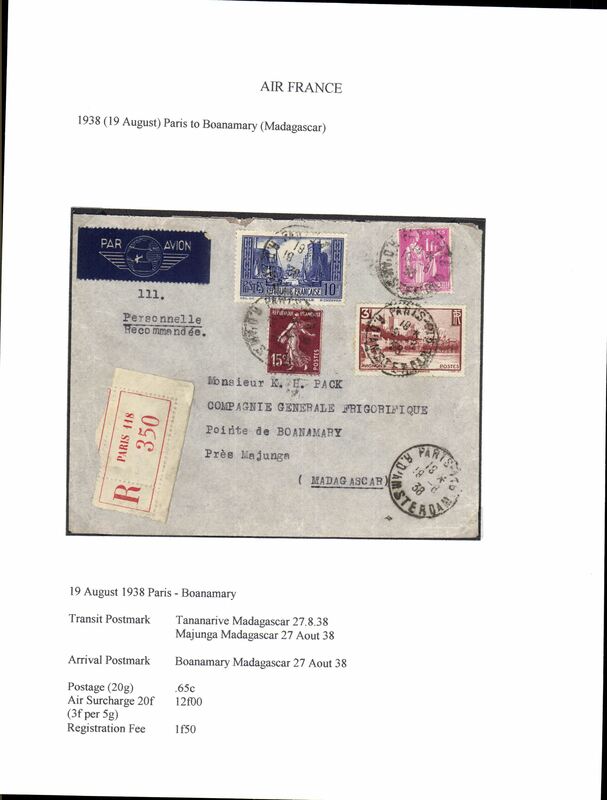 Air France Paris to Madagascar, bs Boanamary 27/8, via Tananarive 27/8 and Majunga 27/8, registered (label) cover correctly franked .65c overseas postage (20g), air surcharge 20F (3f per 5g) and 1F50 registration. 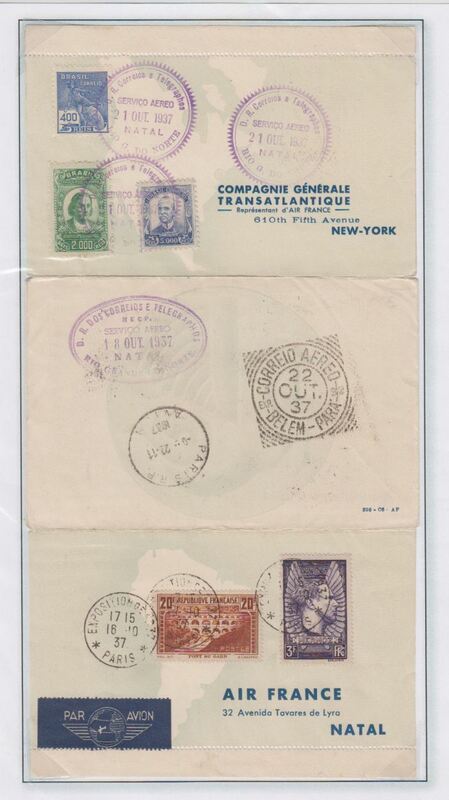 France to Costa Rica, bs 21/10, airmail etiquette cover franked 6F75 for carriage by surface to New York then OAT by US air service, canc Paris cds, ms 'Via New York'. Rapid 9 day transit. - ? fast ocean liner to NY. Uncommon origin-destination combination. 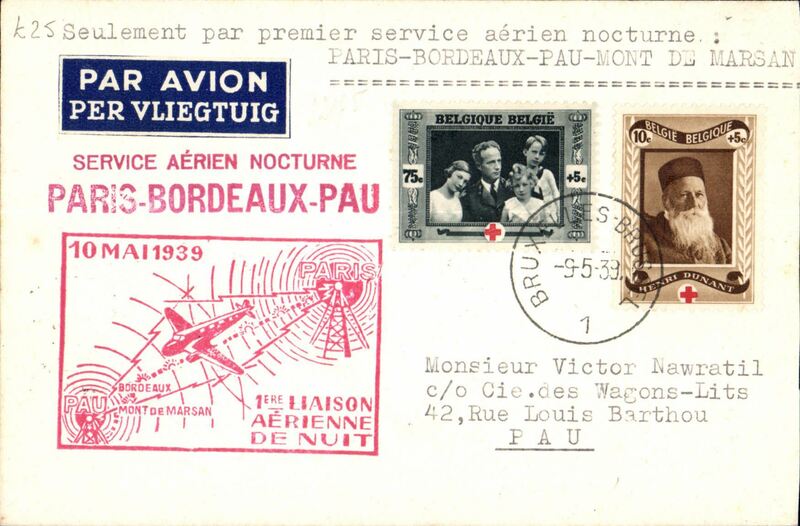 Belgium acceptance for the 1st Paris-Bordeaux-Pau night flight, Nawratil cover franked 80c, canc Brusells cds, large red cachet. 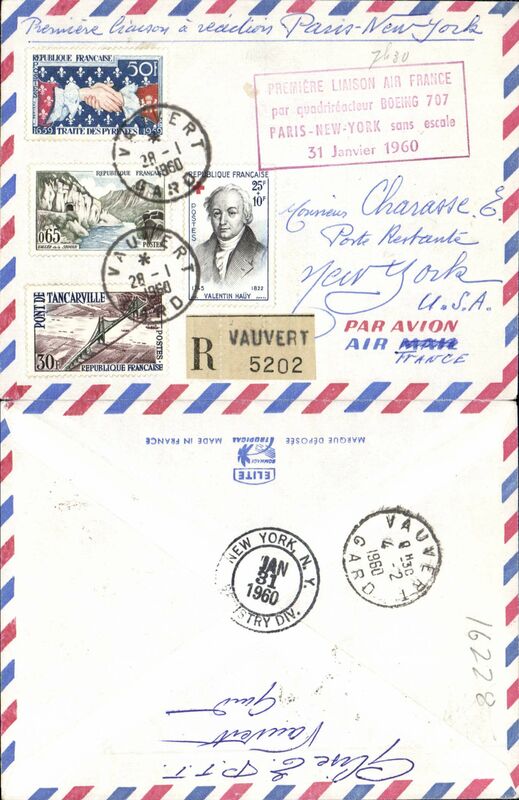 First acceptance of French mail for Pan Am F/F Marseilles-New York, b/s 27/5, registered (label) envelope Lyon to New York via Marseille 24/5, official red flight cachet verso, attractive air cover correctly franked 2F25 overseas postage, 10F airmail surcharge and 2F50 registration fee..
F/F FAM 18 Southern Atlantic Route, Marseilles to New York, b/s, cachet, imprint etiquette airmail cover franked F12.25 cover, Pan Am. 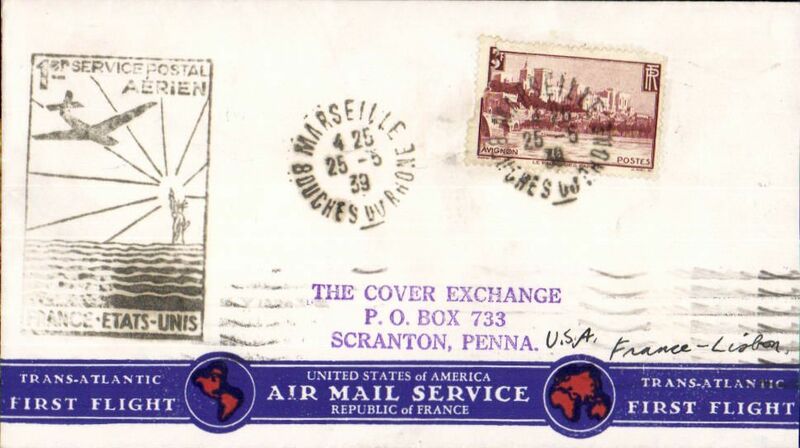 F/F FAM 18 Southern Atlantic Route, Marseilles to New York, b/s, cachet, souvenir cover, Pan Am. 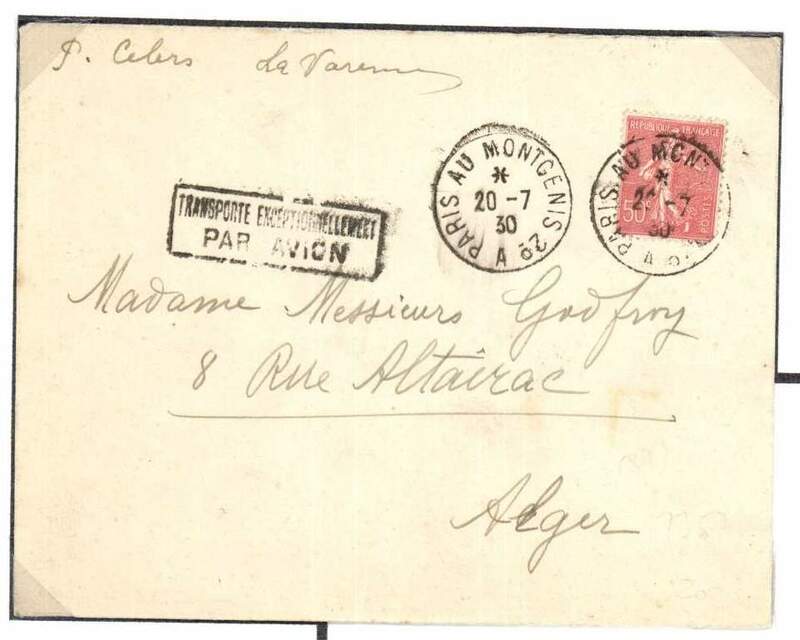 F/F FAM18 Southern Atlantic route, Marseilles to Horta (Azores), b/s 29/5, registered (label) cover with very attractive F8.50 franking, red flight cachet, Pan Am. Francis Field authentication hs verso. 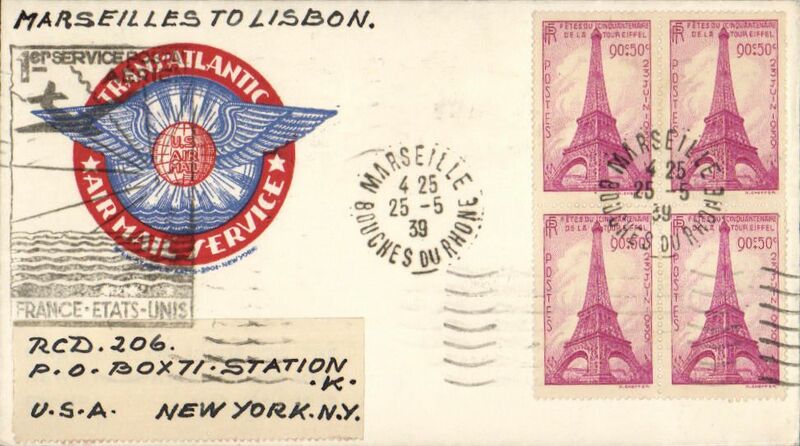 F/F FAM18 Southern Atlantic route, Marseilles to Lisbon, bs 25/5, very attractive and uncommon cream/light blue and red souvenir 'map of route' cover with 'RCD 206 & AAMS 2001 New York' imprint, franked 3F, red flight cachet. 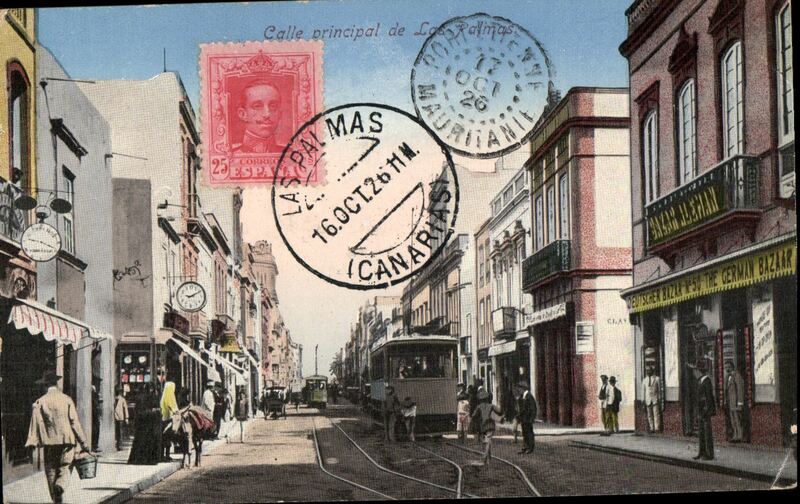 Pan Am F/F Marseilles to Lisbon, bs 25/5 via Marseiilles 25/5, scarce BLACK cachet, attractive air cover franked 3F. 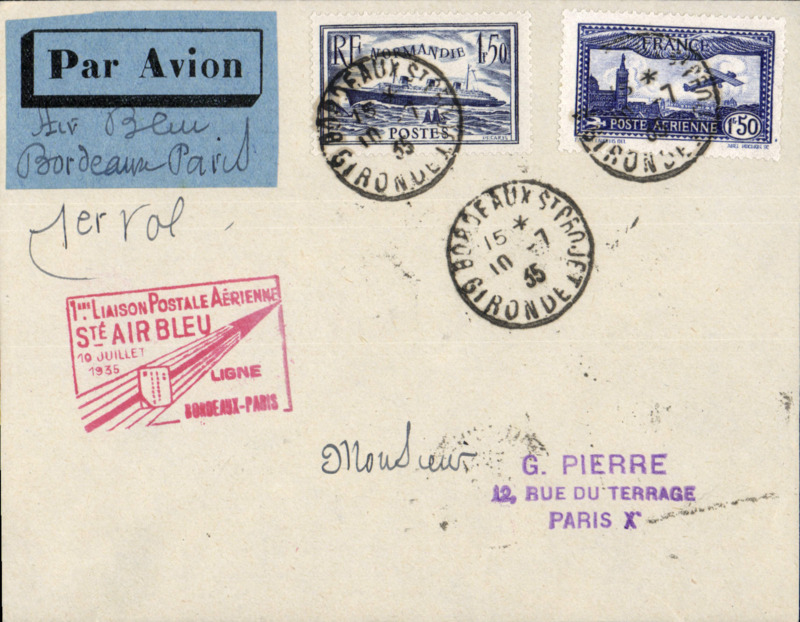 Pan Am F/F Marseilles to Horta, b/s, scarce BLACK cachet, attractive red/white/blue souvenir air cover from France. 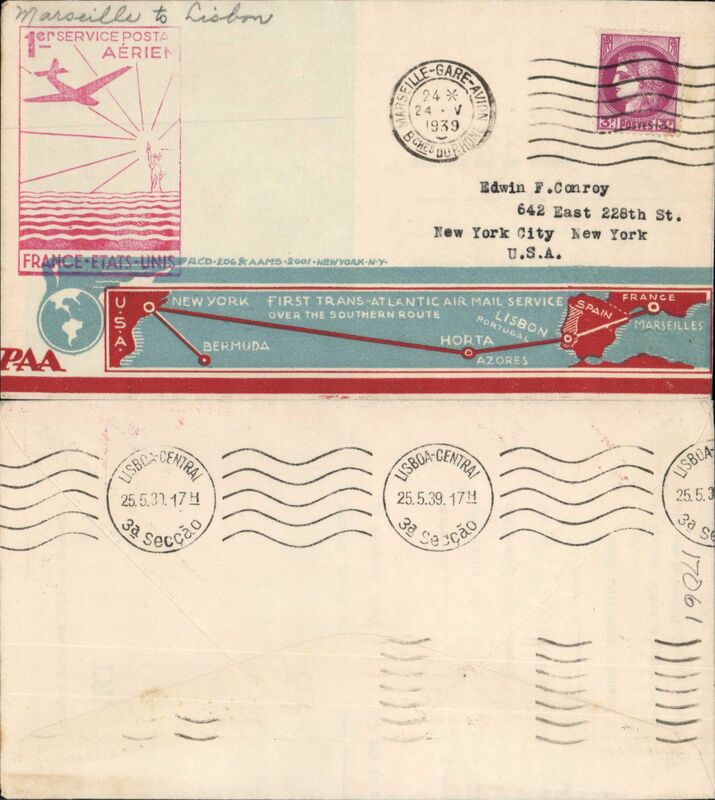 Scarcer Crosby cacheted Pan Am Yankee Clipper Trans-Atlantic F/F via Southern route, Marseilles to New York, bs 27/5, fine red Crosby cachet, official red flight cachet, airmail cover. Popular with collectors, but not easy to find. 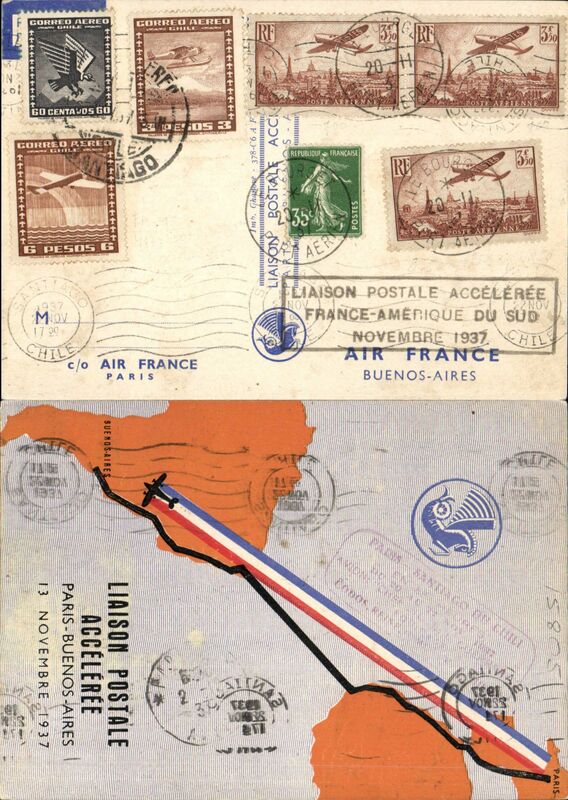 Pan Am F/F Marseilles to Lisbon 25/5, scarce BLACK cachet, attractive red/white/blue souvenir air cover from France. Scarcer Crosby cacheted cover, 24x10cm, Pan Am Yankee Clipper Trans-Atlantic F/F via Southern route, Marseilles to New York, bs 27/5, fine gold Crosby cachet, official red flight cachet, airmail cover. Popular with collectors, but not easy to find. 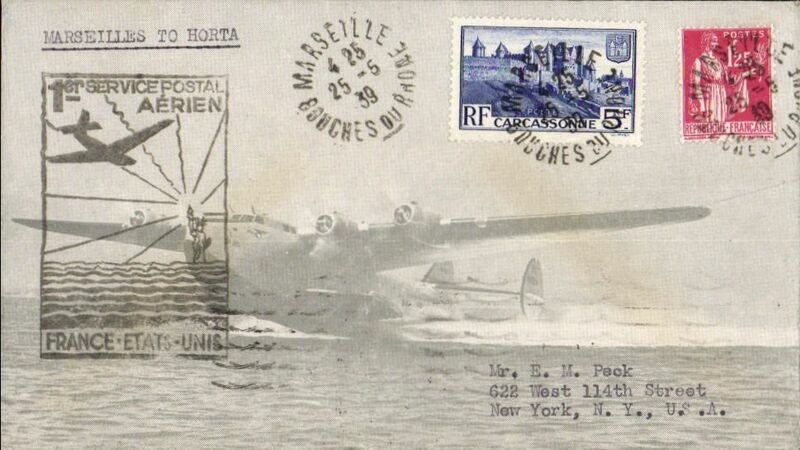 Pan Am F/F Marseilles to Horta, bs 25/5, scarce BLACK cachet, attractive air grey/light grey cover with embedded flying boat image franked 5F and 1F25. 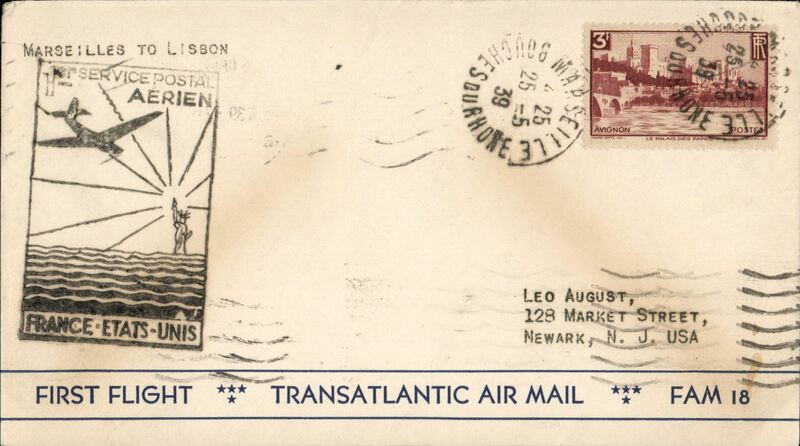 Pan Am F/F Marseilles to Lisbon, bs 25/5, scarce BLACK cachet, most unusual and attractive 'Trans-Atlantic Airmail Service' cover with embedded flying boat image. 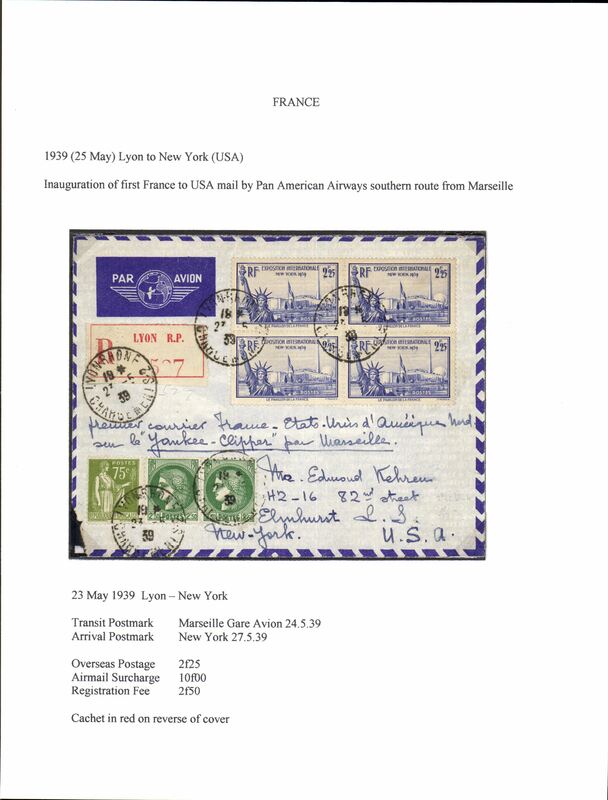 Missed Pan Am first flight Marseilles to New York, rare red framed "Parvenu Apres Depart Du/1er Service Aerien/France-Portugal-Acores-Etats Unis" cachet on plain cover franked F2.25 canc Marseilles 27/5/39 cds, typed 'France-USA'. Missed the first flight, but a rare cachet confirming this, see Ehrlinger W., p11. 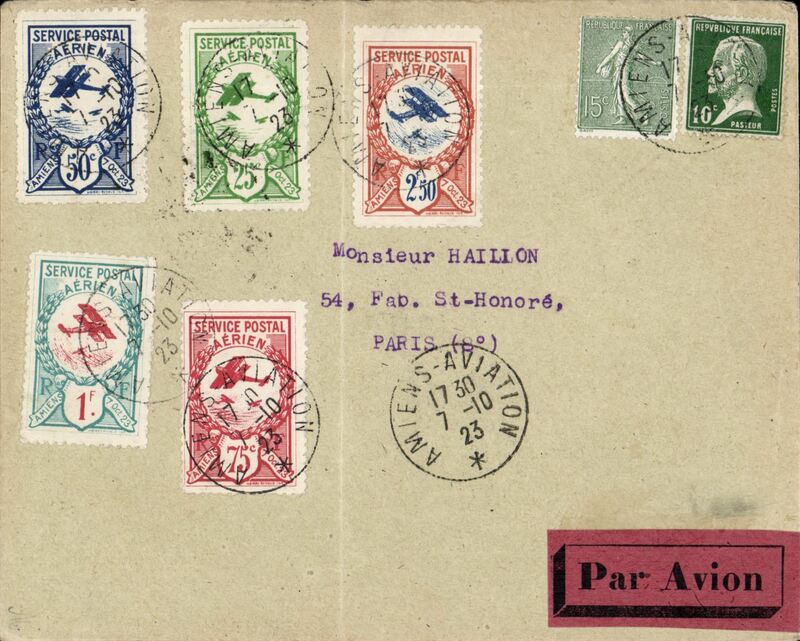 Montpellier Philatelic Expo, and also F/F Montpellier to Marseille, 30/5 arrival cds on front, souvenir PPC franked 75c, also red circular flight cached and black framed 'Par Avion/Farman - F.402' cachet. 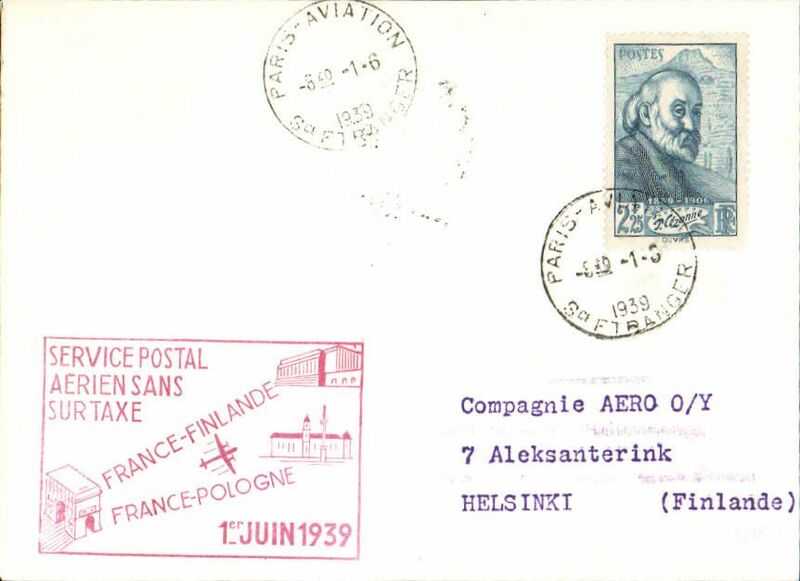 First airmail without air fee, Paris to Finland, bs 1/6, plain cover franked 2F25, official red framed cachet. 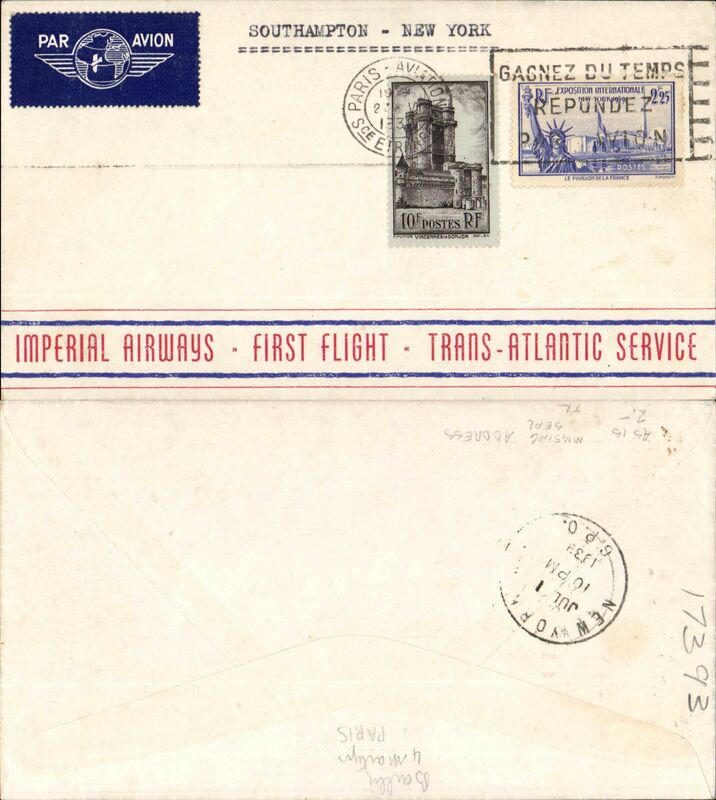 Scarce first acceptance of mail from France for USA for carriage on the inaugural Pan Am North Atlantic service from Southampton to New York, bs 1/7, red/white/blue Imperial Airways/Fist Flight/Trans Atlantic Service souvenir cover franked 1938 10F & 1939 2f25, canc Paris Avion cds. Early World War II censored LATI commercial air cover to Germany, Baade & Baade airmail corner cover, franked 5400R canc Porto Alegre cds, printed "Via (ms) LATI" typed endorsement ", Maubeuge double circle Period 1 "Controle Postal Militaire/Admission WN", sealed Brazil brown/black S.P Censura censor tape with coat of arms, tied by violet Brazil two line "5 Censura/****** Do Sul censor mark verso, blue two line "Retour/A L'Envoyeur" hs on front. 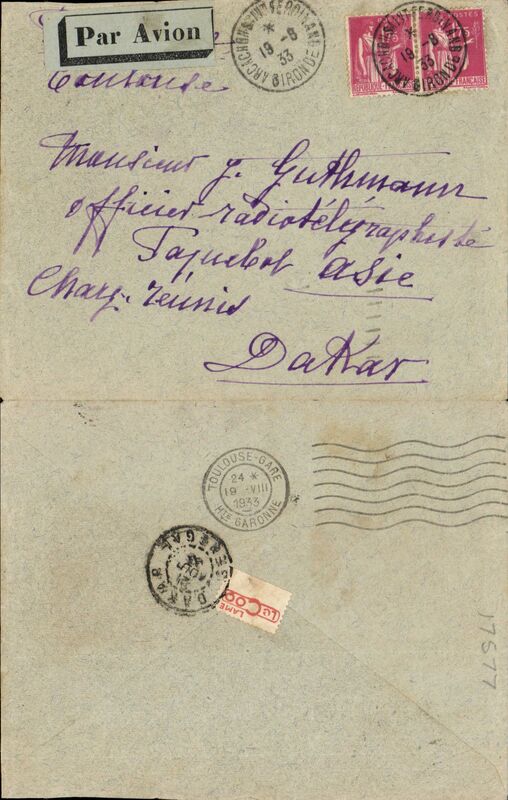 Intended for carriage by LATI but was sent, instead, via Transatlantic Clipper to France where it was censored at Maubeuge on the French-Belgian border, and then returned to sender. Upon the French declaration of war against Germany on 3/9/39 Air France ceased all flights to Germany. So, on reaching Maubeuge, this cover could go no further and was returned to Brazil. For this reason Maubeuge mail is much sought after. 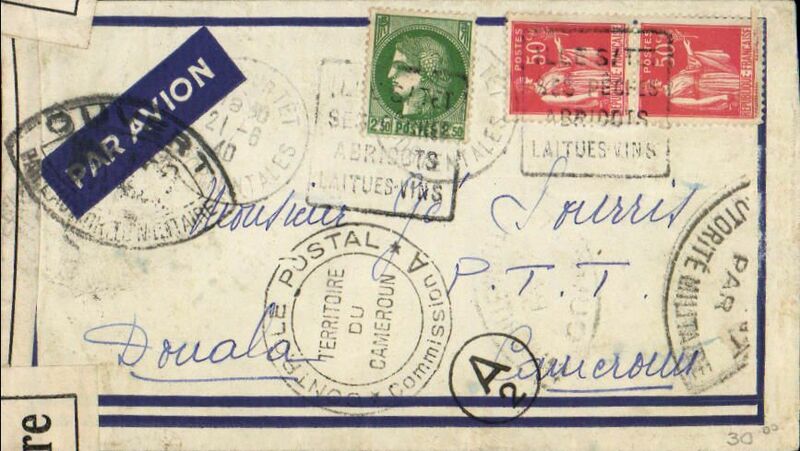 Cover postmarked Lyon on January 24, 1940 to Buenos Aires (no arrival b/s). The crossing of the South Atlantic was made on January 29th in the Farman 2220 “Ville de Dakar” with Marcel Reine as pilot and a crew of 4. Cover with the rare Clement Ader 50F stamp (Scott 348 value $42 in 1998) as part of the franking, rear flap has been excised neatly. Reine and famous Aeropostale pilot Henri Guillaumet were killed some 10 months later when their military plane was shot down over the Mediterranean. World War II began on September 1, 1939, when Germany attacked Poland, so these late Air France flights are quite scarce. 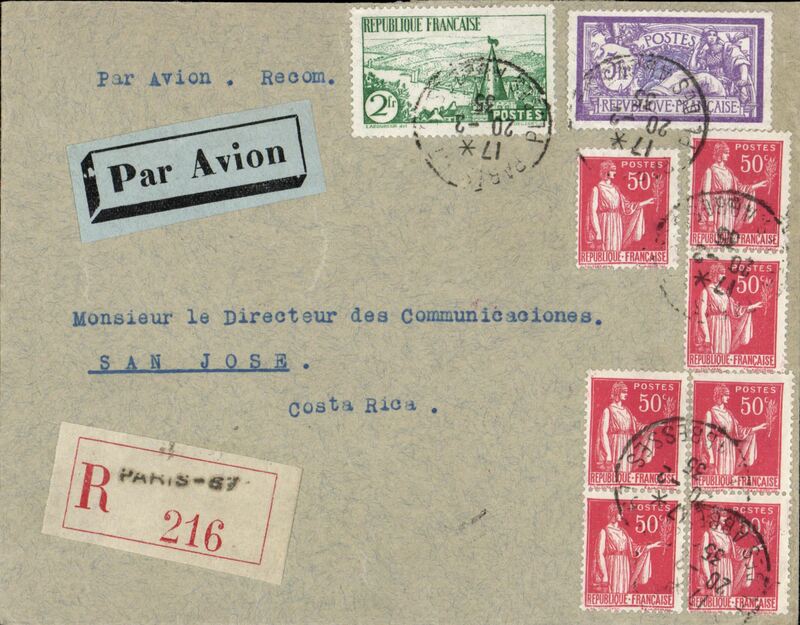 Scarce WWII uncensored airmail, France to Costa Rica, Paris to San Jose, bs 5/5, airmail etiquette cover franked 15F40, canc Paris/15.4.40 cds, typed 'Par Avion France-Lisbon-New York'. Posted shortly before Germany invaded France in May 1940. 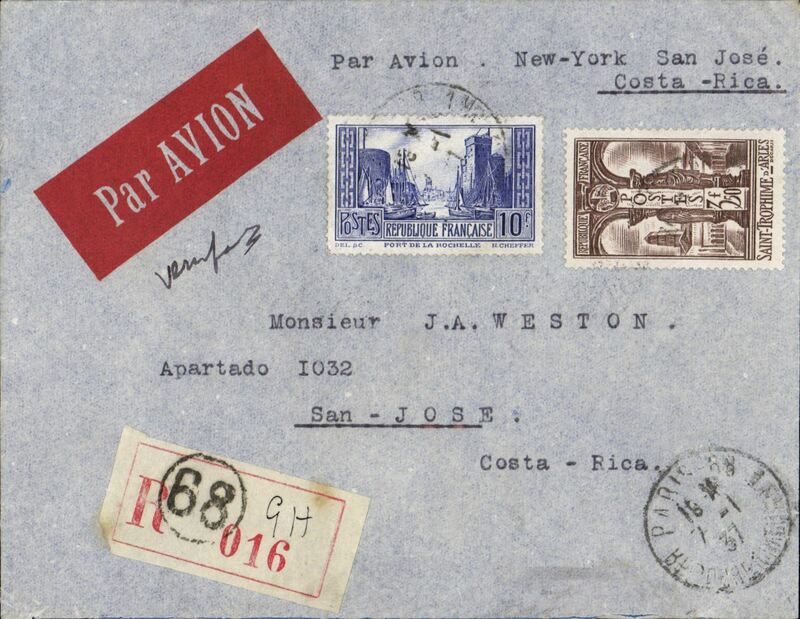 WWII uncensored airmail to North and South America is uncommon - to Costa Rica even more so. 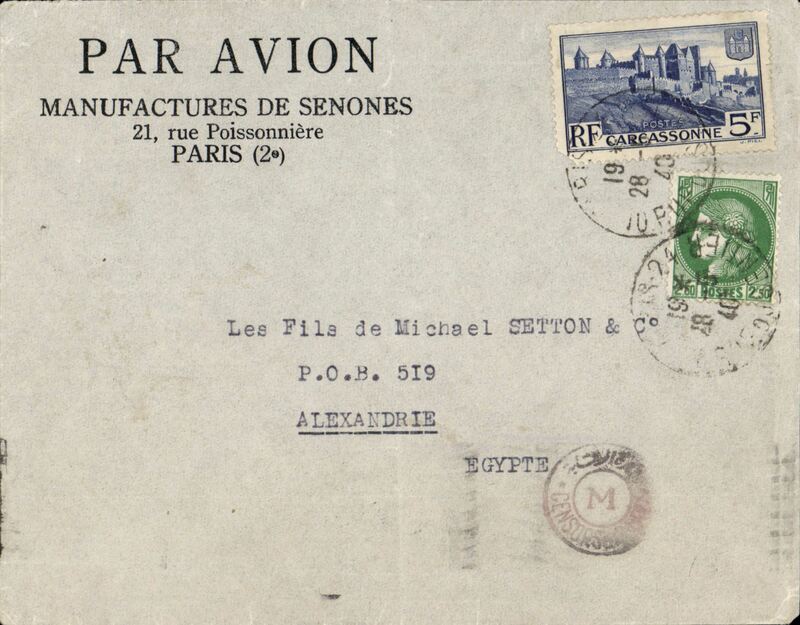 WWII censored airmail Paris to Alexandria, via Cairo 3/6, franked 2F50 postage and 5F air, canc Paris cds, censored in Egypt., flown Air France to Athens, then Imperial Airways to Alexandria. Image. 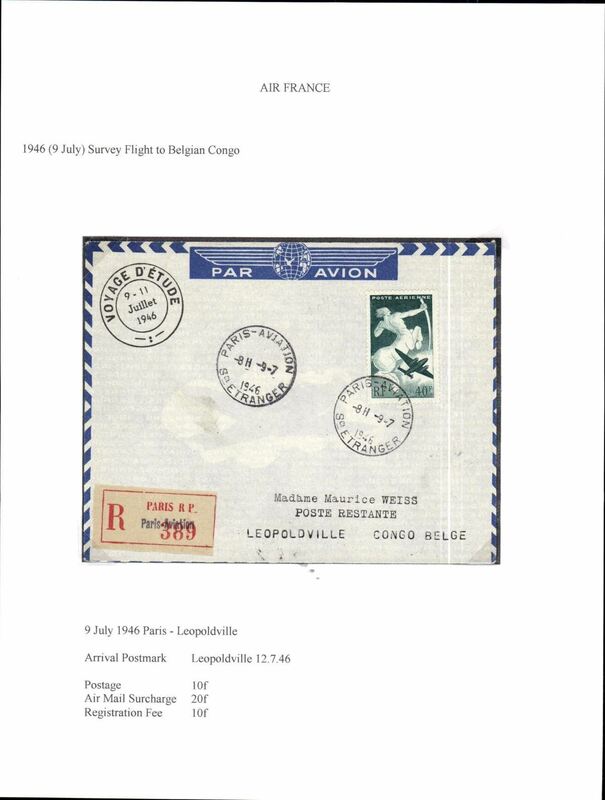 WWII censored airmail Toulouse to Jadotville, Belgian Congo, bs 28/6.via Marseille Gare Avion 5/6 and Elizabethville 27/6, franked 2F50 overseas postage and 9F air, canc Toulouse cds, sealed plain brown censor tape tied by black 'Censure Congo Belgique' censor mark. Interesting wartime item with good routing. Image. 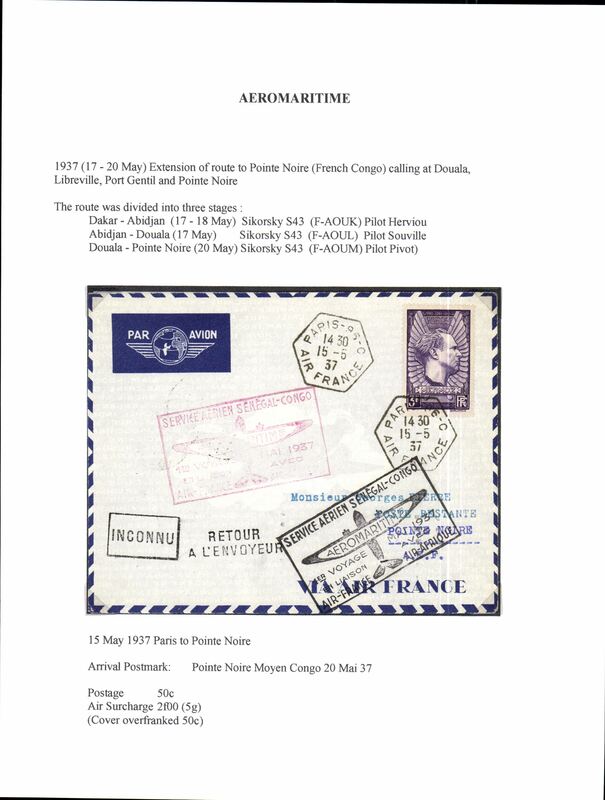 Vichy France to French Cameroons, WWII dual censored imprint etiquette airmail cover franked 3F50 canc Pyrenees Orientalis cds, bs Douala 2 Dec 40, sealed Vichy B&W 'Controle Postal Militaire' censor tape tied by black lozenge 'Overt/W 422/L'Autorite Militaire' censor mark applied to mail directed abroad, also black double ring 'Controle Postal/Territoire du Camroun/Commissopn A' and black A/2 in cicle Cameroons censor marks. The Armistice between France and Germany was signed 22 June 1940 one day after this letter was posted. A super WWII item. Codos survey flight in "Ville de St. Pierre", Marseille to Diego Suarez, Madagascar, bs 14/11, via Biizerte and Djibouti, to reorganise France-Madagascar air services. Only 63 covers carried to Diego Suarez. 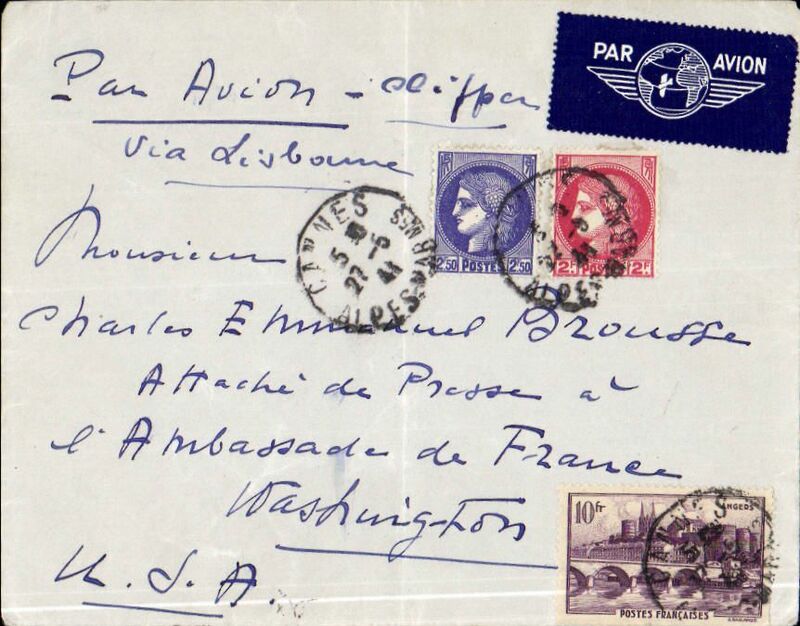 WWII uncensored airmail, Cannes to Washington, DC, airmail etiquette cover with Hotel Savoy logo on flap, addressed to the Press Attache at Vichy French Embassy, Washington, franked 14F59, ms 'Par Avion - Clipper/via Lisbon'. The attache came under the influence of British spy CYNTHIA - see A Man Called Intrepid, The Secret War 1939/45, pp 337-339. Amy Elizabeth "Betty" Thorpe (22 November 1910 – 1 December 1963) was, according to William Stephenson of British Security Coordination, an American spy, codenamed "Cynthia," who worked for his agency during World War II. Thorpe used the access gained by her romantic relationships to obtain codes from the Vichy French embassy in Washington which assisted the Allied invasion of North Africa. A great WWII item. 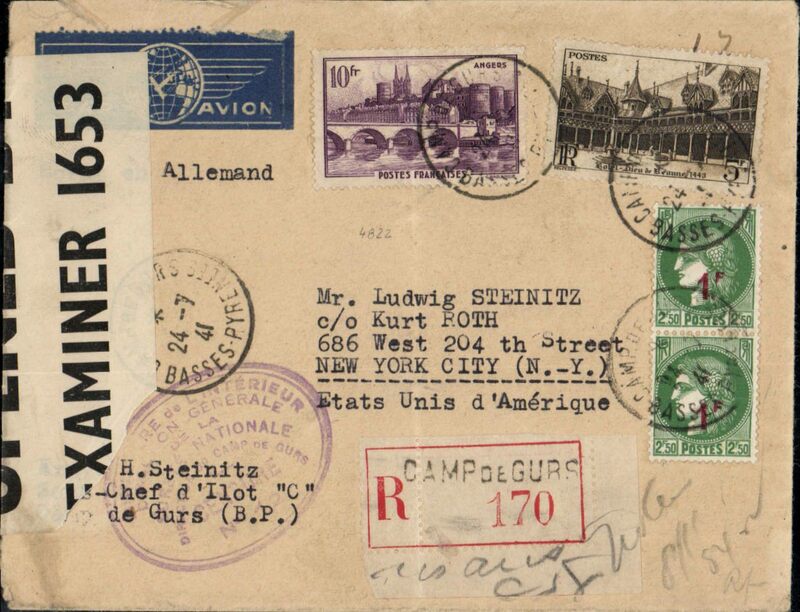 World War II political prisoner of war northern trans Atlantic airmail from Vichy France internee camp, Gurs to New York, bs 10/8, plain registered Camp de Gurs label cover, franked 17F (12F air surtax, 2F50 registration fee & 2F50 ordinary), canc 'Gurs/Basses Pyrenees' cds, large oval camp censor mark, airmail etiquette, opened on arrival and sealed US OBE 1653 censor tape. Addressees name suggests writer may have been a Jewish internee. Pיtain and the Vichy regime collaborated with the German occupation and approved raids to capture Jews and others considered "undesirables" by the Germans in both the northern and southern zones. 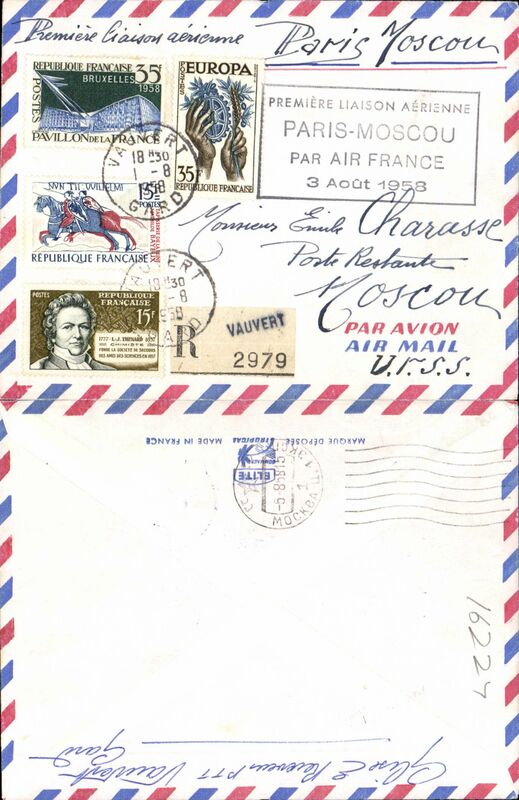 Uncensored WWII transatlantic airmail from Vichy France to Mexico, bs 22/8, via Lisbon 10/8, airmail etiquette cover addressed to Sinola, Mexico, franked 2F postage and 17F air, ms 'Par Clipper'. Good routing, see image. 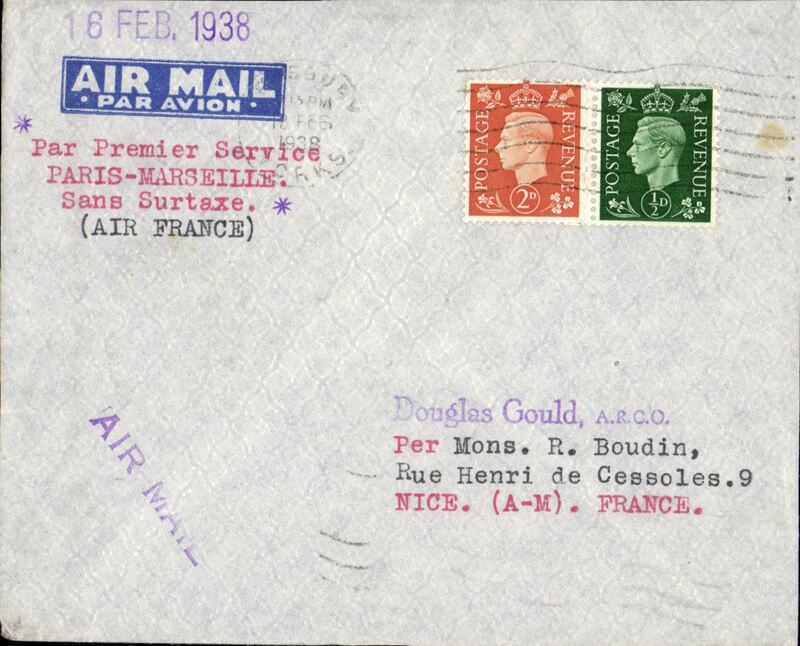 Dual censored WWII airmail from Vichy France to England, plain cover franked 2F50 postage and 1F25 air, canc Ceyrat cds, sealed by French censor tape at Marseille and GB censor tape OBE 1119, ms 'Par Avion' cancelled with Marseille black double bar Jusqu'a. Image. 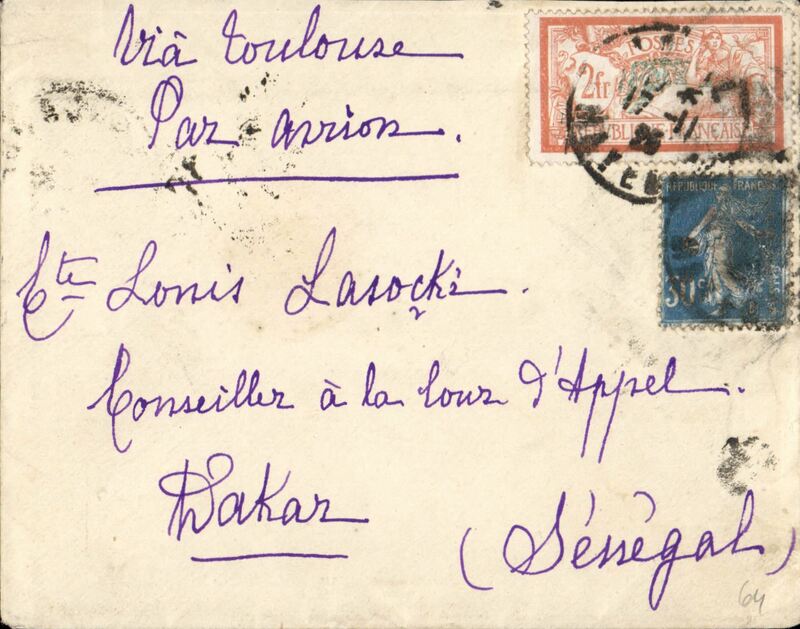 WWII uncensored airmail Marseille to Lome, Togo, bs 15/2, franked 1F50 overseas postage and 3F50 air, ms 'AoF', likely Reseau Aerienne Francaise to Dakar, then Aeromaritime to Lome. Uncommon wartime destination with interesting routing. Image. 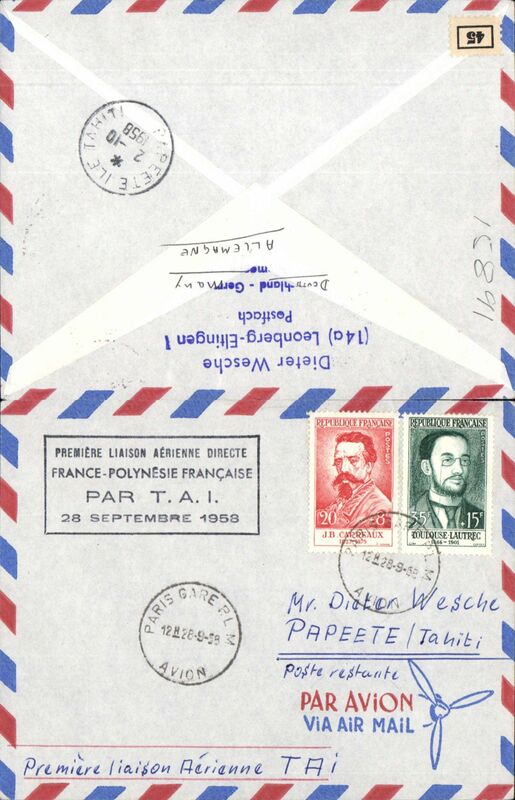 WWII censored airmail France to French Congo, Lussac Les Chateaux to Pointe Noire, via Cotonou 21/3 and Brazzaville 1/5, franked 4F overseas ordinary + 4F50 airmail surcharge, sealed 'Controle Postal/ France Libre Afrique Francaise' censor tape tied by pointed oval ‘Ouvert Par L’Autorite Militaire’ censor mark, also black circular ‘Afrique Territorial Francaise' and small 'A/3' in circle censor marks. nice routing. Image. 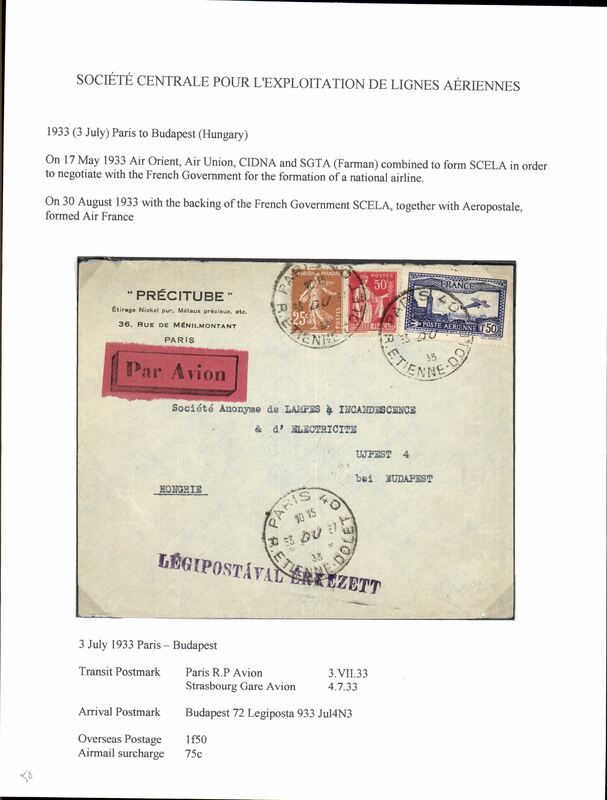 WWII airmail communication between Occupied France and Algeria, brown/cream 1F20 Formula Card, uncancelled bearing uncommon 'Bordeaux Gare Avion /Surtaxe Aerienne/le 16.6.42, frs 1' cachet, typed 'Par Avion', with message verso dated 13 Juin 1942. 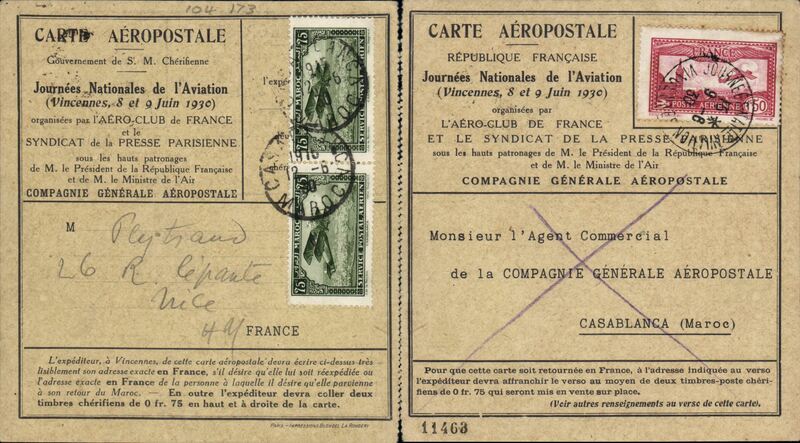 From June 1940 to November 1942 Formula Cards had to be used in France.Image. 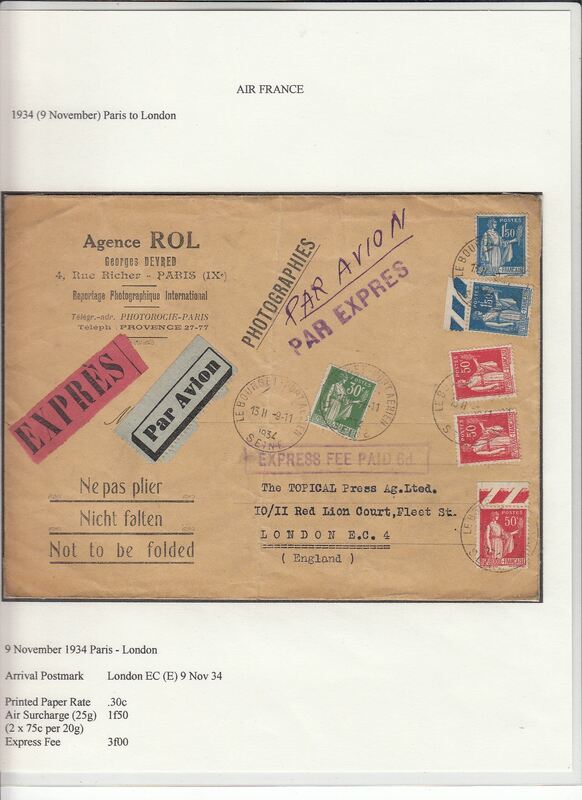 Censored WWII airmail from Vichy France to England, airmail etiquette and 3x 2F stamps tied by Lyon/19th Sep/42 cds, sealed by GB PC90 OBE 3565 censor tape, ms 'To Marseille et Lisbon, by rail to Lisbon then by BOAC to Poole/Bristol.. Correctly rted 4F postage and 2F air surcharge. Image. 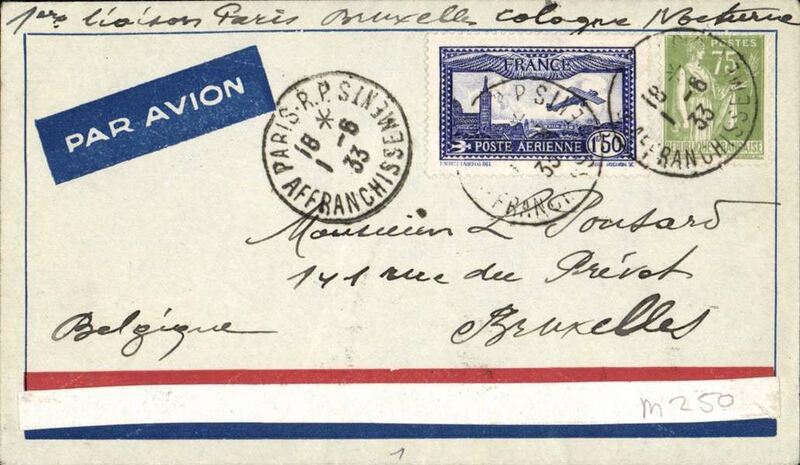 Paris Musee Galliera, 'Exposition Philatelique-la Poste Aerienne-Paris Octobre 43', Paris special mail to Mozambique, bs 15/10/45, via Lisbon 1/11/43, registered (label) blue/light grey souvenir cover franked 50F30, canc special Exhibition postmark, red/cream Expostion vignette, red 'Affranchi par Expediteur' and 'Priere de retourner a l'expediteur apres 8 jours' hand stamps, black/grey airmail etiquette, purple framed Cape Town - Kaapstaad/Released by Censor" censor mark on front. HELD FOR THE DURATION OF THE WAR - see 15/10/45 arrival ds. Also has black octagonal 'Lisboa/24 Jan 46/Central' postmark applied when finally returned to sender. Super WWII item. Paris, Musee Galliera Expo souvenir card, franked 1f50+3F50. canc special Expo cachet. 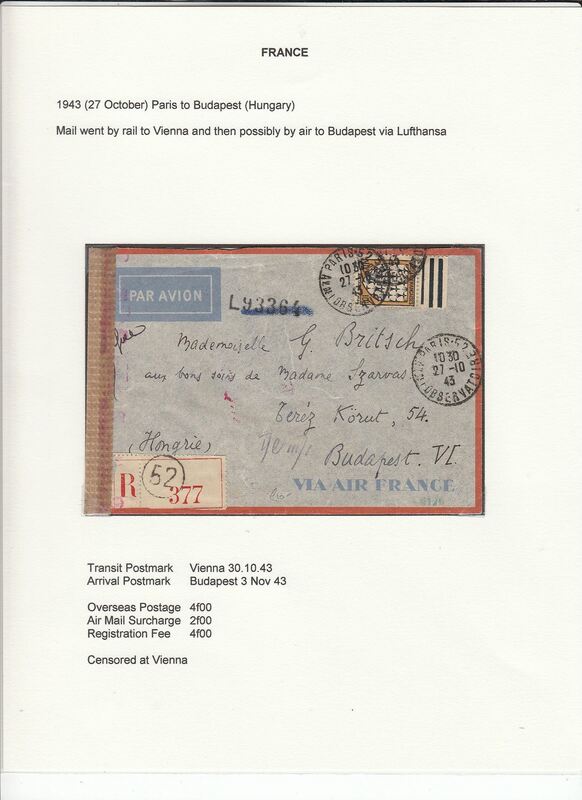 WWII censored airmail, Paris to Budapest, bs 3/11, via Vienna 30/10, reg (label) Air France grey/orange border envelope, correctly rated 10F (4F overseas postage, 2F air mail surcharge and 4F reg fee), sealed plain brown censor tape applied in Vienna. An exhibition quality cover written up on display page with nice route, airline carrier and postage rate documentation. 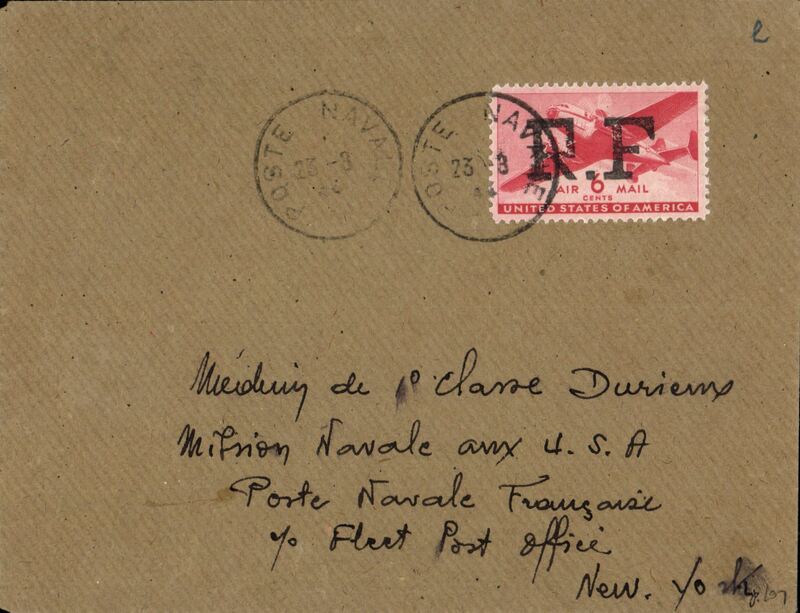 WWII uncensored Naval Post airmail, Paris to New York, addressed to Mission Navale aux USA/Poerte Navale Francaise, plain cover franked USA concessionary rate for airmail 6c air opt 'R.F. ', canc 'Poste Navale/23-8/44'. The Naval Post is responsible for the shipping, receiving, sorting, routing and distribution of mail to naval personnel. From the beginning of 1940 the date stamps of coastal offices no longer bear any indication to determine the original office of the letter. Interesting. Image. 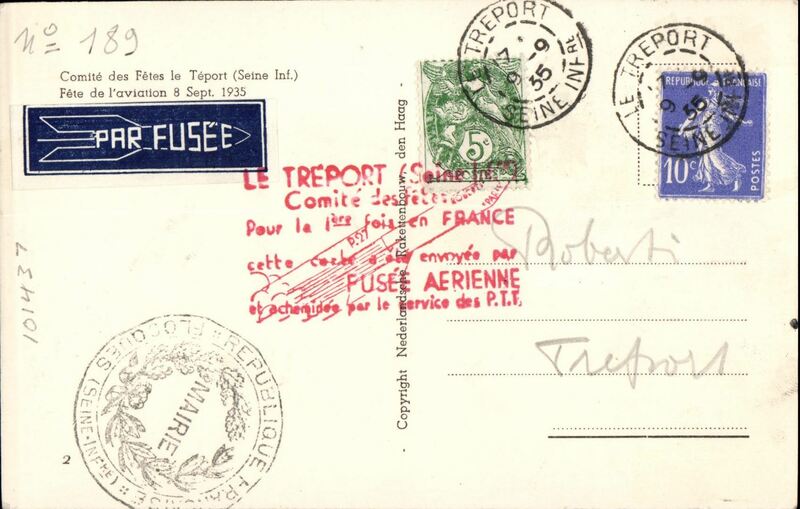 Official 'Postage Paid/Taxe Percue' airmail cover from 'Minstre Des Postes, Telegraph et Telephone' to New York, bs 19/5/45, canc Bureau du Courrrrrier Officiel Paris/17/5/45, red oval "O.A.T." 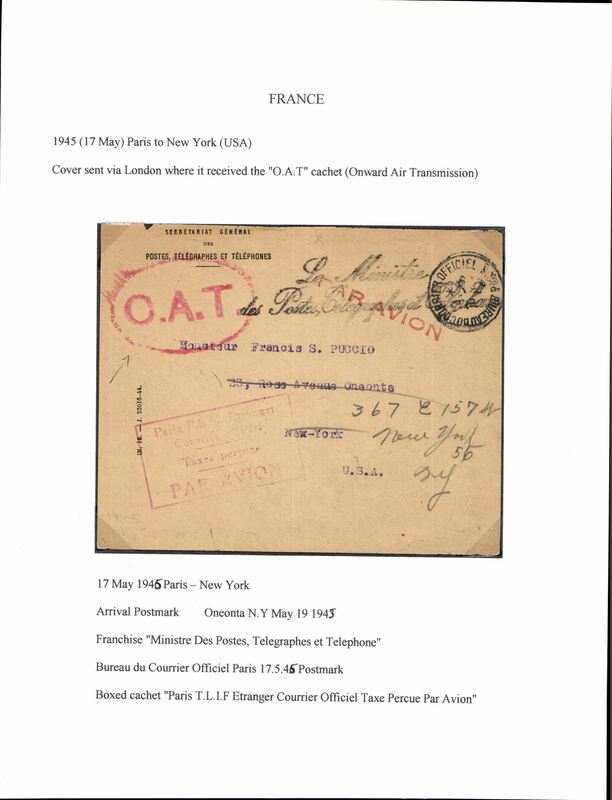 cachet applied in London for onward air transmission to New York, red framed cachet "Paris TLIF Etranger Courrier Officiel Taxe Percue Par Avion". Written up on exhibition page with account of the route taken, and the ordinary and airmail surcharge rates which were applied to that item. Special military flight, Paris to Saigon, "Sans Surtax", b/s, only 43 flown. 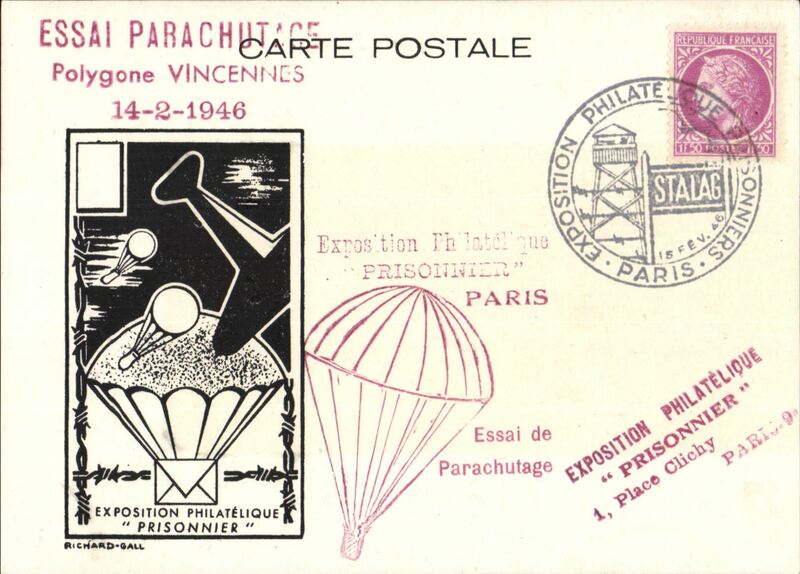 Paris 'Prisoner' Philatelic Expo, parachute mail souvenir card with imprint cachet, franked 1F50 canc special 'Stalag' Expo cachet, also red 'parachute' cachet and 'Essai de Parachutage' hs. 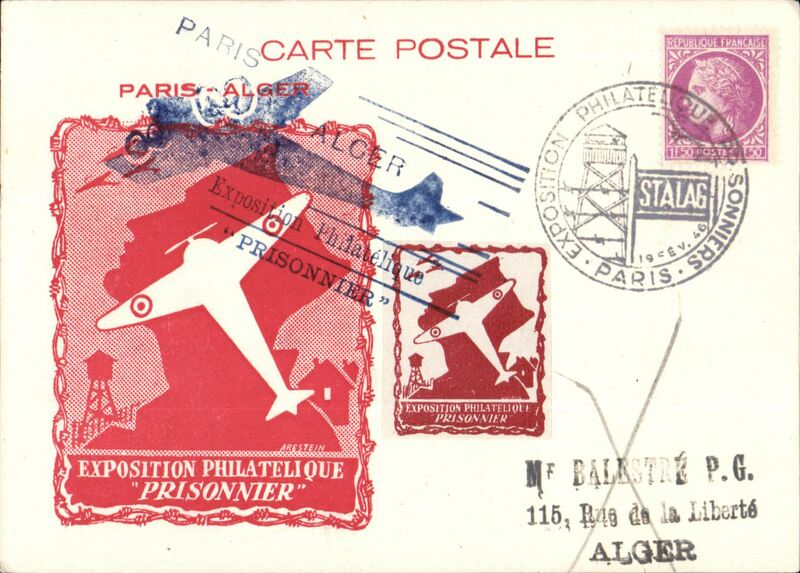 Paris 'Prisoner' Philatelic Expo, parachute mail souvenir card with red imprint cachet, franked 1F50 canc special 'Stalag' Expo cachet, also brown/white Expo vignette and large blue 'Paris-Alger' Expo cachet. 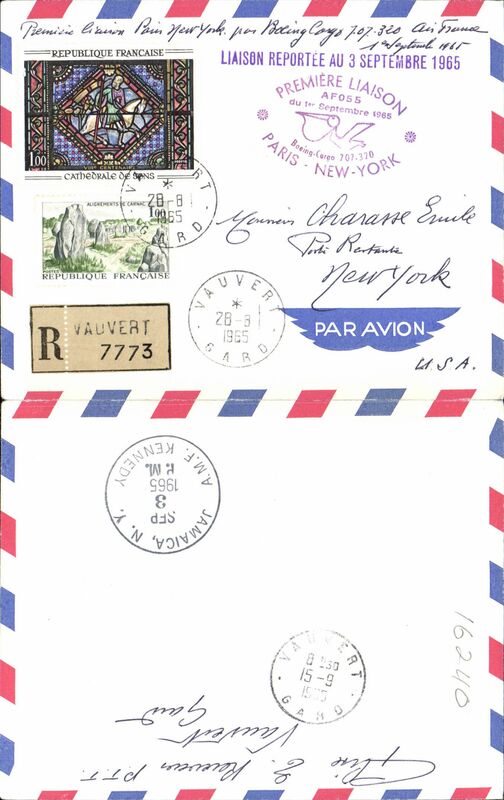 Air France, F/F Paris to New York, bs 25/6, registered (label) airmail etiquette cover franked 30F, blue framed flight cachet. Also orange/cream proof of the associated commemorative stamp inscribed "1ier Laison Aerienne Francaise/Paris-New York". 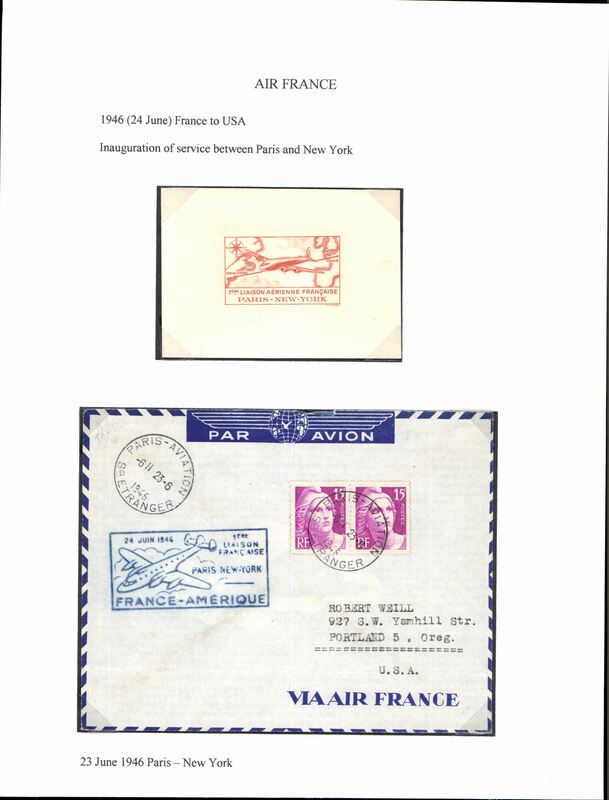 Air France, F/F Paris to New York, no arrival ds, airmail etiquette cover franked 30F, blue framed flight cachet. Also orange/cream proof of the associated commemorative stamp inscribed "1ier Laison Aerienne Francaise/Paris-New York". 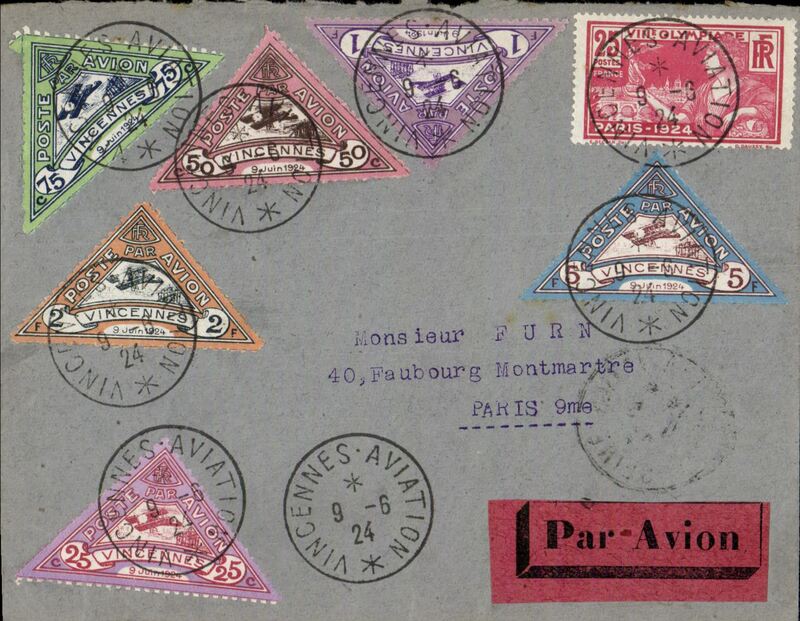 Early post WWII F/F Bron to Le Bourget, attractive cover franked 1F50 special red and black framed Expo cachets, one tying two different Expo vignettes, and the other tying a large 'Spad biplane with Fronvall head and shoulders inset' vignette, and large violet Air France/Escale de Bron hs. A most attractve item, see image. 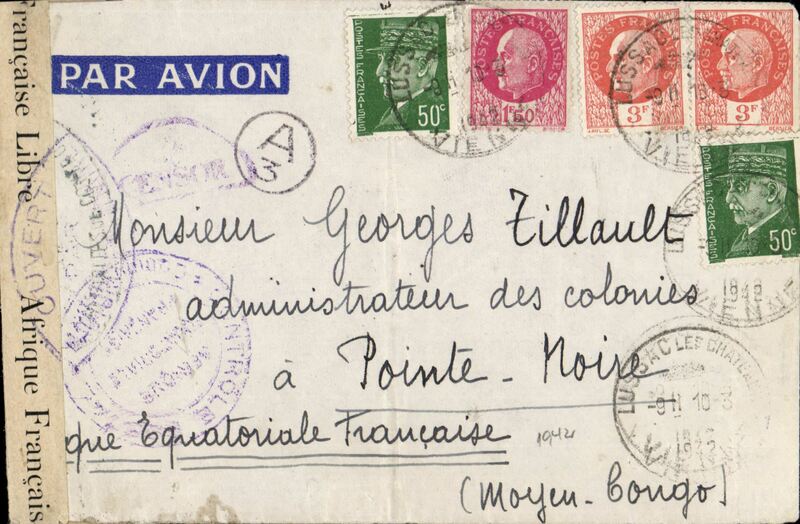 Post WWII resumption of France-Belgian Congo airmail service, Air France survey flight to the Belgian Congo, bs Leopoldville 12/7.registered (label) airmail etiquette cover franked 40F (10F postage, 20F airmail surcharge, 10F regn fee), black circular 'Voyage D'Etude' flight cachet. Exhibition quality cover written up on display page. 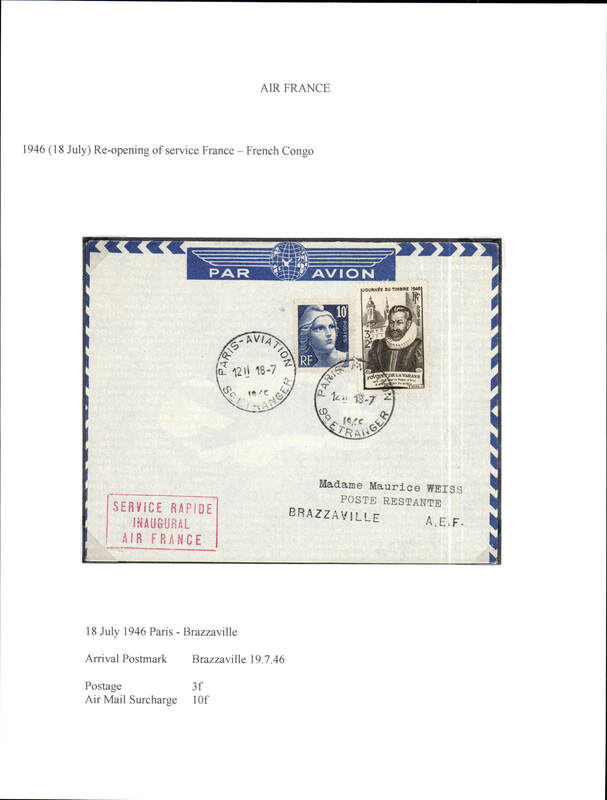 Post WWII resumption of France-Belgian Congo airmail service, Paris to Leopoldville, bs 19/7, airmail etiquette cover franked 13f (3F postage, 10F airmail surcharge), red framed 'Service Rapide/Inaugural/Air France'. Exhibition quality cover written up on display page. 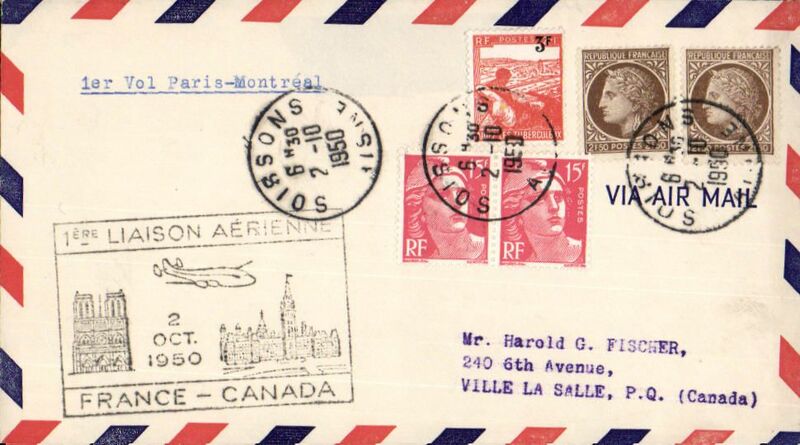 Air France F/F Paris to Montreal, bs 3/10, plain cover franked 15c, black framed flight cachet, typed "1er Vol Paris-Montreal". 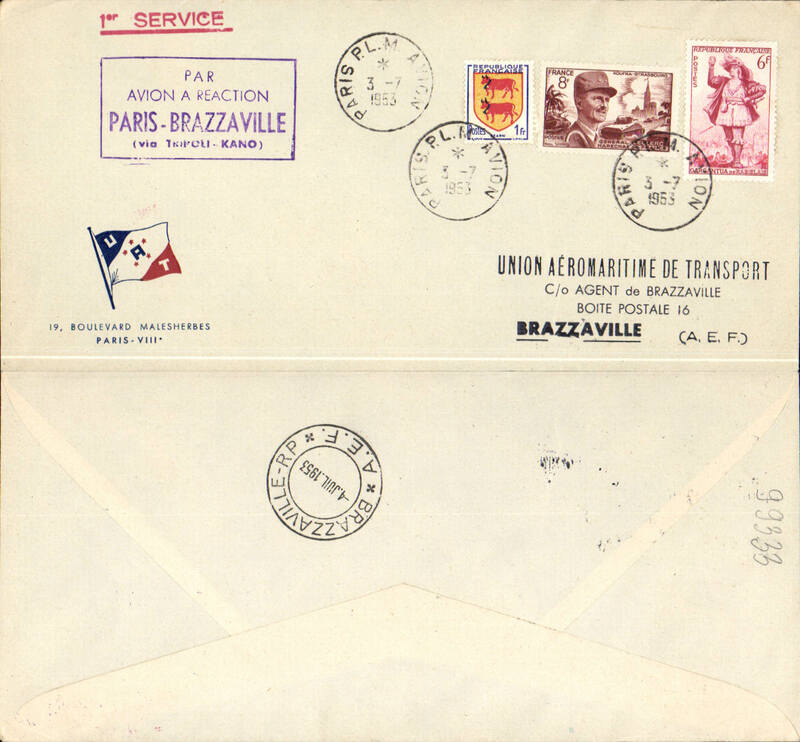 UAT Aeromaritime, F/F Comet 1, Paris to Brazzaville, bs 4/7, fine strike violet boxed Brazzavile-Paris (via Kano-Tripoli) flight cachet, red/white/blue UATcompany cover with flag logo in lower lh corner, franked 15F. 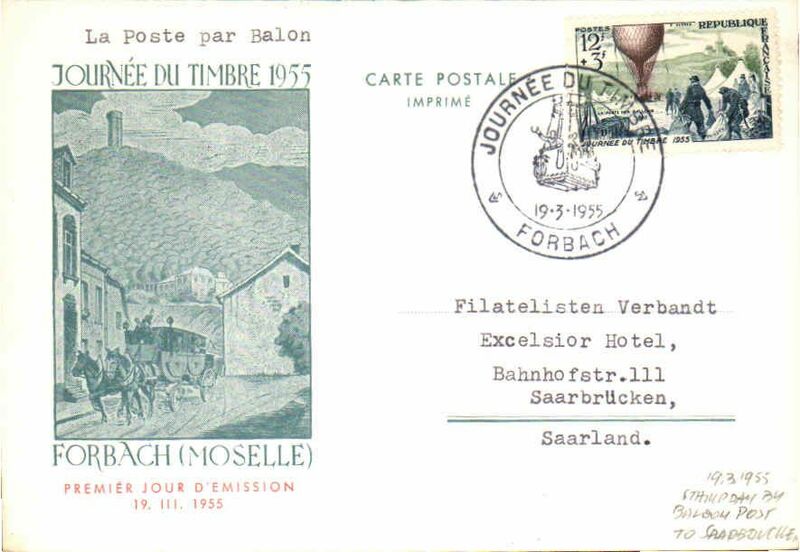 Balloon flight, Forbache to Saarbruche, special depart cachet, souvenir card. Alitalia F/F Paris-Turin, cachet, b/s. Air France, F/F Paris-Moscow, b/s, first direct flight Paris-Lima, b/s, flight cachet. Transportes Aeriens Intercontinentaux (T.A.I.) F/F Paris-Papeete, cachet, b/s. First TAI direct flight Paris to Tahiti, bs 2/10, four line cachet, souvenir cover. Air France, first Caravelle flight, Paris-Istanbul, b/s, flight cachet. 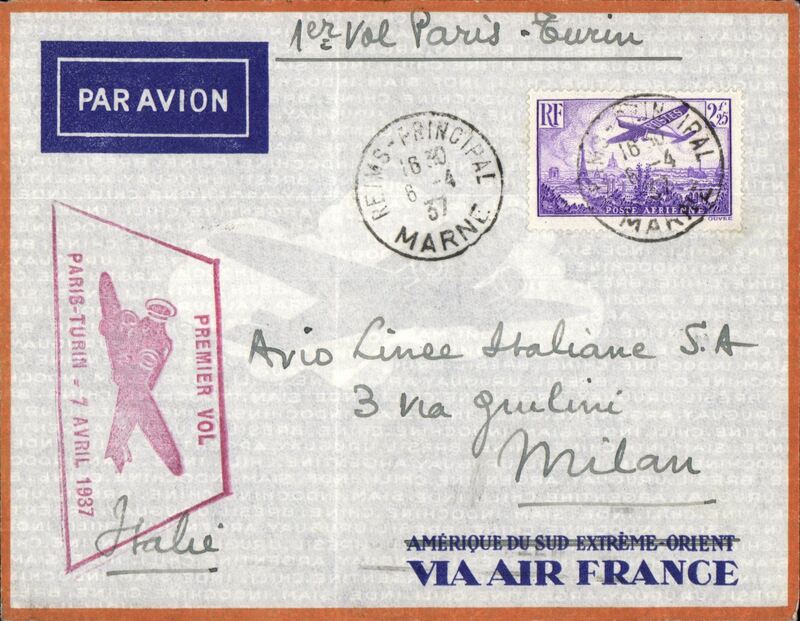 Air France, first Caravelle flight, Paris-Rome, b/s, flight cachet. Air France, F/F B707 non stop Paris-New York, b/s, flight cachet. Air France, F/F B707 Paris-Tokyo via Anchorage, b/s, flight cachet. 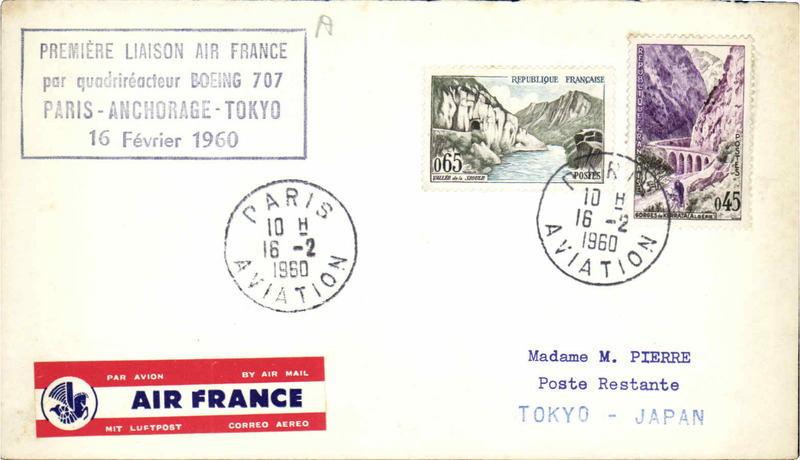 F/F B707, Paris-Tokyo, souvenir cover, b/s, Air France. Air France, F/F Paris-Moscow via Warsaw, b/s, flight cachet. 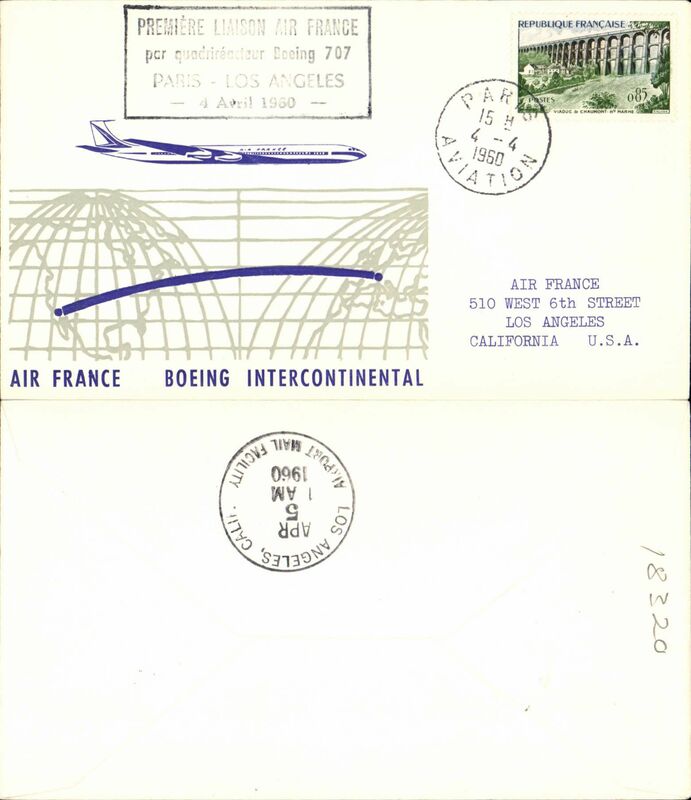 Air France, F/F B707 Paris-Los Angeles, b/s, flight cachet. 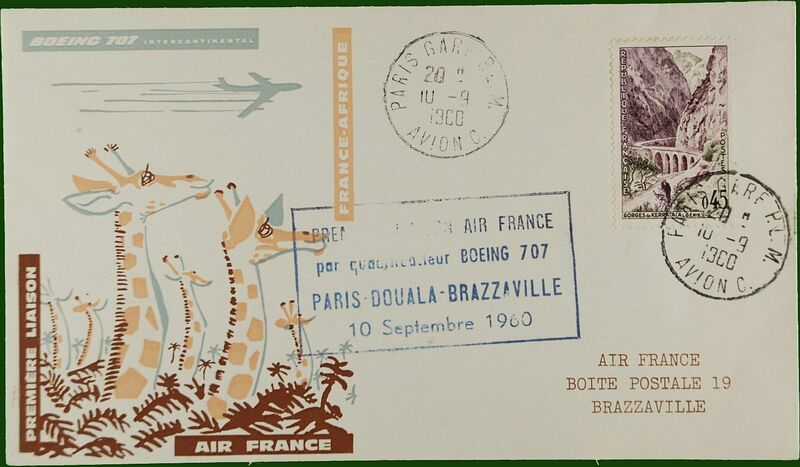 F/F B707, Paris to Brazzaville, b/s, souvenir cover, AF/Air Afrique. 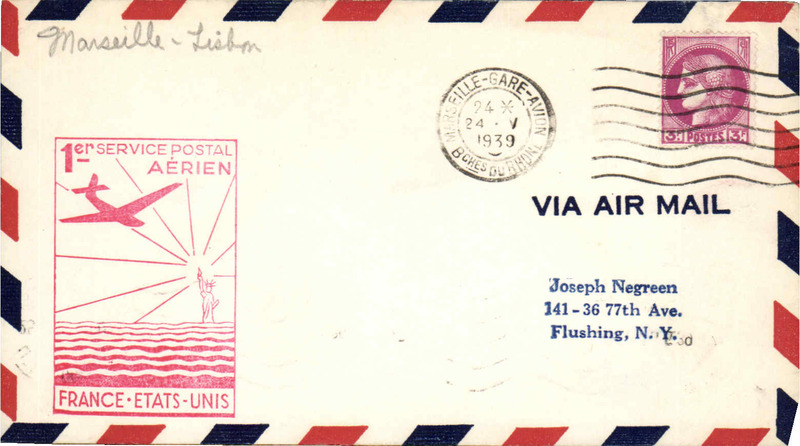 UAT DC8 F/F Paris to Southern Rhodesia, bs Salisbury 15/9, plain cover franked 1F canc Paris Aviation cds, blue four line cachet "Premier Laison/Par Jet Liner/Paris-Salisbury/14 Septembre 1960", attractive Berck blue/pink vignette on front. An attractive and uncommon item. First DC8 Paris to Saigon, b/s, cachet, TAI. Air France, F/F B707 Paris-Tehran en route to Saigon and Hong Kong Kong, b/s, flight cachet. Air France, F/F B707 Paris-Karachi, en route to Saigon and Hong Kong, b/s, flight cachet. Air France, F/F B707 Paris-Tokyo via Italy-India-Indochina, b/s, flight cachet. 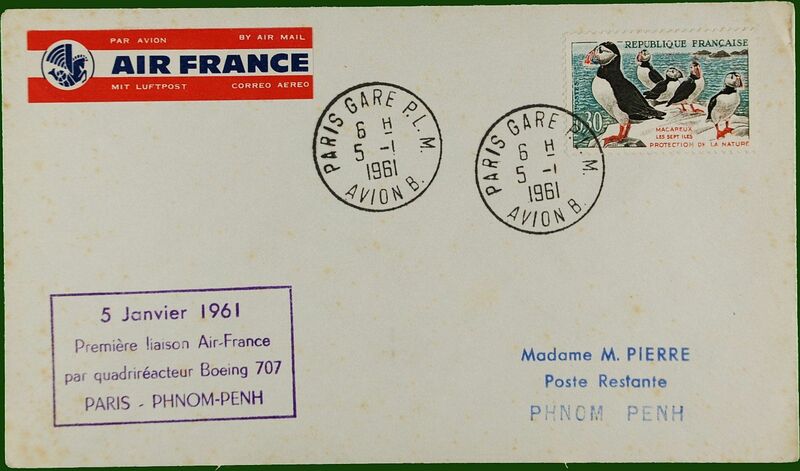 First Boeing 707, Paris to Phnom-Penh, cachet, b/s, Air France. F/F, Paris-Tokyo , cachet, b/s, souvenir cover, JAL. Air France, F/F B707 Paris-Houston, b/s, flight cachet. 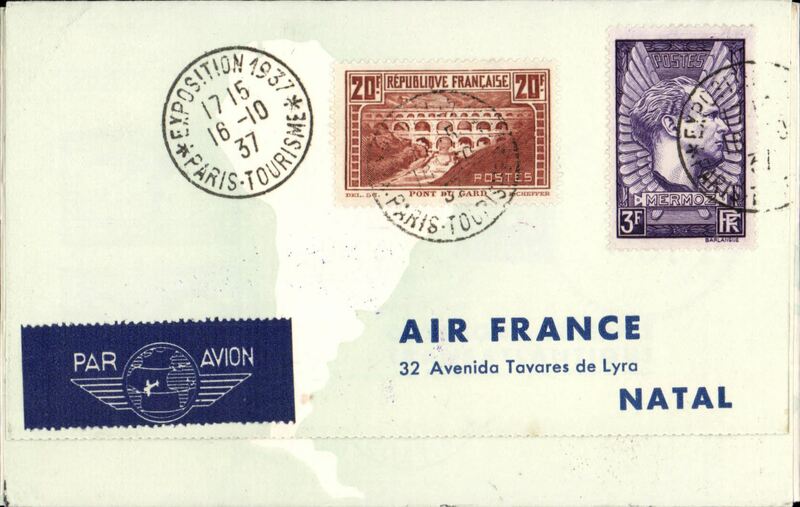 First direct flight, Paris to Rio de Janeiro, souvenir cover, b/s, Air France. Air France, first B707 cargo flight Paris-New York, b/s, flight cachet. 35th anniversary. 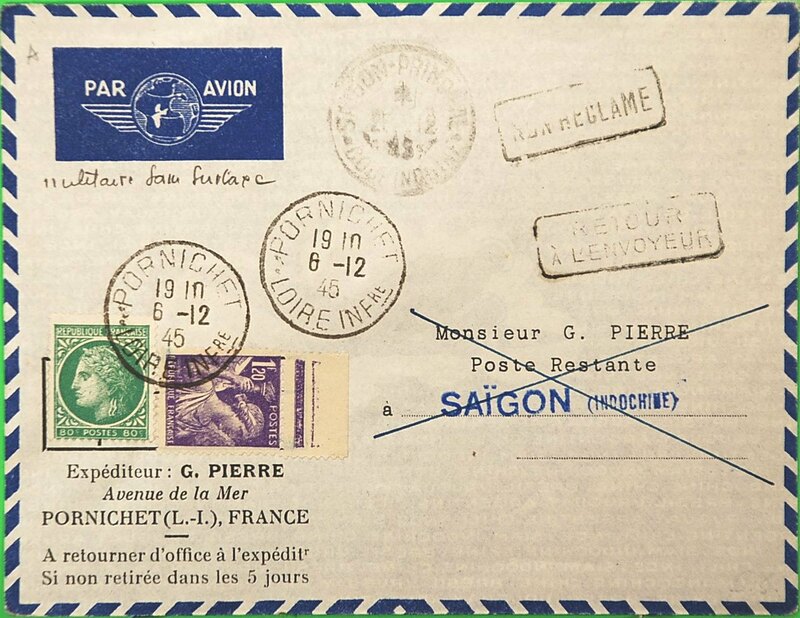 Far East service, Paris to Phnom Penh, special canc, b/s, souvenir cover, Air France. 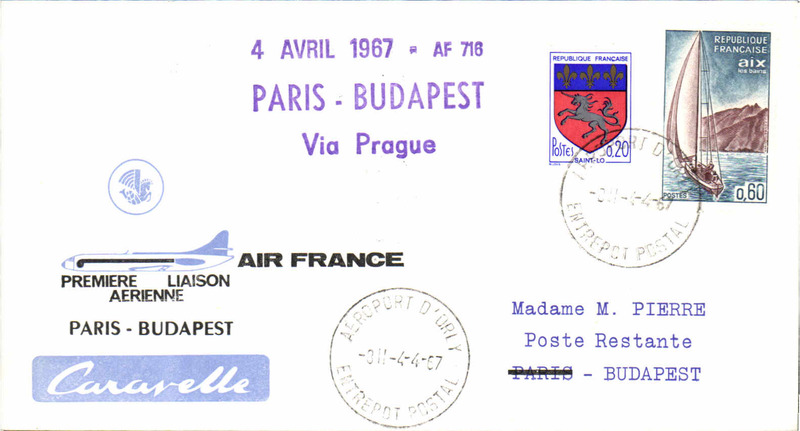 Air France Caravelle F/F Paris-Budapest, B/S, souvenir cover. 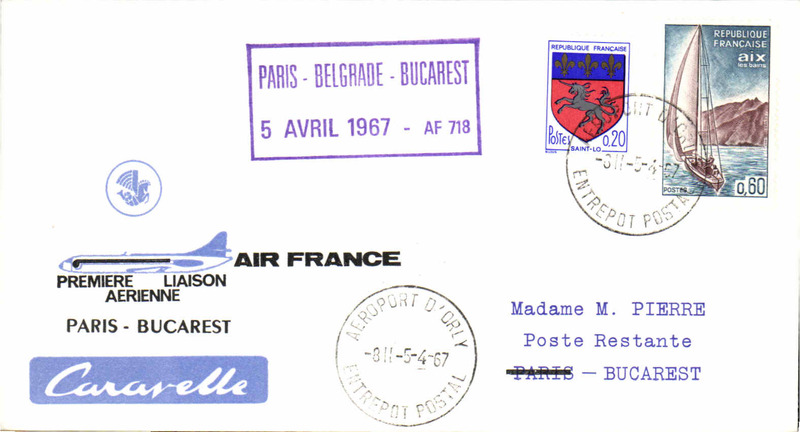 Air France Caravelle F/F Paris-Bucharest, B/S, souvenir cover. 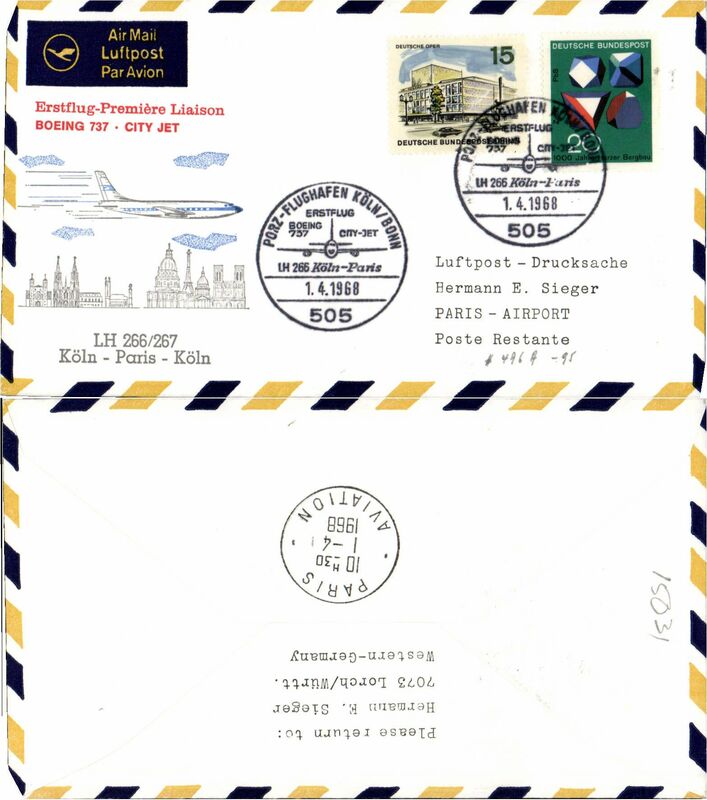 Lufthansa B737 F/F, Koln-Paris, b/s, cachet, souvenir cover. 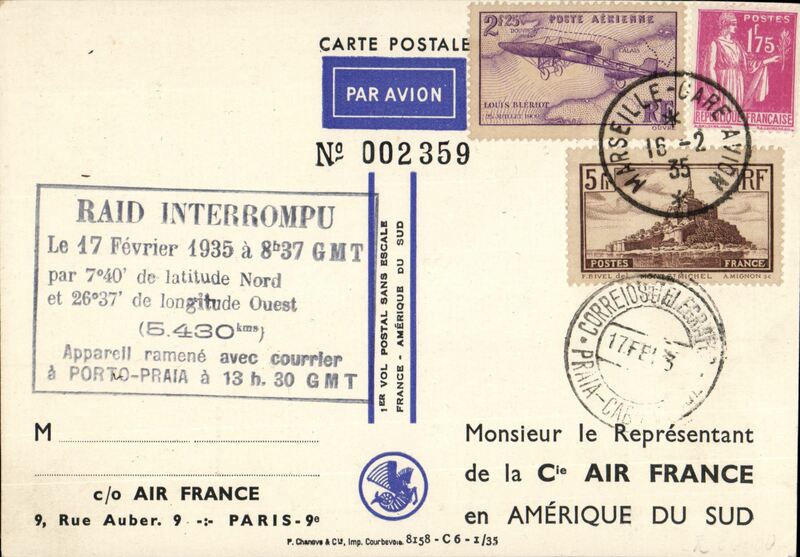 50th anniversary 1st airmail, souvenir PPC showing Bimoteur Letord 4, franked FDI 0.25F St Nazaire-Paris air stamp. 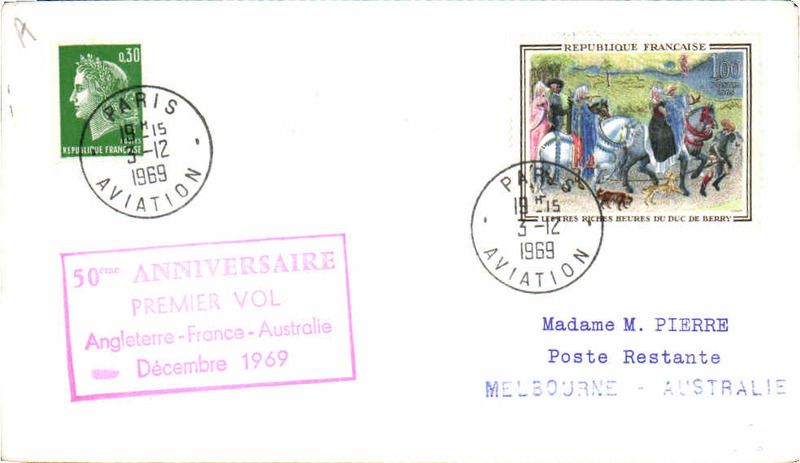 50th anniversary England -France-Australia, Paris to Melbourne, cachet, b/s, Air France. 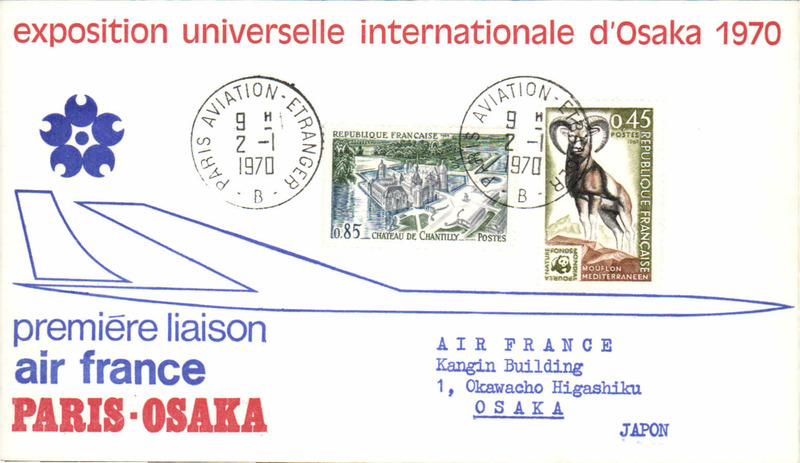 F/F, Paris-Tokyo, souvenir cover, b/s, Air France. 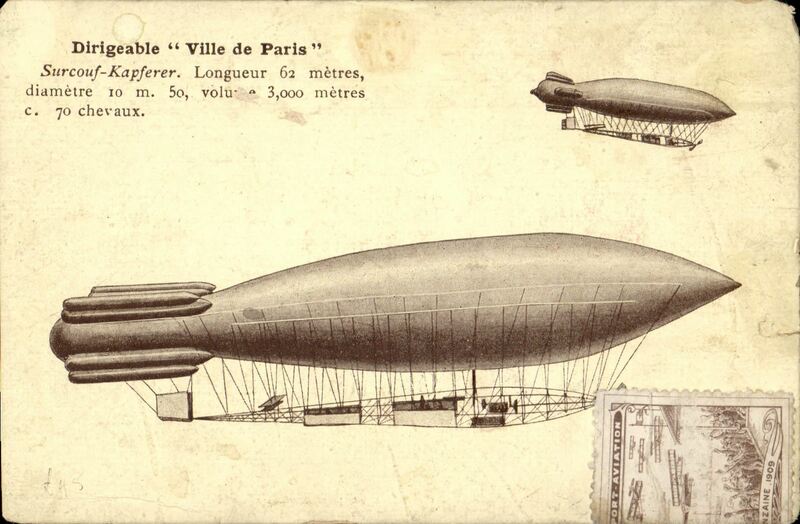 FDC French Aviation Pioneers, souvenir card franked FDI Daurat & Vanier 5f air. 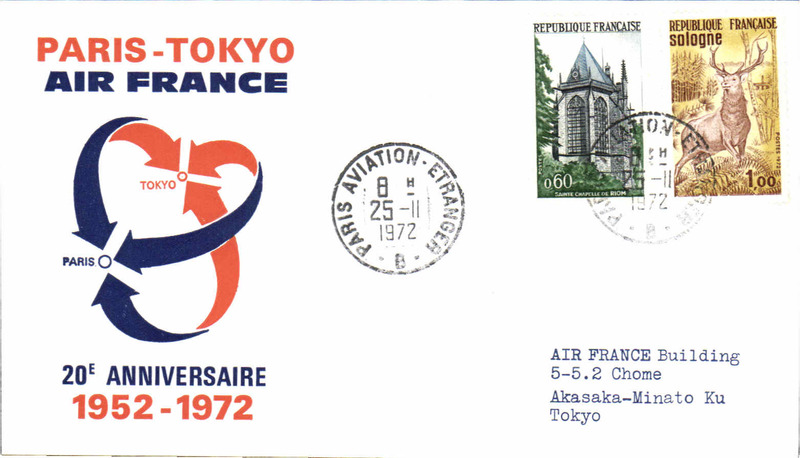 20th anniversary, Paris-Tokyo, souvenir cover, b/s, Air France. 20th anniversary. 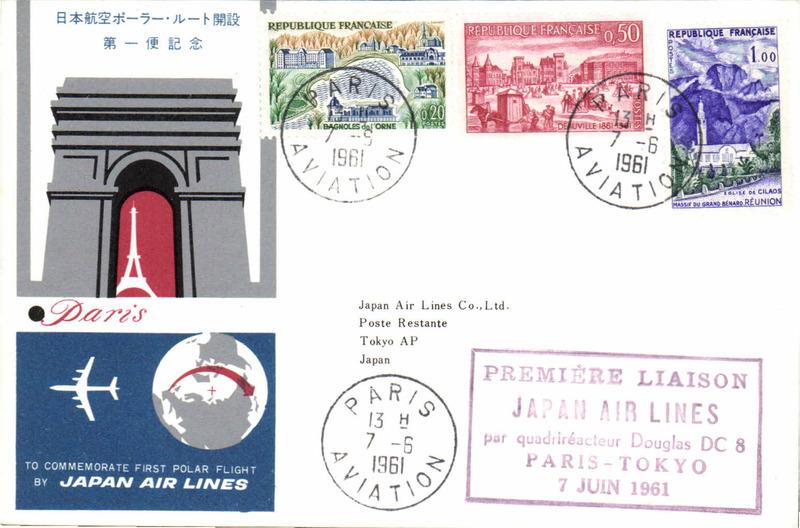 Paris to Tokyo, b/s, souvenir cover, Air France. TAP, B 747B F/F Paris to Lisbon, b/s, souvenir cover, cachet. F/F Paris-Kigali (Rwanda), b/s, cachet, souvenir cover, Air France. First scheduled flight, Le Touquet to Southampton, and return. 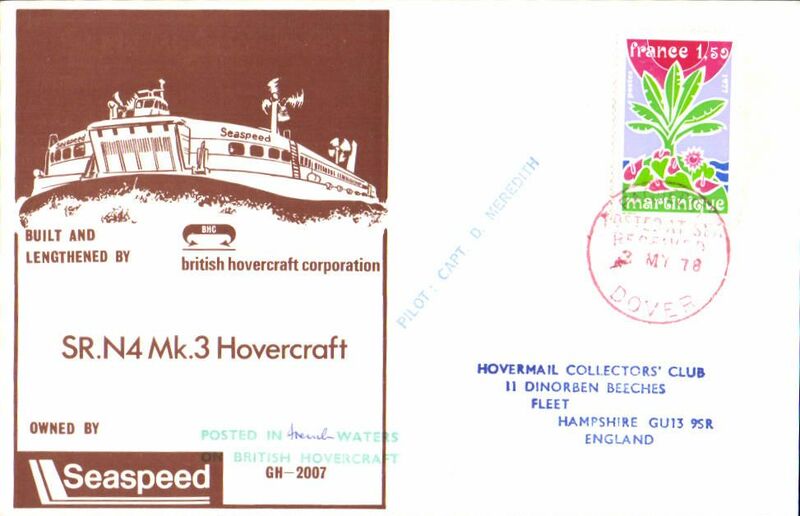 Twon souvenir covers, POA, British Island AW. 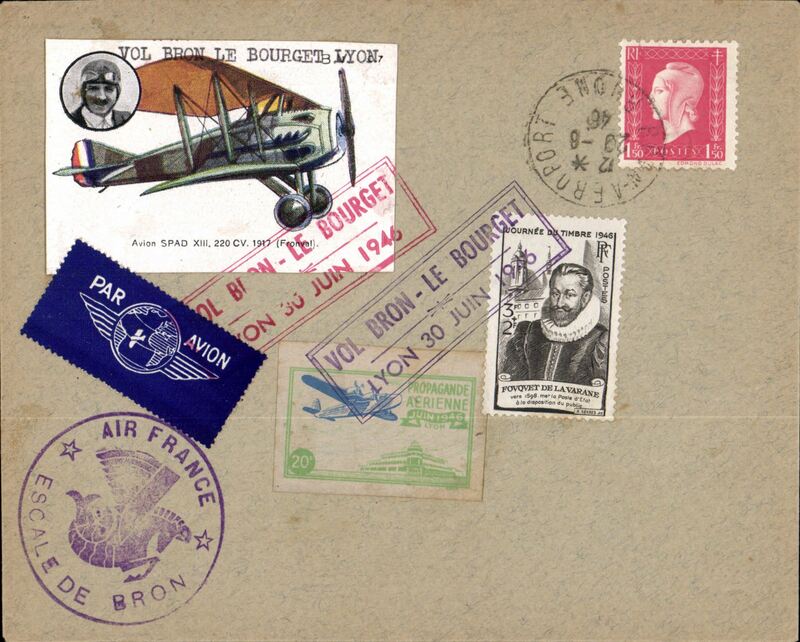 First direct flight Lyon to Lisbon, cachet, b/s, long souvenir cover, Air France. First direct flight Lyon to Port Louis (Mauritius), cachet, b/s, long souvenir cover, Air France. 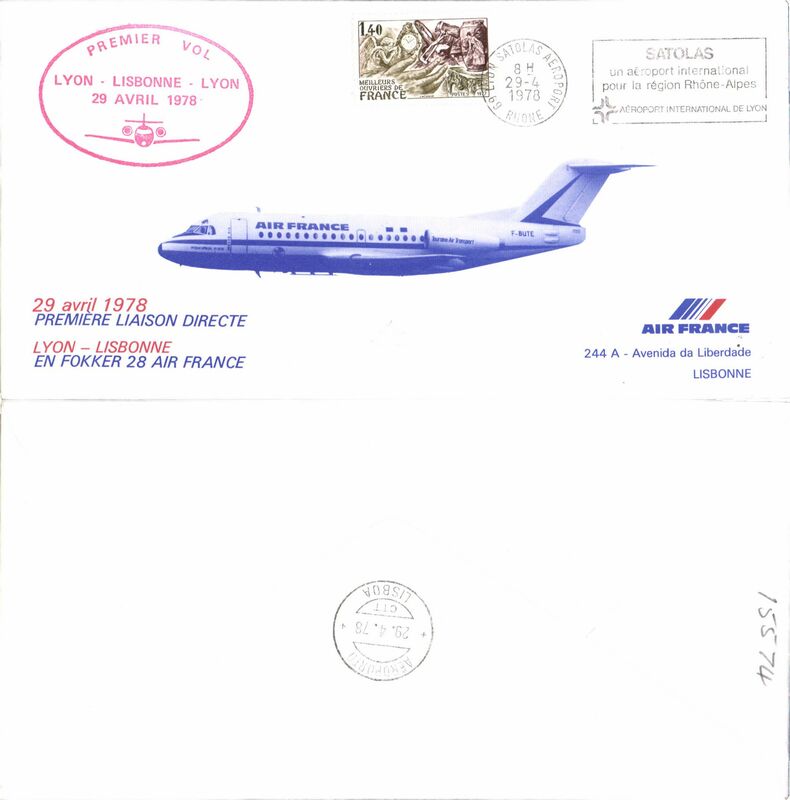 First direct flight Lyon to St. Dennis (Reunion), cachet, b/s, long souvenir cover, Air France.